Summer, the real heat of summer arrived in the Pacific Northwest this week. Temps in the high 90’s and low 100’s permeated the State of Oregon bringing with it skies……..
…..as blue as any sky you’ve every imagined. Thankfully, this summer, there has not been any large fires proximally close enough to cause smokey air, or dingy skies. The air has been clean, warm….well, hot….and easy breathe. It feels good, actually, as the humidity that can sometimes accompany the heat, is really nonexistent this time of year. Well, let me clarify that….sitting, sitting in the heat feels good….working out in it beats you down pretty quickly. This really has been a lovely summer. 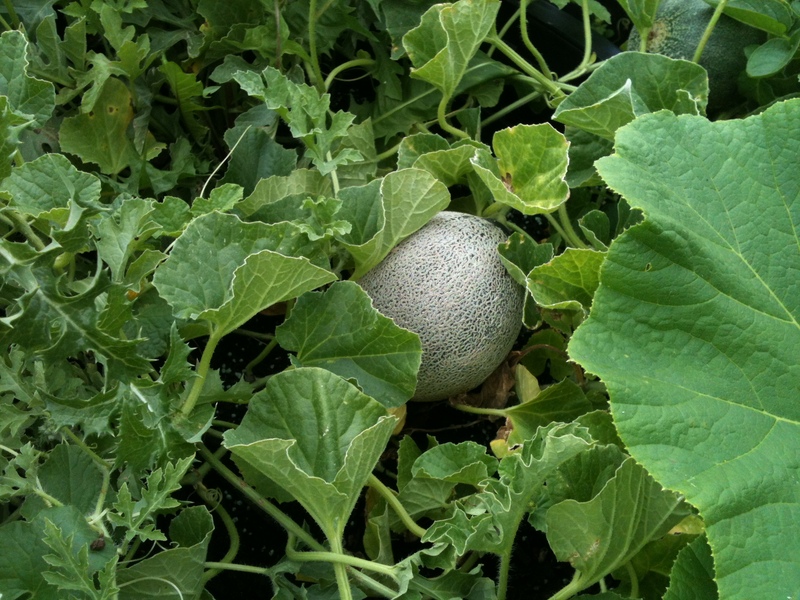 Okay….don’t laugh at my scrawny watermelon…..hahahaha!! 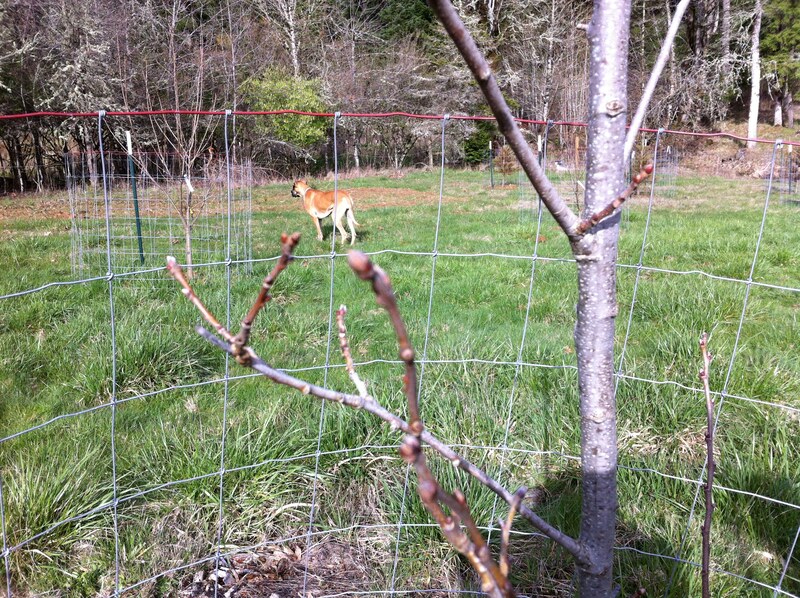 Something else arrived on the homestead this week…..something less desirable, something lying in wait, opportunistic in nature, watchful and observant….waiting for a chance. I let my guard down, and it turned it’s instinct into an opportunity…and, without hesitation, ran with it. 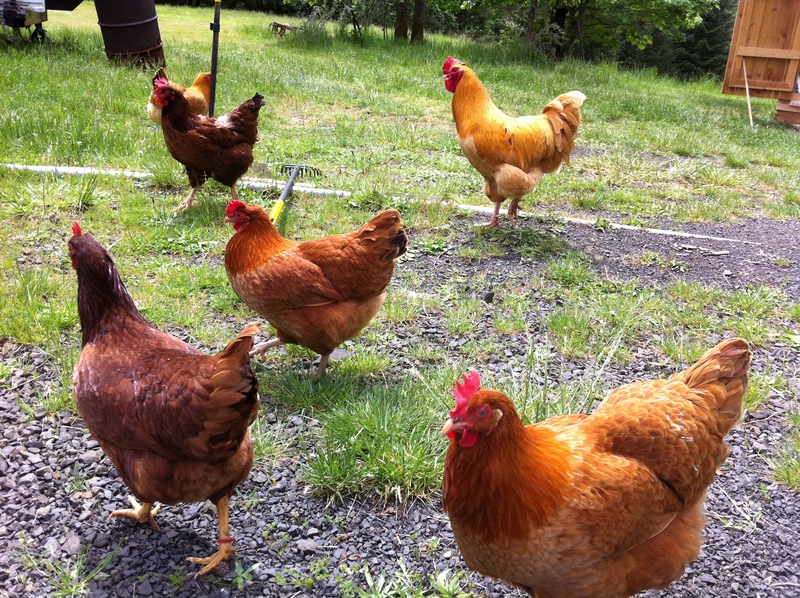 The chicken house was the intended target…..cunningly, or more like a rushing train, “It”, the predator, took advantage of my unwarranted trustfulness in what I had not yet experienced…a predator had broken into the chicken house. 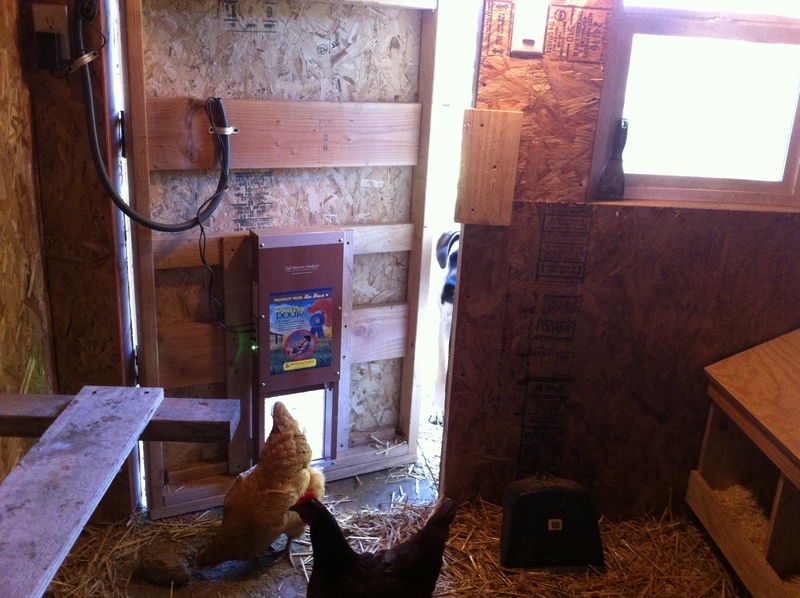 See the screen….these guys ripped that screen one day when they roagly entered the, Chickens Only, yard. 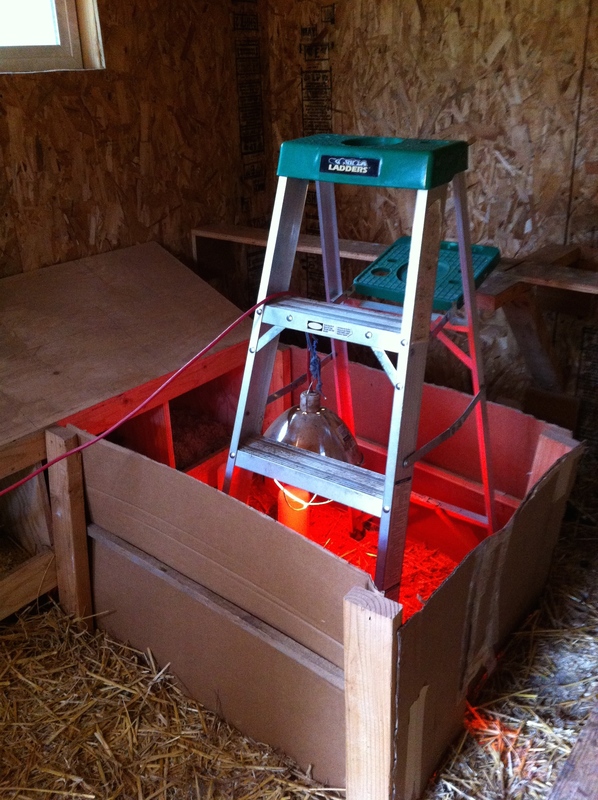 We keep the chicken feed in this area…the goats L-O-V-E chicken feed!! See the empty feeder on the ground…UGGHH!! Due to the heat, I had opened that little window, from the picture above, on the chicken house to create a little air flow through the night. One larger window we leave open in the summer, but it is covered by mesh wire (not a window screen.) This window had a screen, however, it had been torn away…..so no screen, no wire mesh. I had placed a fan in the window and held it in place by wooden dowels, thinking the sound of the fan and the supporting dowel structure would keep predators at bay. It had worked for numerous nights, but not that night. I heard commotion from the flock, it was about 2:30 a.m. It woke me up. The flock was upset. 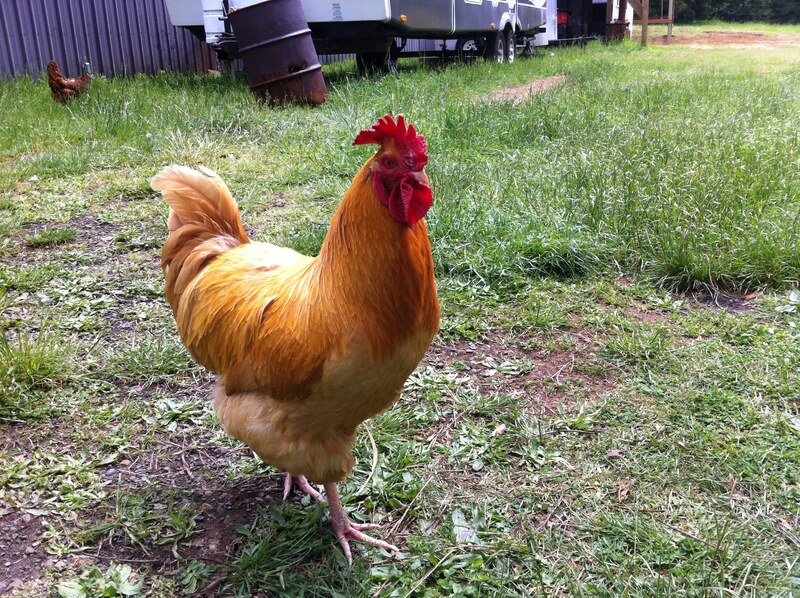 Sometimes, Benedict, our rooster will call out in the middle of the night….that is not an unusual sound. The cackling that was going on that night, was not that sound. 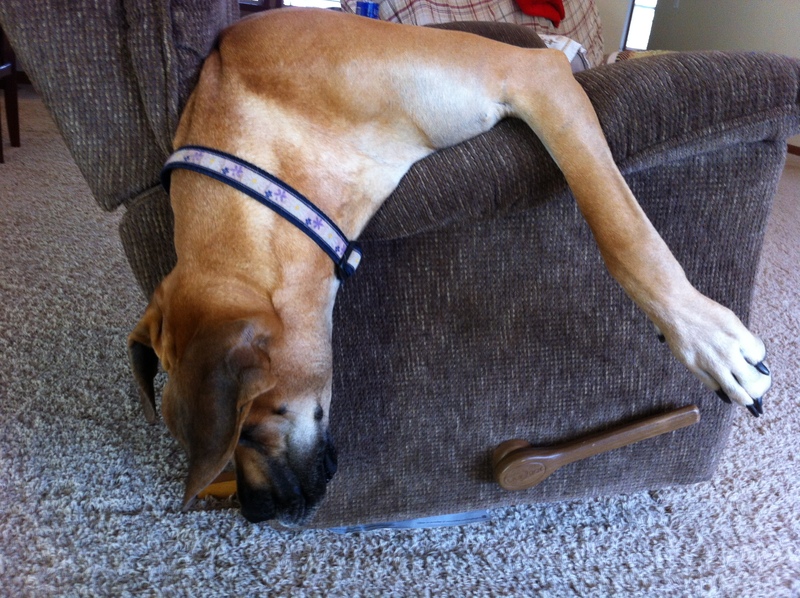 Half asleep, I got up, and listened….Penni, my Great Dane, barked just a single bark…..I was in the process of thinking, “Should I go out there?” …. I did not instinctually run out in my jammies and bare feet ….. I listened, and the sound rescinded. I listened a while longer, and all was quiet. Morning chores revealed the struggle my birds went through that night. The first clue was noticing that I did not see one hen or rooster, anywhere. Seeing the open window, no fan, or dowels remained within the open space. 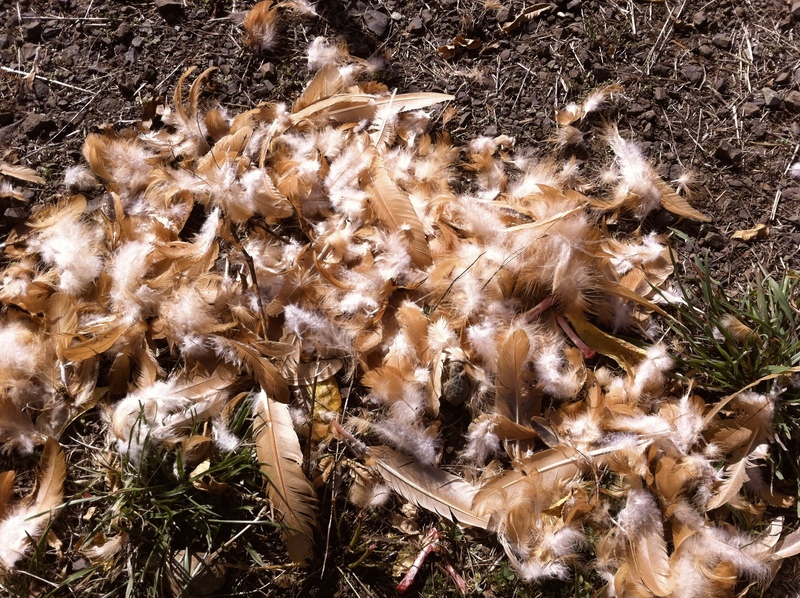 Opening the door of the chicken house….there were feathers…there were many feathers. 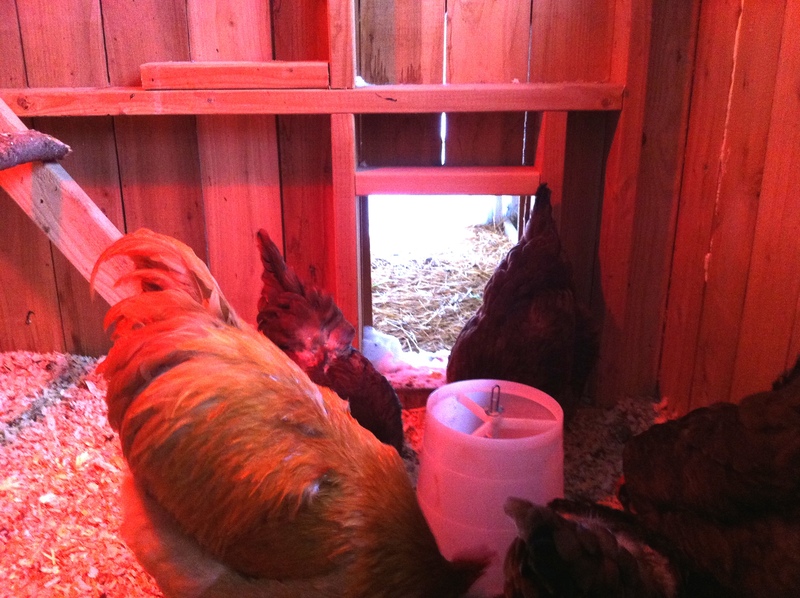 In the corner of the droppings tray lay the body of a Rhode Island Red hen. My heart sank. 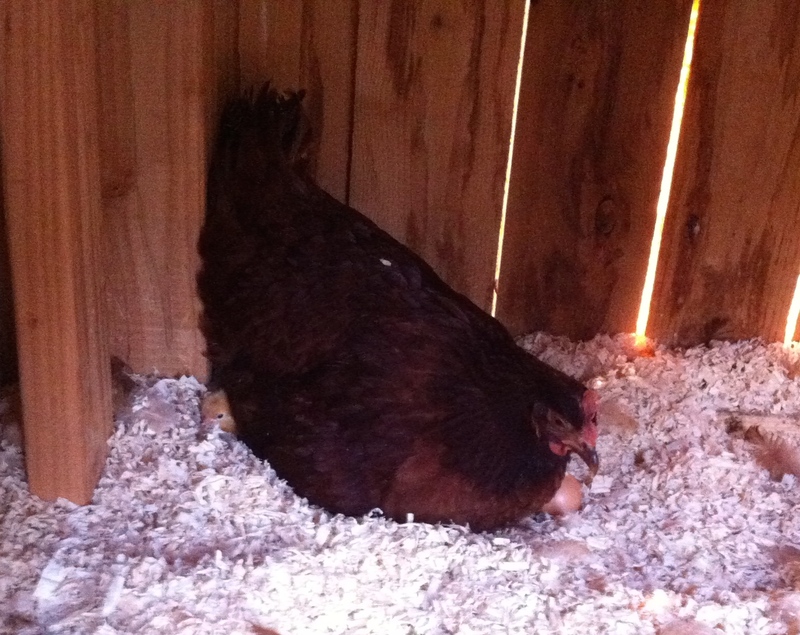 I checked her legs…..she did not have a red band so I knew it was not Chardonnay, our #1 broody hen for hatching chicks. Chardonnay is a sweet, sweet hen. I was happy to see that. So, this meant it was either, Don Pedro, or Chablis (I only had three true Rhode Island Reds at that point.) Her head and neck were gone…the rest of her body untouched, but still I knew….this was Don Pedro. 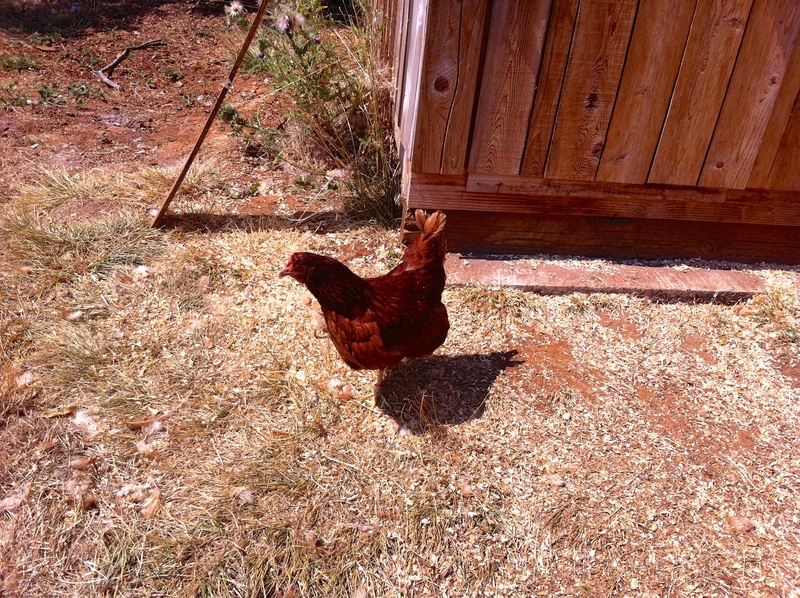 Don Pedro….hen in the foremost of the picture. 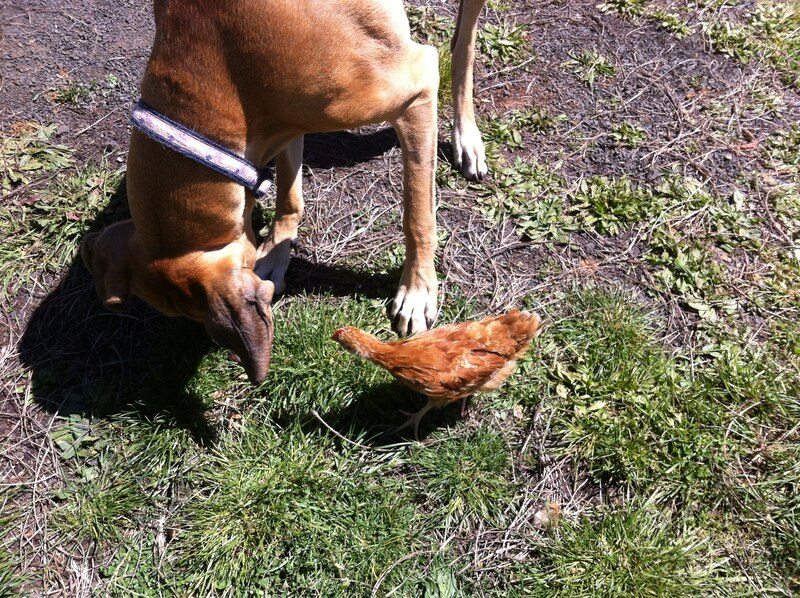 Don Pedro was the lead hen of the flock….she ruled, second only to Benedict. 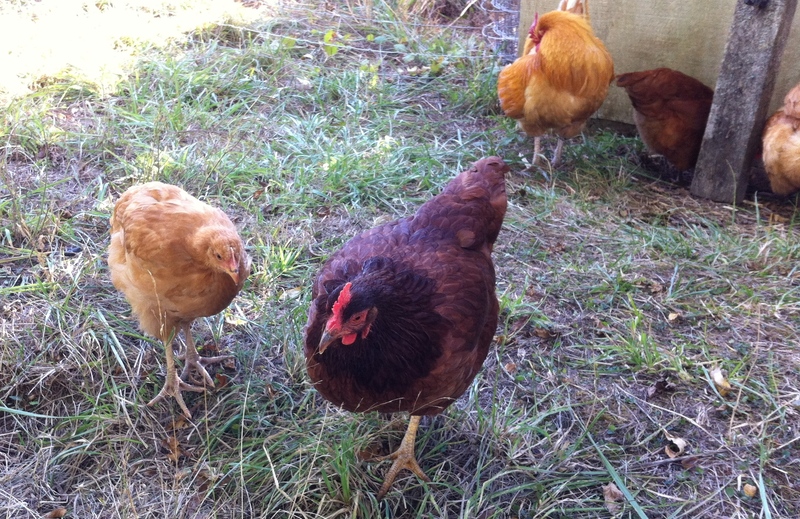 Sometimes she ruled with an iron beak, but one thing is for sure, she was respected among the other hens. We will miss, Don Pedro!! She had the largest, floppy comb of the hens, and I could always tell which of the hens were her actual offspring…they were the ones with the larger floppy combs…but none of them as grand has hers. RIP, Don Pedro. It seems that this was probably the work of a racoon. There were suttle foot prints among the signs of the struggle within the sand of the droppings tray. Also, a Google search told me that if just the head and neck are missing, the predator is either a mink, a racoon, a hawk or an owl. 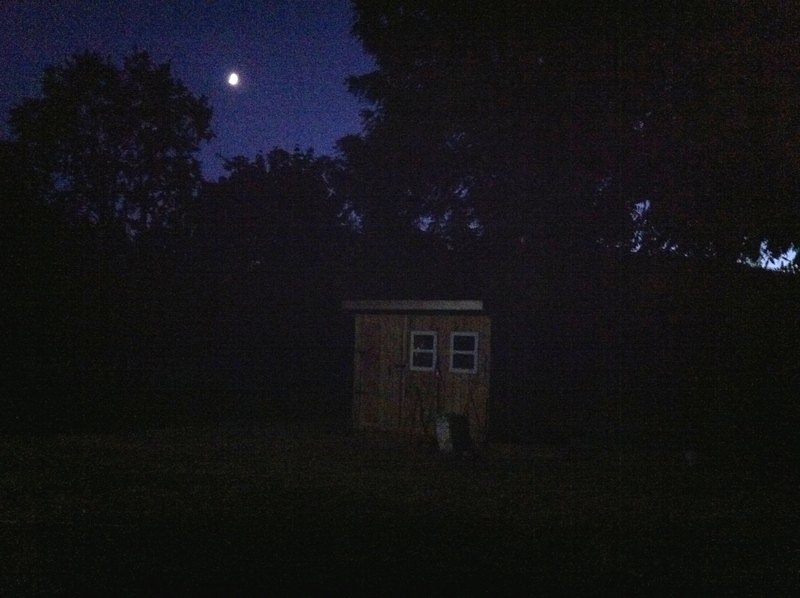 I’m pretty confident I can eliminate all three except the raccoon…I don’t think we have mink up here…I’m not sure….but I’m pretty sure an owl or a hawk would not enter the hen house through a partially blocked small 2 x 2 window. A claw mark, I think. Needless to say that window will remained closed until I put a wire mesh screen over it. On a good note, when the flock emerged from their hiding place, we found that only the one hen was taken from us that night. It could have been so much worse. Don Pedro showing off her personality as a young chick. 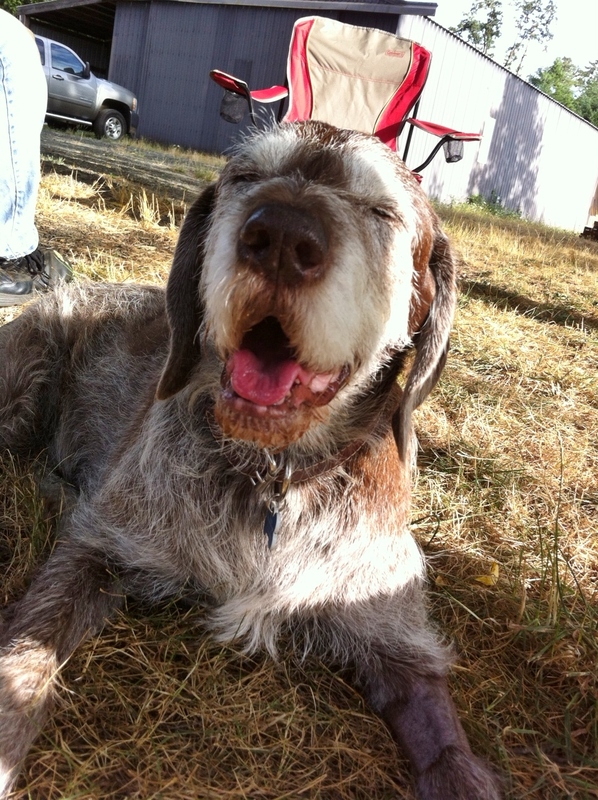 Don Pedro….she was quite a character!! Hahahaha!! I’m glad I knew this funny, demanding hen! Thank you for visiting today!! Have a wonderful Sunday, and an awesome week!! 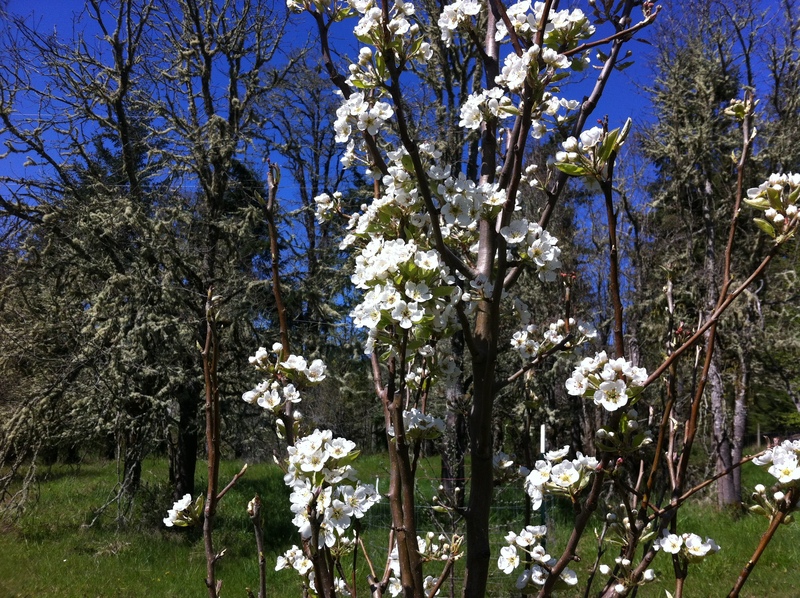 It is spring…in case you didn’t know!! The grasses are tall…very tall. The wind is blowing, and the rain is falling…and for obvious reasons, that’s okay!! 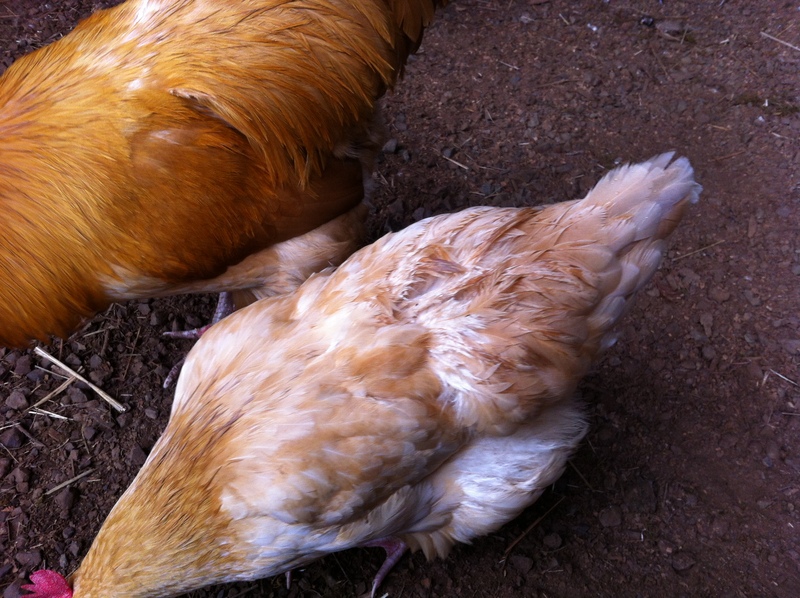 Both look like Buff Orphington / Rhode Island Red mix chicks. I’m hoping to have one that is a true Buff Orphington chick … it would be a Benedict / Claudio baby, my only pure Buff Orphington adults. ….it works, and I think it is a little more stable than a tripod. Sometimes you have to think outside the box…inside the box. And so it continues as there are six more eggs to hatch…I expect at least four more, there are two that seemed a little questionable when candled a week and a half ago. Exciting times!! Thanks for stopping by the farm today. This cool spring day has been full of blessings! I hope you find the blessings of your day too!! 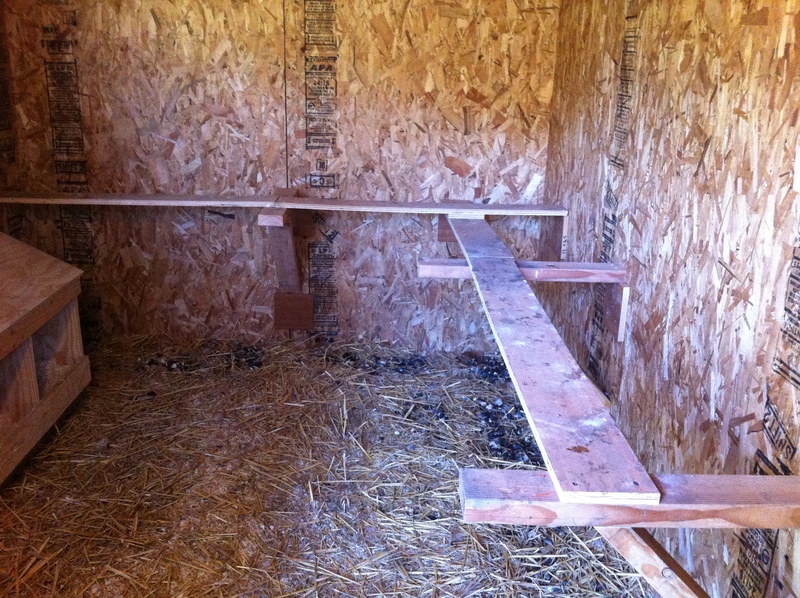 A few posts ago, I hinted…well maybe more than hinted….on the flock’s new house. it has been a work in progress….work a little…..NOT…..work a little….NOT, and finally it is finished I had very little to do with this construction project beyond design …. 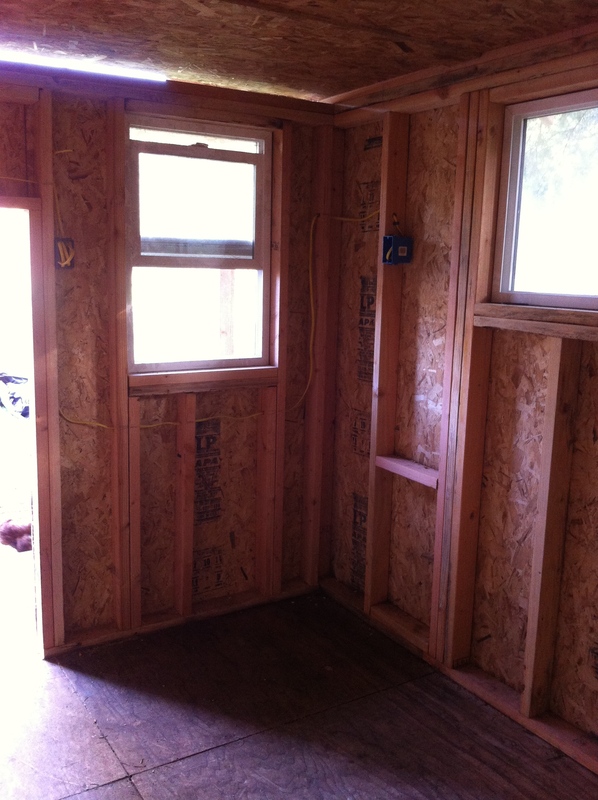 Tony did 90% of the work, my son…..maybe 10%. So, although the new little shelter should be called, Tony’s Place, (or something like that), it has to be….Benedict’s Bungalow!!! 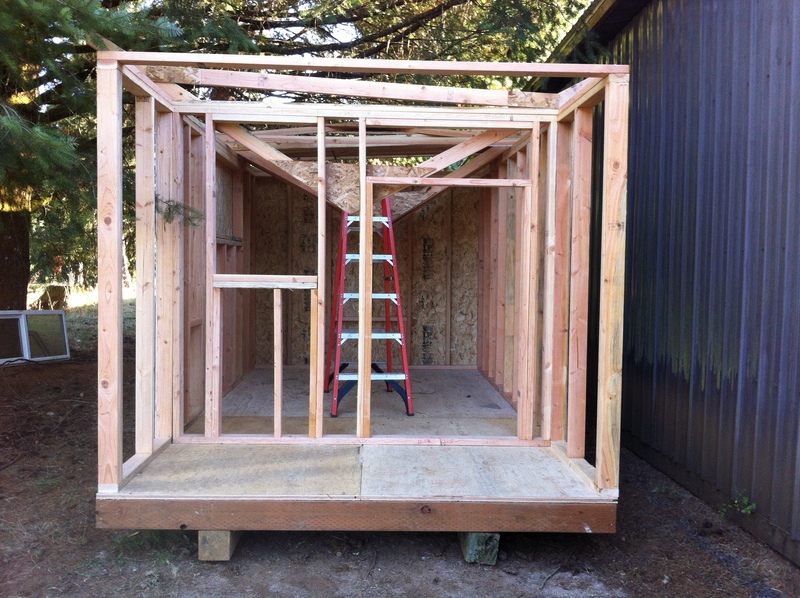 It started with a moveable foundation, built on skids. 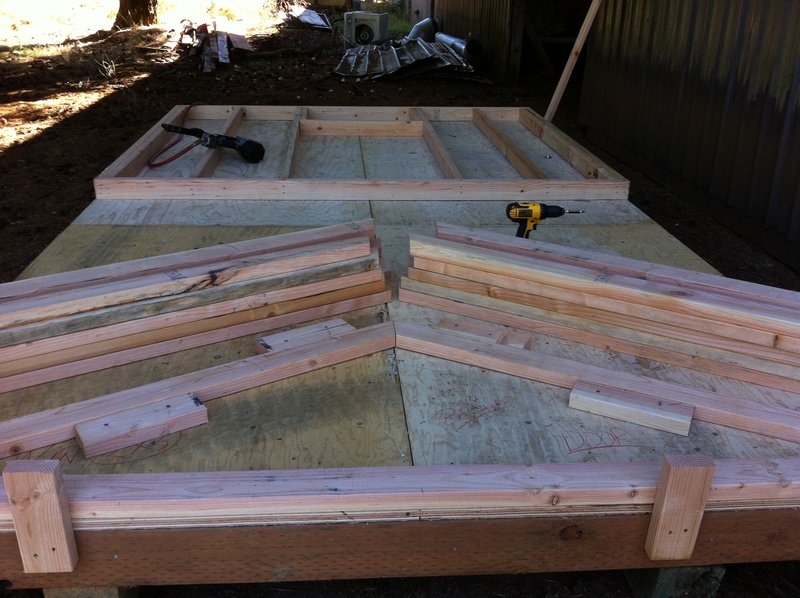 The one part I did help with was the building of the trusses for the roof. 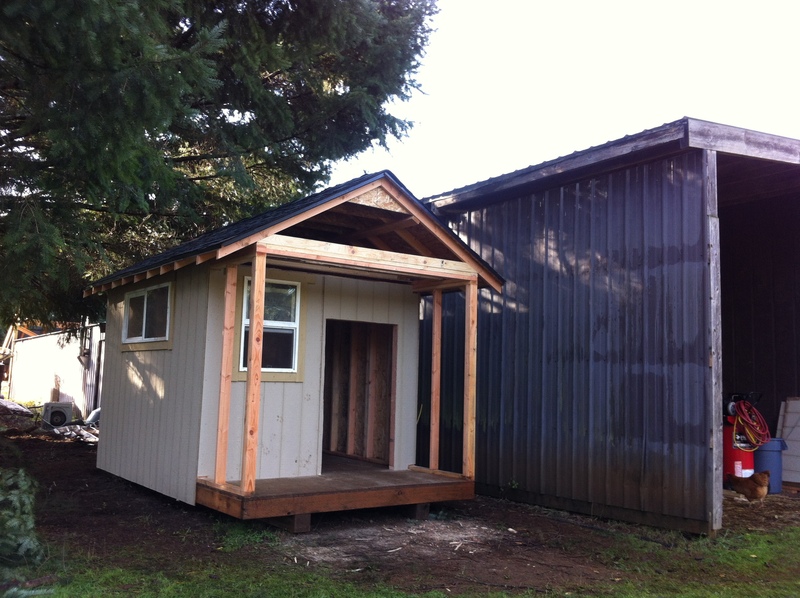 Every hen house deserves a nice porch to sit out on while enjoying those long, summer evenings!! YES!!! We are wired for electricity!!! No more flashlights, or construction extension cords draped across the ground from the shop. Hey…we have to have…. 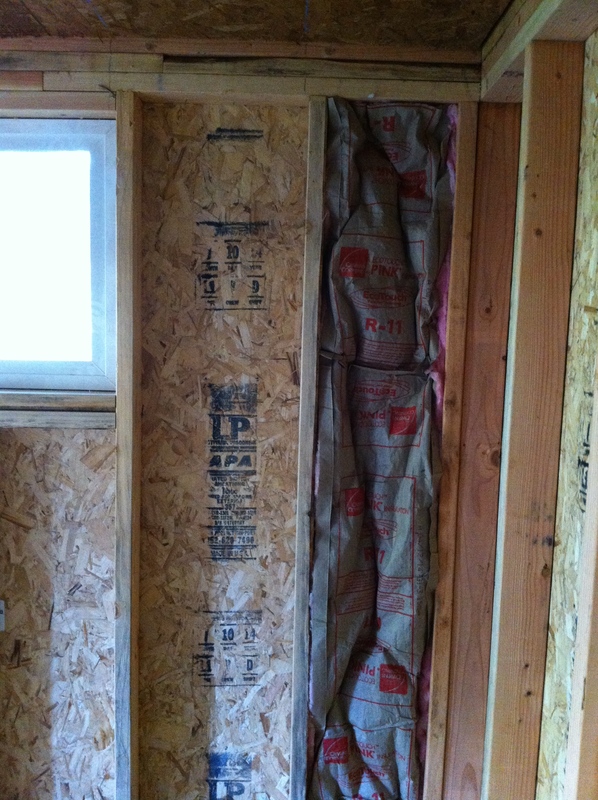 Insulation for our fine feathered friends!! They deserve this…they work hard for us. I think I could live in this little house!!! I think they are enjoying their little house!!! 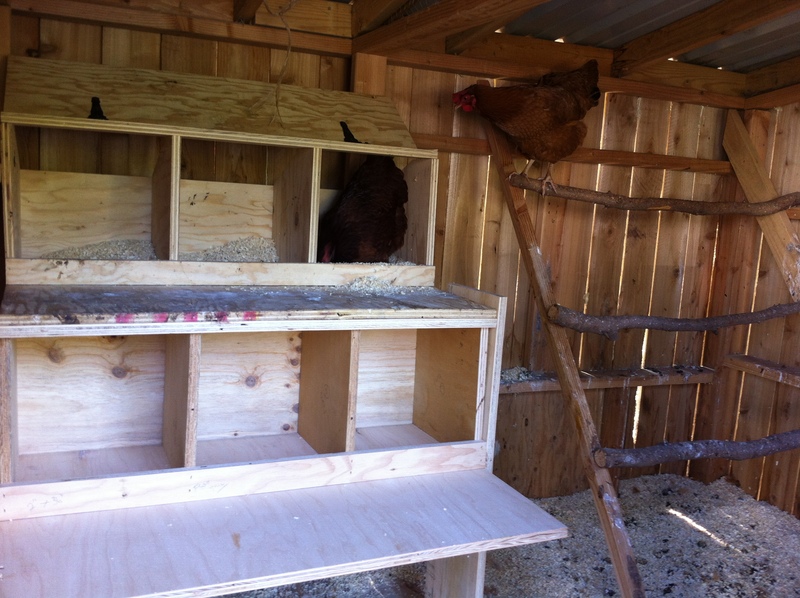 The flock is really enjoying this set-up of their roosting boards. There seems to be a lot less picking on each other, and there is enough space for those ladies lower on the pecking order to find a peaceful resting spot. 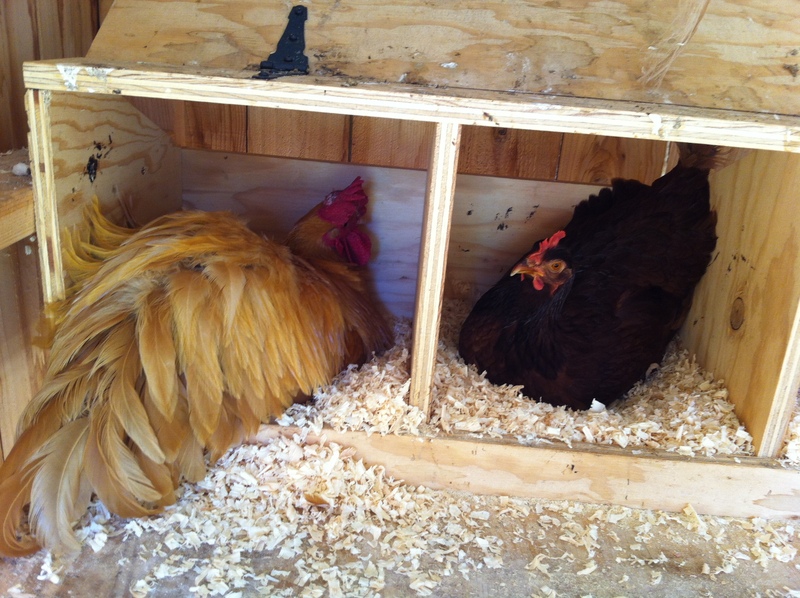 The new 16″ x 16″ nesting boxes. I think the girls are happy….I know they are! With more light, peaceful nights, and these amazing nests…we are getting between six and nine eggs a day now!!! So, I leave you with this….the next time you crack open an egg…..think about the hen that gave you that little gem, and thank her. If you think it’s easy work….just listen to our morning……they do carry on!!! Thank you for visiting the flock today!! I hope your time here was fun!! The moisture in the land this time of year brings about a true richness and depth in the natural colors that dot the scenery. I love how the redness in the wood that ladens the land pops through the bright green of the winter moss, and grasses. 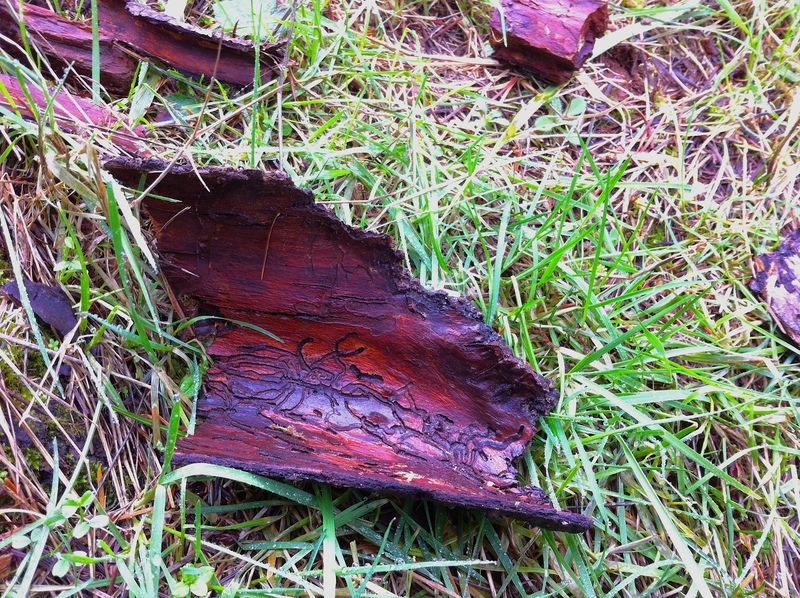 A stray piece of Douglas Fir bark becomes a topographical mapping of the roadways various insects have taken to navigate their way, to and fro. 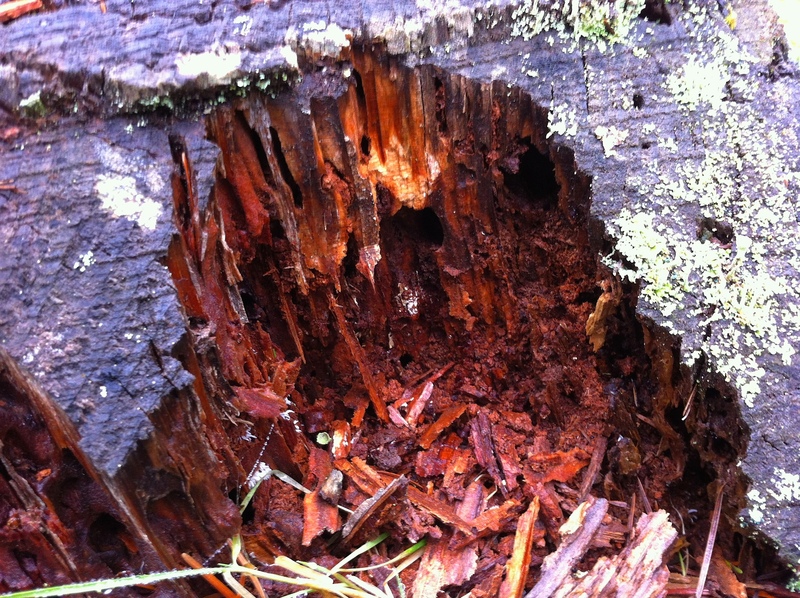 Stumps that are being slowly broken down and decayed dramatically showcase tunnels and caverns. Stray branches damaged by weather, and time create an amazing centerpiece fit for a king’s table. 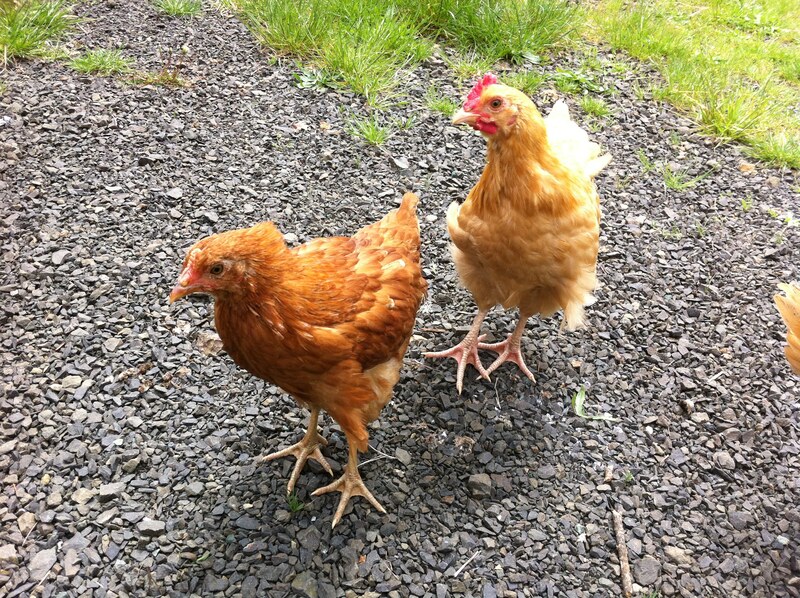 Even the flock want to get their feet onto a wooden surface………nope, not that one ladies…..no way…. Those are some beautiful girls!! Thanks for visiting our forested farm today. I hope you have a wonderful day! 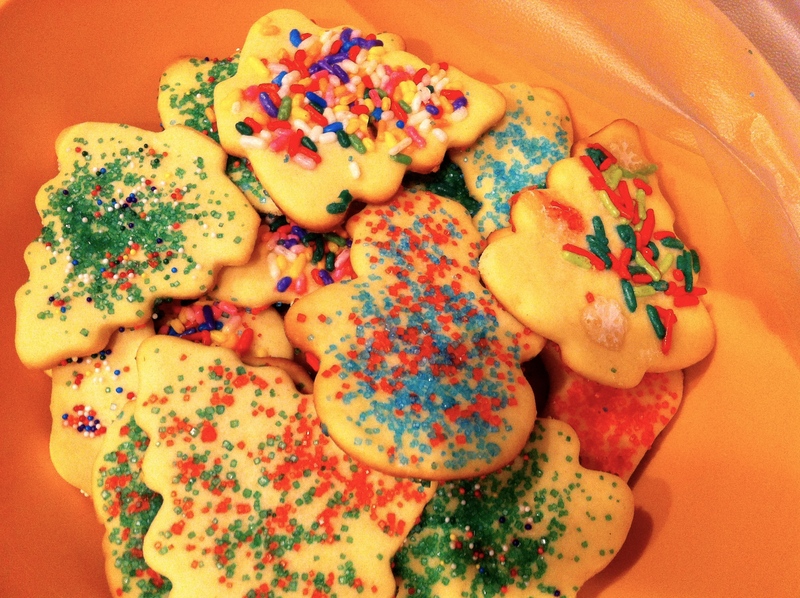 I can’t really call these Christmas Cookies…I made them on New Year’s Day. Haha…better late than never. …but with the deep freeze and copious amounts of snow last winter, followed by a really dry, dry summer…the jury is still out as to whether or not the nut bearing grafts have survived. We did not expect nuts this year, and we did not get any…spring will tell us the true story of the damage they received. 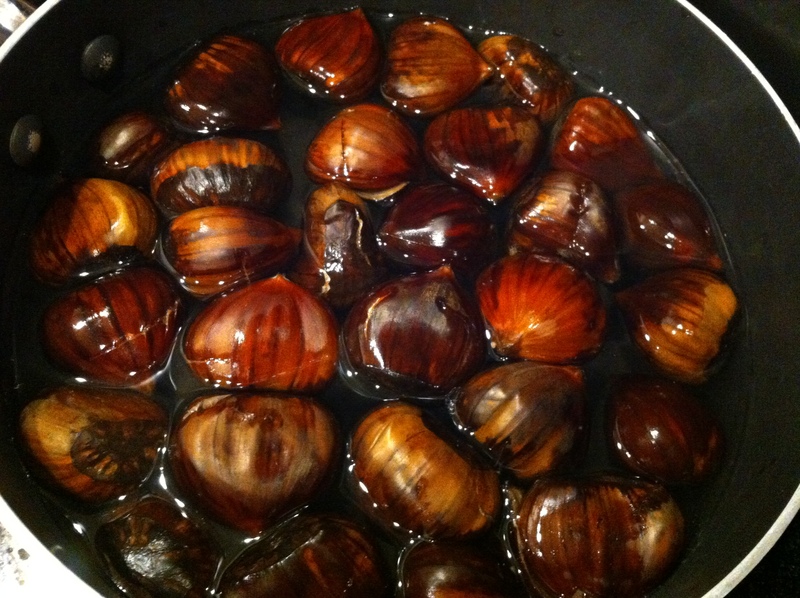 I would so love to harvest our own chestnuts in the fall. Keep your fingers crossed…we certainly are!!! The flock celebrated their first day of 2015 with leftover chow mein and fried rice. They were in heaven!! Grabbing a noodle, I’m sure their chicken minds went to the free range find of the coveted earthworm!! To say they were entertaining would be an understatement. One would grab a noodle, and with a quick look around, would take off running in a guarded attempt to get the noodle-worm down without having it stolen by another hen. Once gobbled, it was an all out sprint to get back to the noodle pile for another prize. So funny!! As always, our rooster, Benedict, was the ultimate gentleman and held back while the girls consumed. Once in awhile he would poke his head in, and using a very mannerly approach, would take a noodle from the edge of the pile. The hens were much more demanding. They could take a few lessons from their mature patriarch. As we get back to the business of the farm for the year 2015, we welcome the newness, and the potential. We’ve identified lots of goals, and in turn created lists of tasks that promise to keep us quite busy. I look forward to sharing these times with you! Thanks for visiting the farm today!! I hope you have a wonderful weekend!! …she would have been easy to miss, as she quickly hid in the warmth of Mama Chardonnay’s wings. Out of seven eggs, she was the only one to hatch. 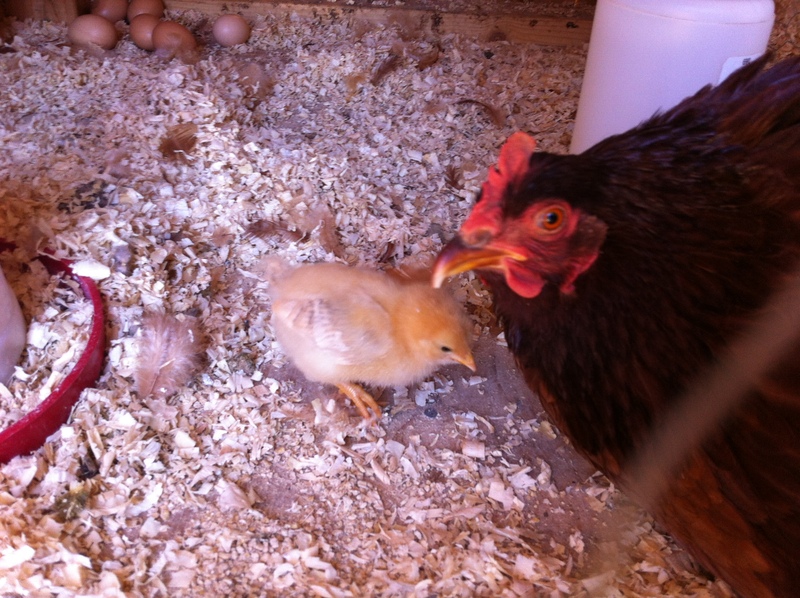 The baby chick quickly grew, and became her mama hen’s little shadow. Chardonnay shared all of her food with the chick, always allowing her to eat first. 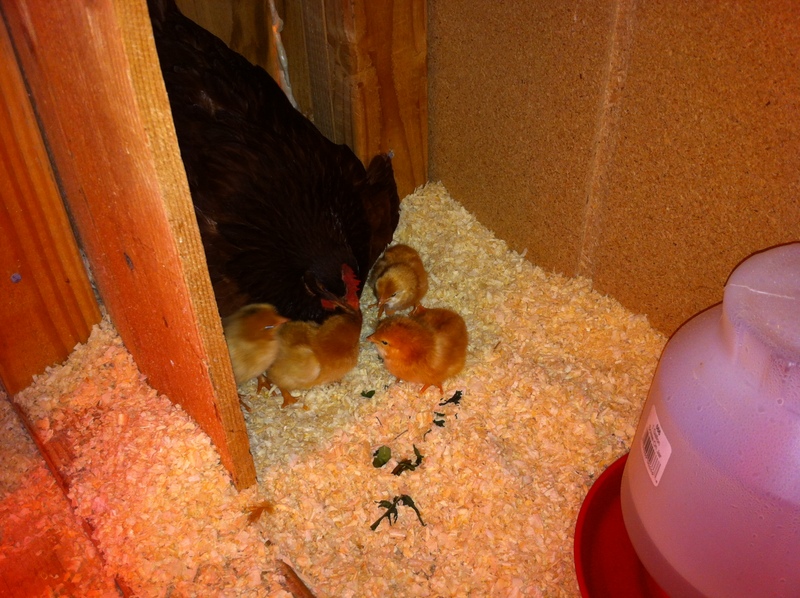 She has always been such a good Mama Hen. Mama and Chick catching some rays. Corn has always been one of her most favorite things. 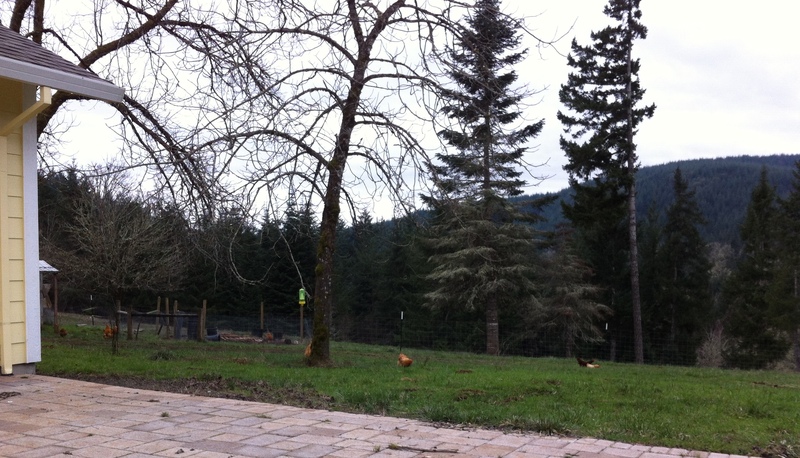 Free ranging everyday, she diligently followed Chardonnay, listening, watching, imitating, and learning. 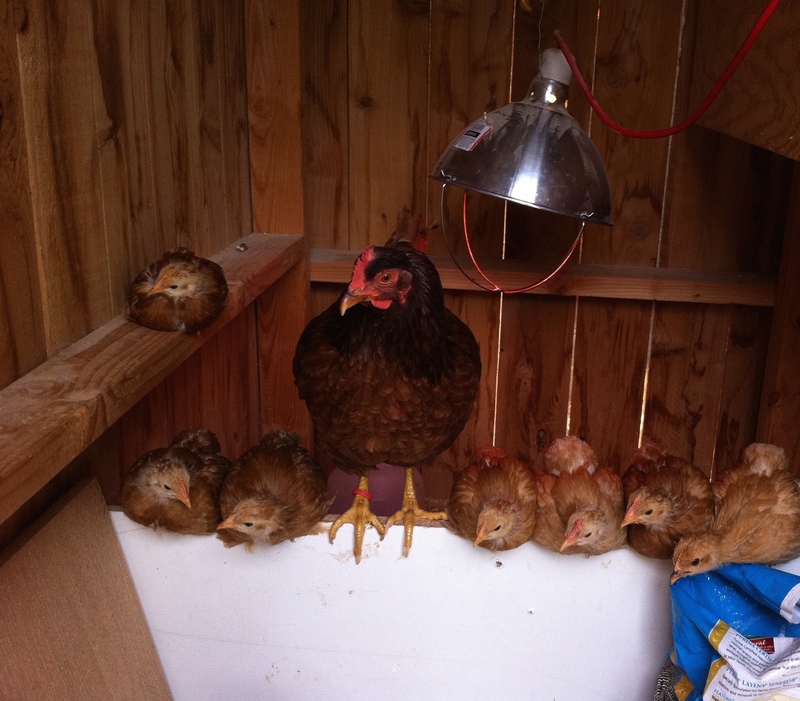 She became well integrated into the flock, and was rarely chased or pecked at by the older hens. As is the danger of growing up in the middle of a farm – forest, predators are a real threat when feathers cover your body. The flock works hard to safeguard themselves against these threats, and they do very well. Sometimes their efforts, and our efforts are not enough. Something attacked our littlest hen. I found the evidence yesterday morning…I’m not sure if it happened Saturday evening, or Sunday morning. Usually, I count the flock to make sure everyone made it into their house for the night…I didn’t do that Saturday night. I don’t remember specifically seeing her come out of their house on Sunday morning, but nothing alerted my conscious thoughts to her absence. In any case, she is gone…I wish I knew what got her! It’s that circle of life thing. The flock knew it and were on high alert all day, hiding underneath things..running from cover to cover to change locations. They felt the loss, and the danger. 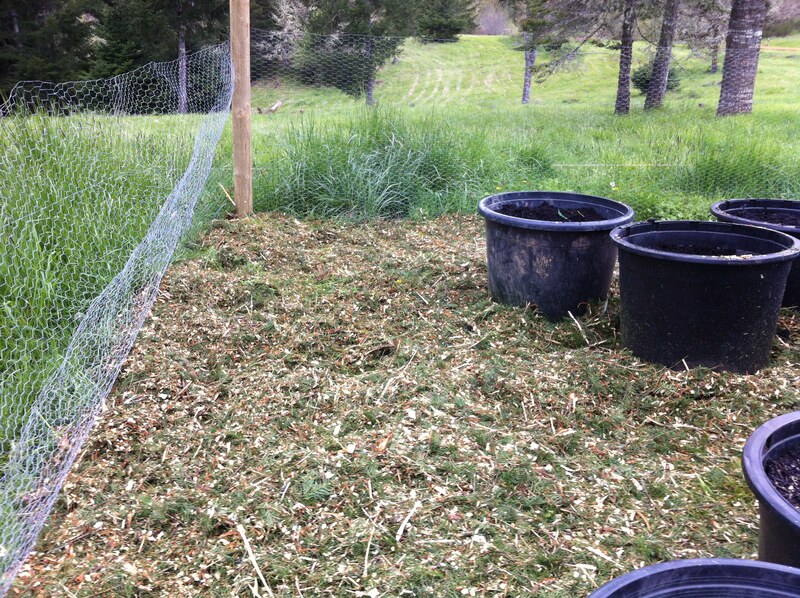 This is the life of a free ranging chicken. There are real dangers, and in spite of that, there is real freedom….and sometimes, if I catch it just right, I think I can see them smiling! 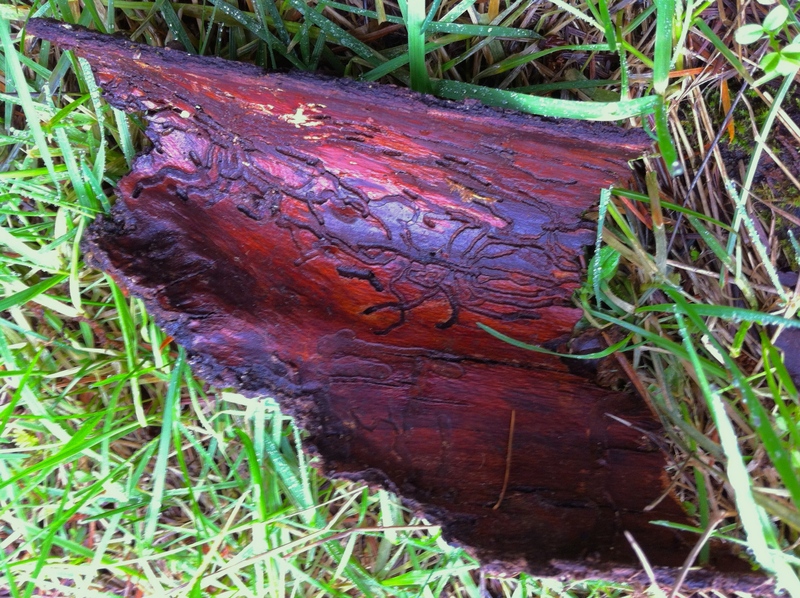 There are definite life lessons that occur in nature, look for them, they’re there. Thanks for walking through nature with me today. 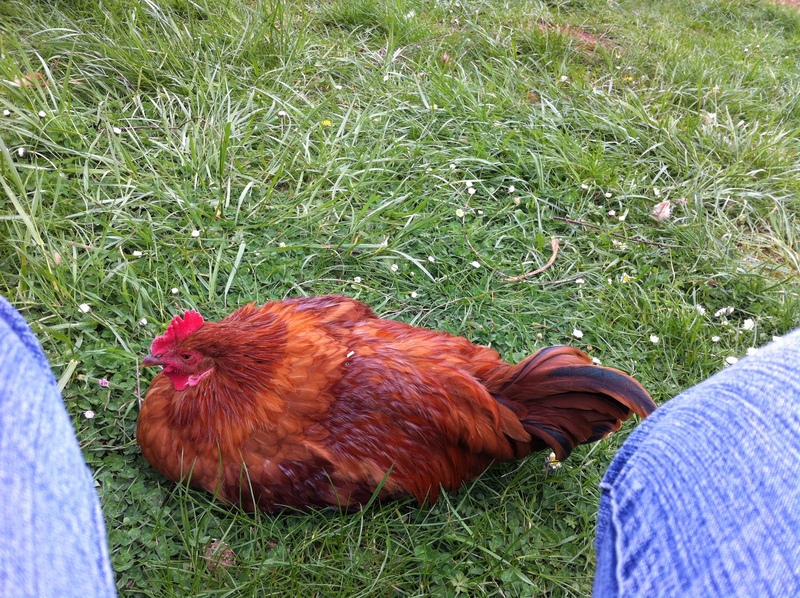 I’ve come to realize that my life is all about the chickens…and of course Sir Benedict. They tell me, under no uncertain terms, when to wake up. On those rare mornings that I have not gotten out of bed before sunrise, Benedict loudly calls from his high roost, and the hens squawk and complain….and poop…everywhere. 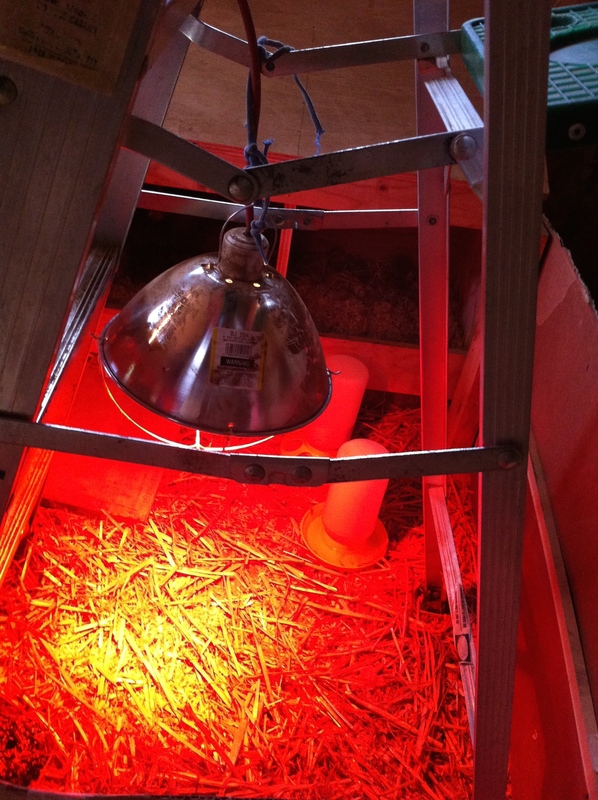 Since I clean their roosts, nesting boxes, and platforms in front of their nesting boxes every morning…it’s a good idea to get them out just as the sunlight crests the darkness. I fudge this timing, just a little on the weekends, but still need to get out there before the hens have need for their time of privacy. 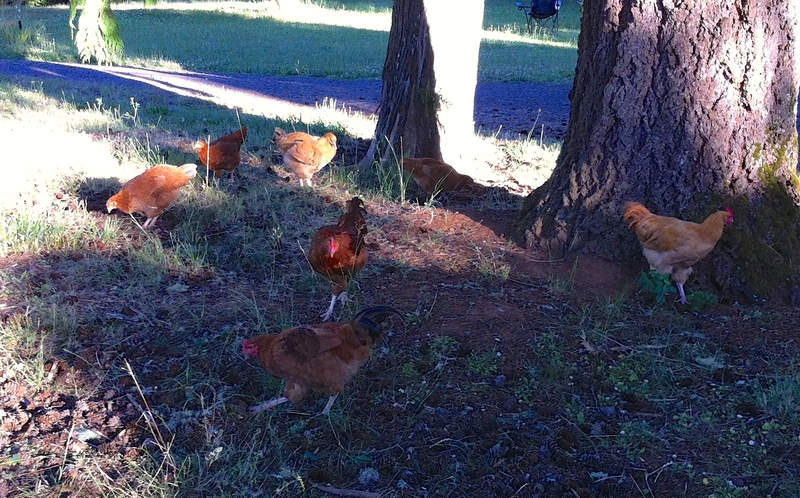 This flock dictates how late I can stay out at night…somebody has to close the door to the hen house after dark!! Predators in the forest = a definite need for security. 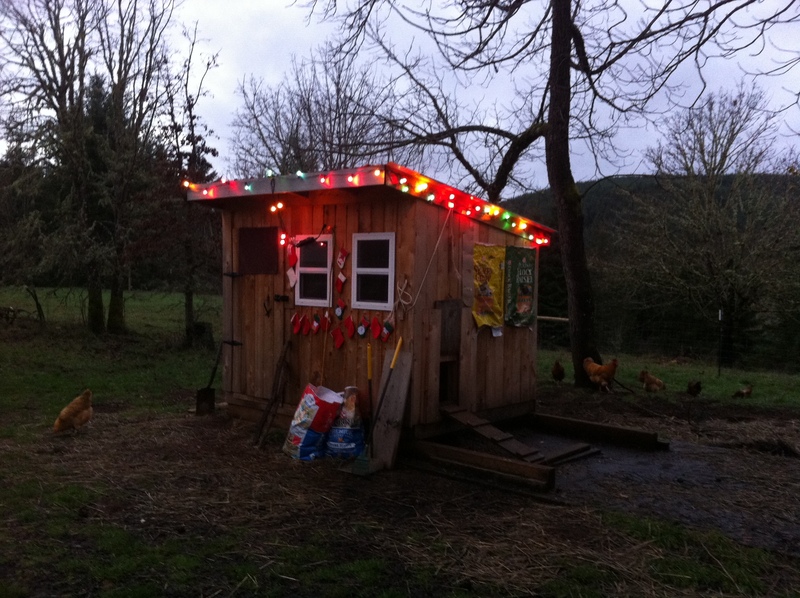 The UPS guy told me that that was the most “Red Neck” chicken coop he’s ever seen…hahahaha! Hey, get off the porch…that water is for the dogs!! 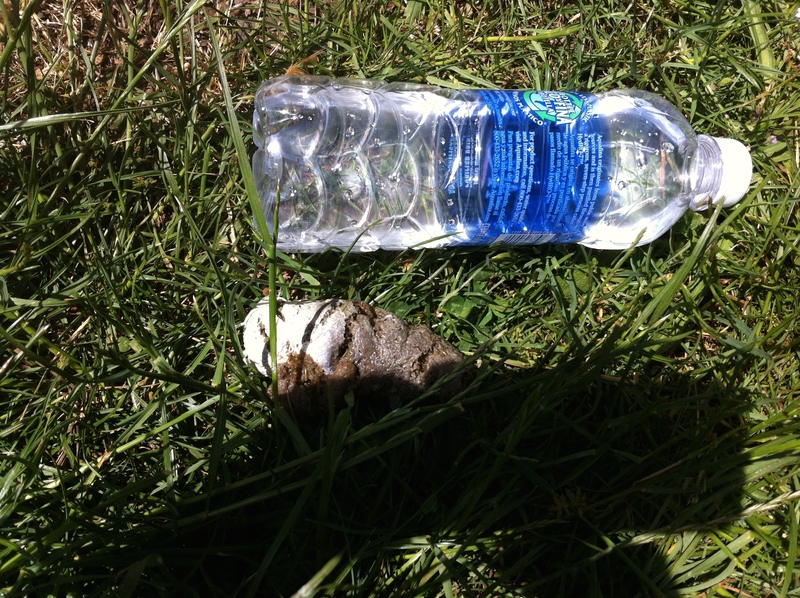 Seriously…that is chicken poop…That’s ridiculous!!! ….so, I follow them around picking up their…not so golden surprises. In the end, I believe the flock is healthier (I know we are!) and happier. If you have 41 seconds….take a look at our little video, 29 Hours on the Farm , …. 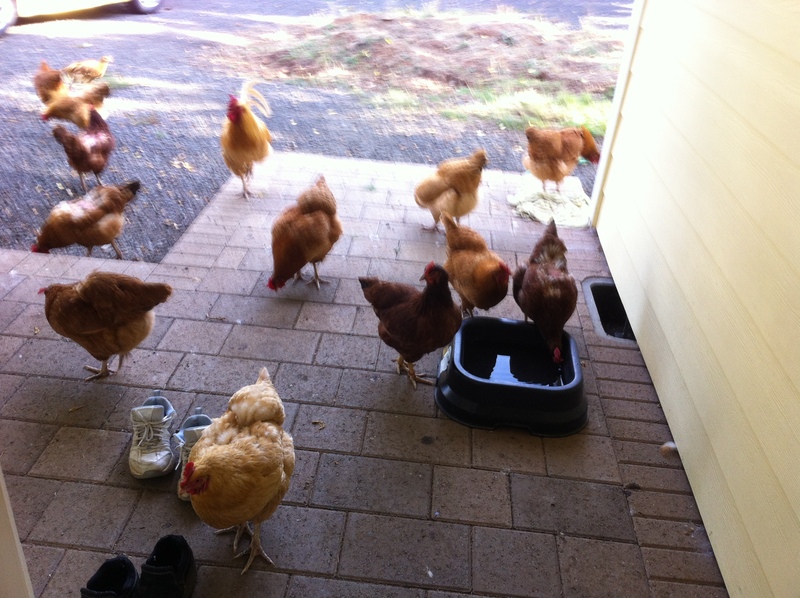 this is the reason I let this flock run my life …. ….next stop….well, we’re looking at goats (any ideas? ), but I think I need a trip to Disneyland first!!! I’ve definitely got the bug!! Thank you, for visiting the farm this morning!! Have a wonderful Sunday!! 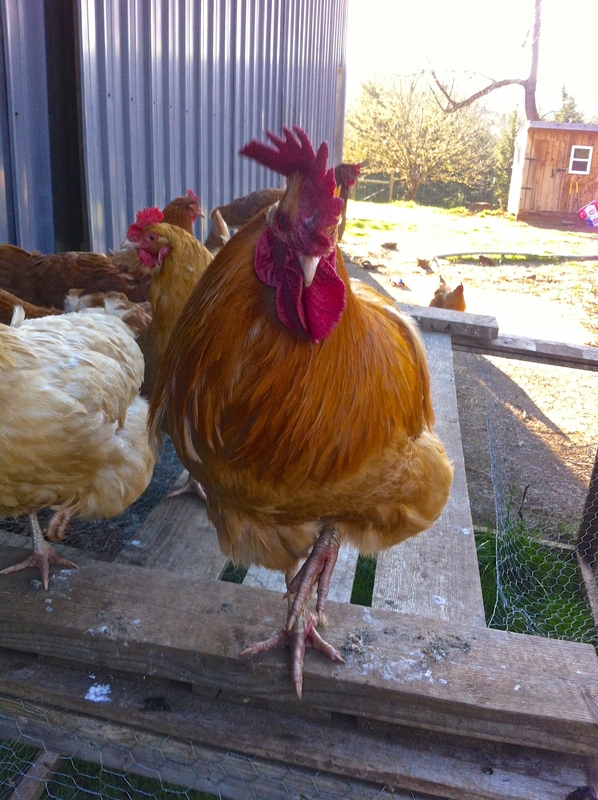 You may remember this guy…..
….big daddy, Benedict….our gentleman rooster. Always polite, never asking of his hens without the traditional dance. He doesn’t eat of the discarded kitchen goodies until his family has had the chance to partake. This boy keeps his eye on the sky and warns the flock of any impending dangers…Yes, he is the stud of the farm. The past couple of months, Benedict has become somewhat of a bully to a few select hens. 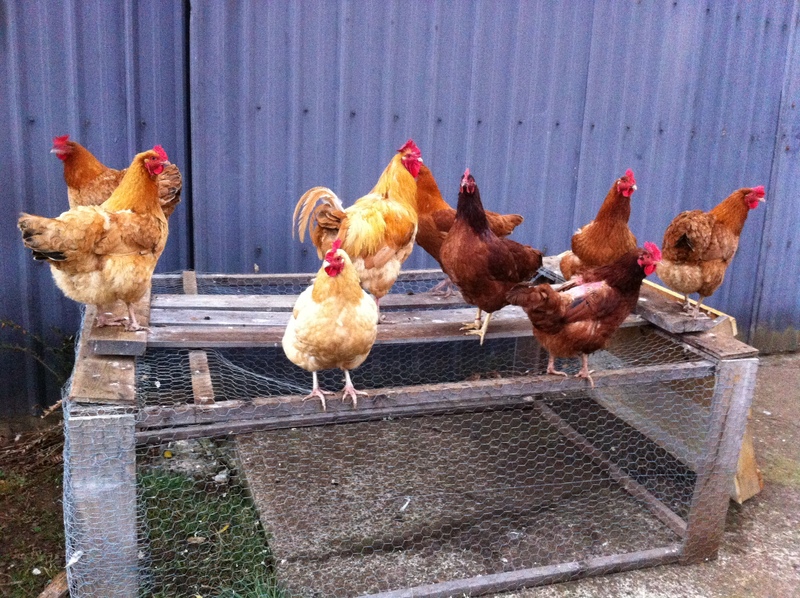 Oddly enough, these are hens of his roo-hood…the full Rhode Island Reds, all of them…except mama hen, Chardonnay. He will literally chase them down, not necessarily to mate, but often times just to, well…stand on them. Really, at this point, I know the difference..hahaha! Their backs are bare, or in various stages of feather regrowth. Poor little Reisling’s bare back…FYI she had just gotten up from a dust bath, her back looks dirty. I’ve read about this. 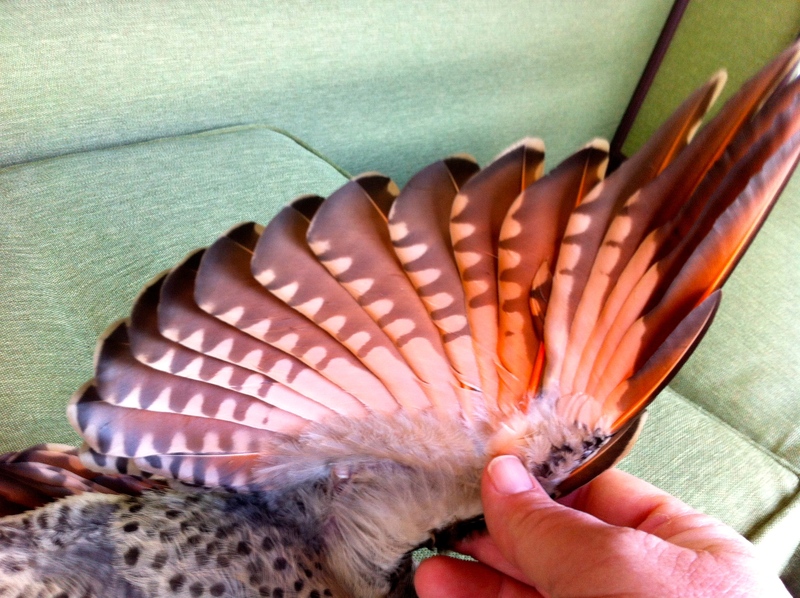 Their feather loss is not due to molting, there are even thick wing feathers that have been broken off, not pulled out. And I’ve witnessed it…I’ve seen the intentional chase..mount..stand, just standing, no rooster duties going on. 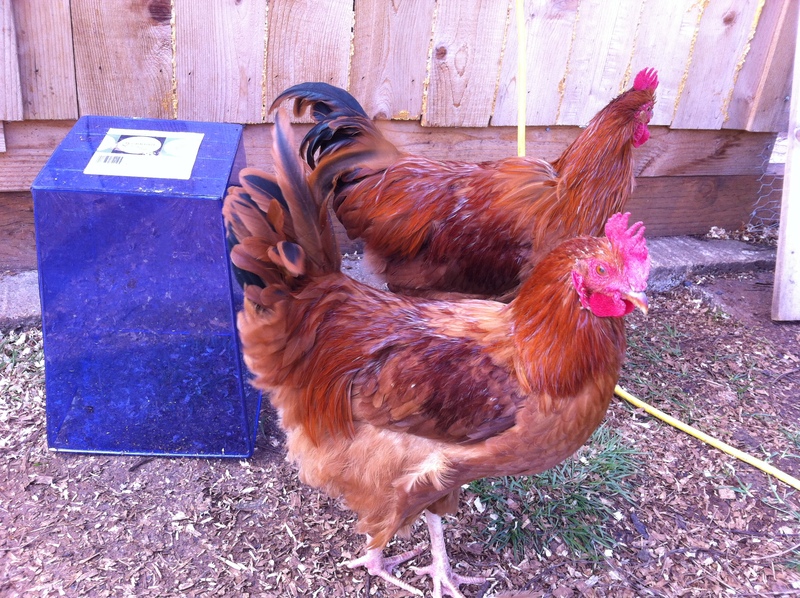 Sometimes, Claudio, our Buff Orphington hen, gets in the act with Benedict, and will run over and start some weird kind of hen attack…plucking at the other hen’s feathers while Benedict stands on them. Is this common behavior?? Benedict and his harem…including the 4 bare backs. As the colder weather approaches, I’m a bit worried about these girls. 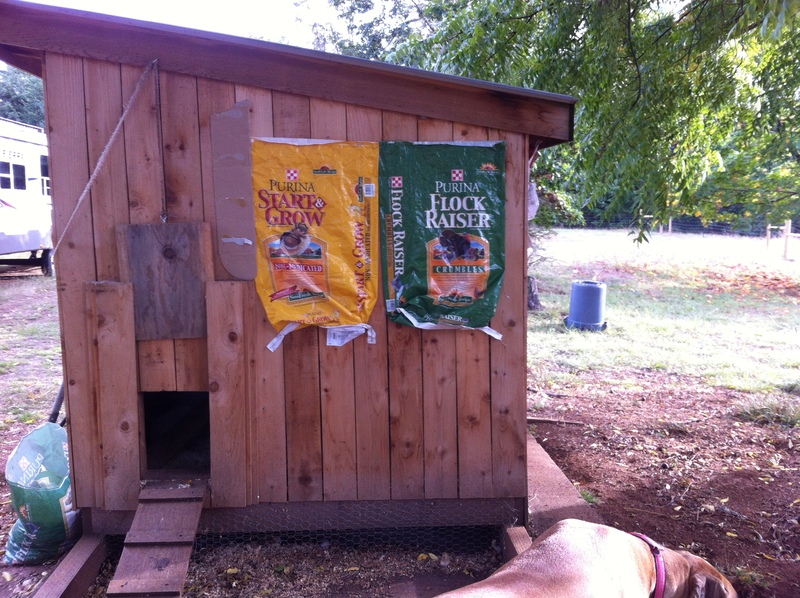 At the advice of our local feed store, the flock is now getting supplemented with Purina Flock Raiser which is higher in protein and fat than regular chicken feed (Purina Layena.) It seems to be helping with feather regrowth, and since the cold weather is currently knocking on the door, I’ve made this their primary food. As the feathers attempt to grow back, those thick shafts stick out, and it seems much more painful for them when Benedict does…whatever it is he is doing. 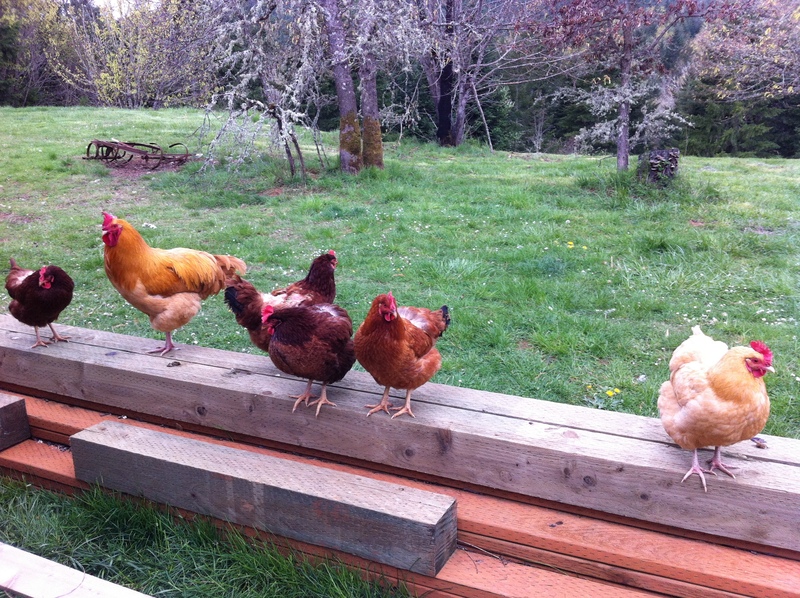 I’ve become, Alpha Rooster, and chase him away from these girls when he pursues them…he does seem to be listening. 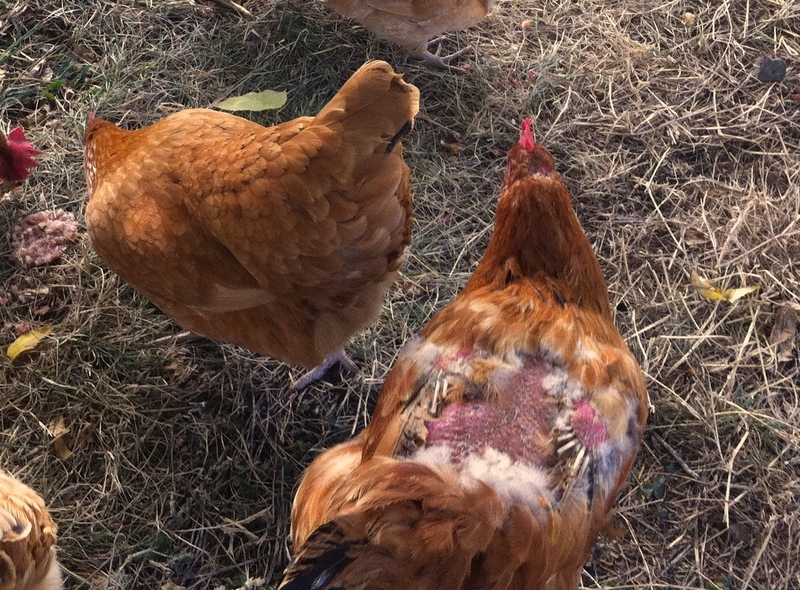 I’ve read about hen jackets that are made for this reason, however, you run a greater risk of a mite infestation with the jackets….I don’t think I want that…but I also don’t want my girls to be cold. The only thing I know is….there’s a lot I don’t know!!! HEY!!! Get off the porch!!! Thanks for checking in on the farm today. 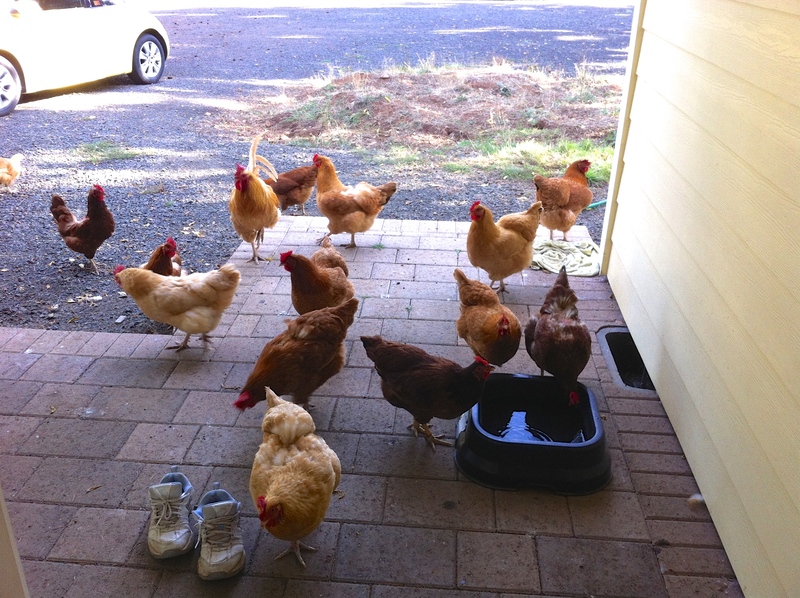 When I tell the flock that you’ve been here…they get very excited!!! but also from the demands of the oh-so-soft-spoken ripening garden. It has been dry, really dry. The ground is so dry. Everything, is feeling thirsty from the lack of those wet, drippy things that fall from the sky. It takes a bit of an extra effort to keep the flock in fresh water (they get overheated very easily), to maximize the benefit of the water given to the garden, to water young fruit, nut, and Sequoia trees one by one by the bucketful, while keeping a balance with the water level in our holding tank. That tank holds water from our well…which in turn, waters this family. 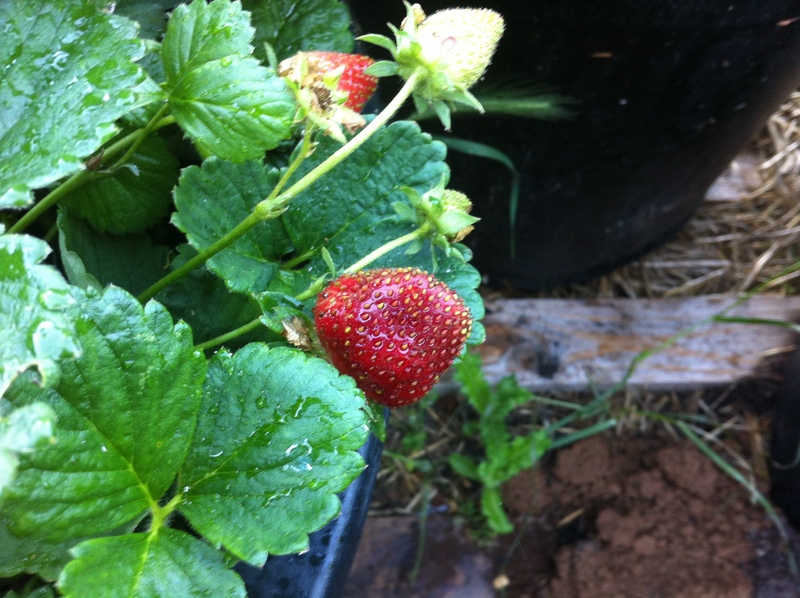 In spite of water rationing for the garden, there is plentiful ripening. Harvesting of more than just a couple of tomatoes here…a pepper there…has begun! 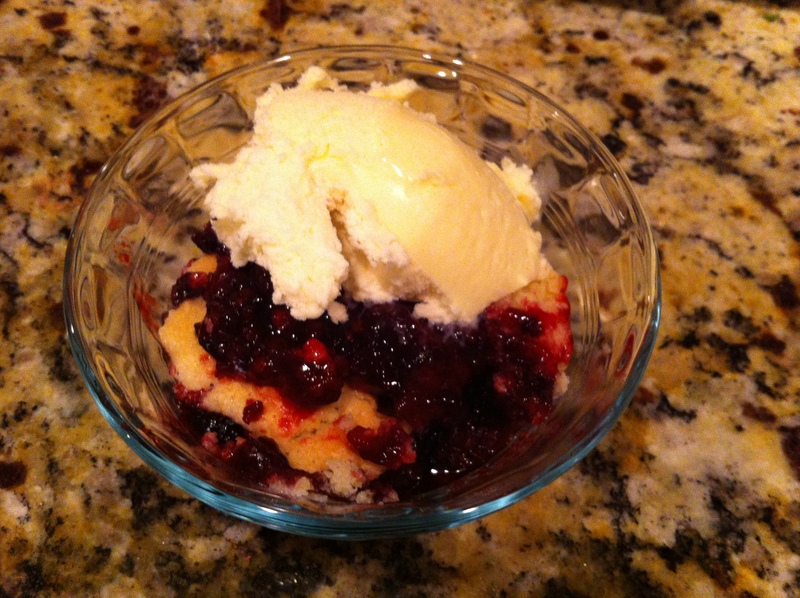 We are starting to enjoy the “fruits of our labor”, especially in the berry department. Wild blackberries are ripening at break-neck speed, and my little strawberries are right behind them. When you pick them at that juicy, sweet ripened stage from the vine, they don’t last long. The upshot of that is turning this…..
A little time consuming, but totally worth it!! Oh, did I tell you…. 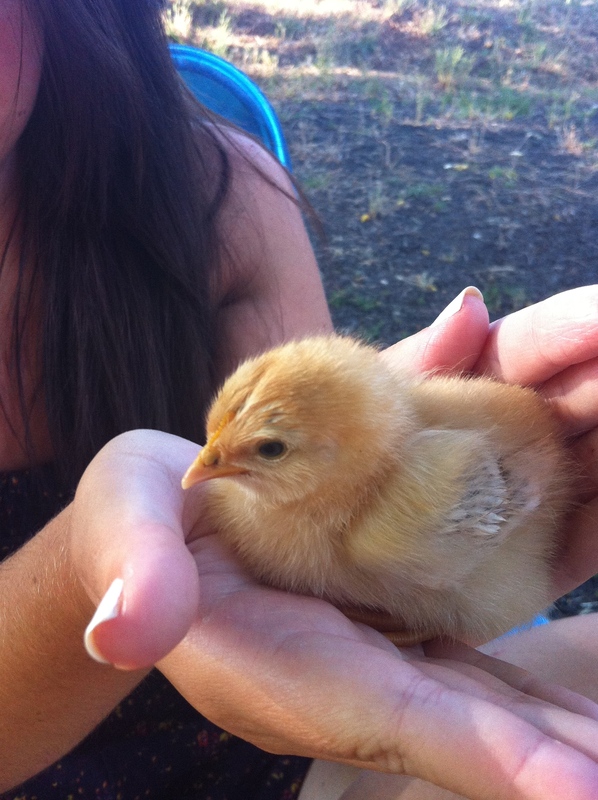 ….welcome to the farm little Roni Jr. ….. hatched on my daughter’s half-birthday. 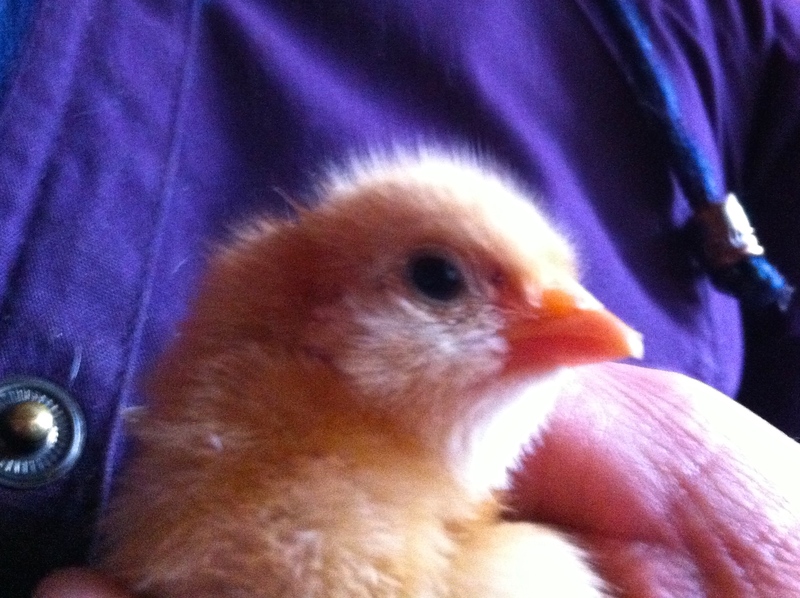 Out of six eggs, this is the only one that hatched. After several days, Mama Hen abandoned the nest, and the eggs went bad. The baby is out and about free ranging with the rest of the flock, watching every move Mama makes. Thank you for sharing the long days of summer on the farm with me!! Hope you are having a wonderful August! There is artistry in the food we eat. I realized this with last night’s dinner. I don’t mean in the way of how it is displayed on the plate, or the unique style in the craftsmanship of the porcelain it sits upon. More and more, thanks to the numerous cooking shows on T.V., I’m experiencing the depth of flavors one can create when the main seasonings go beyond garlic salt and pepper (that’s where I’ve been stuck for many years.) Even this, however, is not really what I’m talking about right now. Although spices add to the complexity and success of the dish, the main ingredients, the stars of the show, are what my thoughts have been focusing on. OOOOPPSSS…how did those Little’s get into the garden?? Dinner last night, the sustenance of nutrition, was completely grown, or raised, on this little beginnings of a farm…right here on Haveadane Hill. 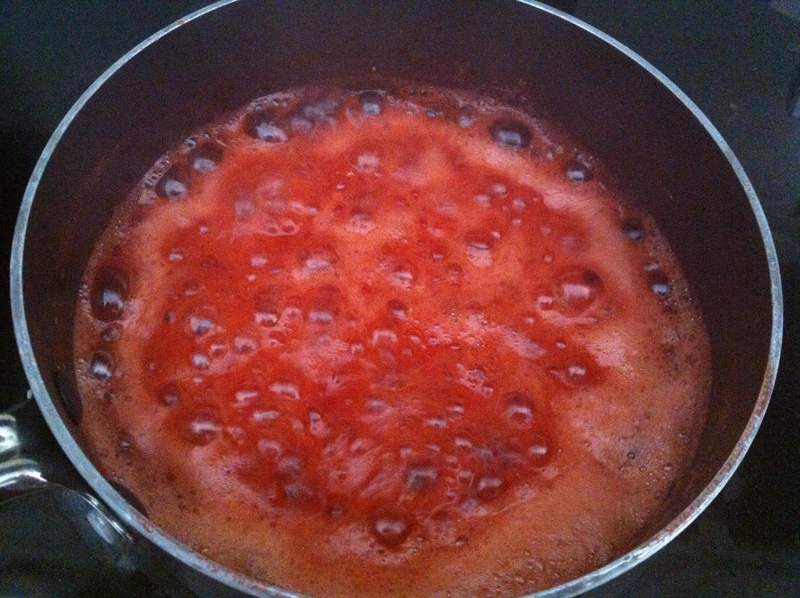 Okay, so the spices I used and the local honey were not…but….does that count??? 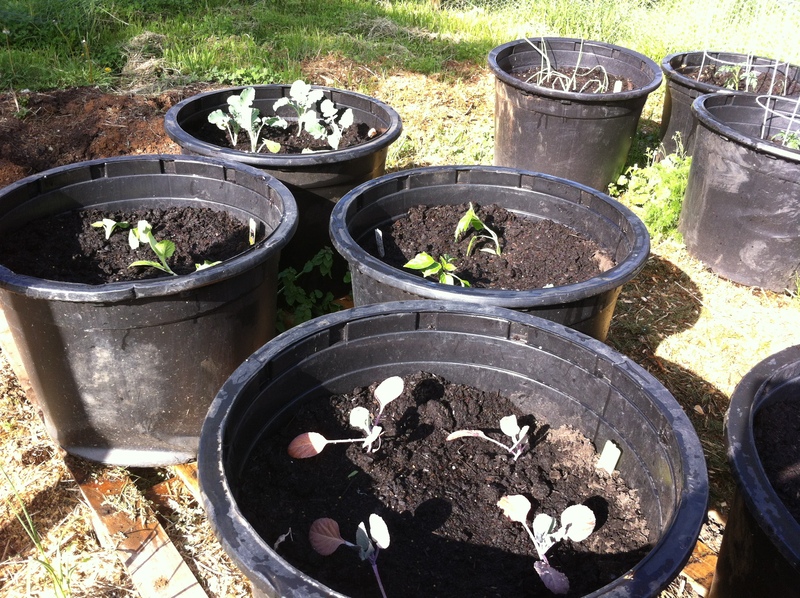 Something to think about…can I grow my own cumin, how about ginger?? Something to definitely investigate!! Baking chicken on the grill. This beautiful bird (one of the roosters of the Littles, aka The Muppets hatching) was hatched, raised free ranging from day one, culled by Tony, cleaned and processed by my own hands, chilled in the fridge for a few days, and became the star of the show!! I made a rub of powdered garlic, cumin, ginger, thyme, parsley, salt, pepper, and olive oil. 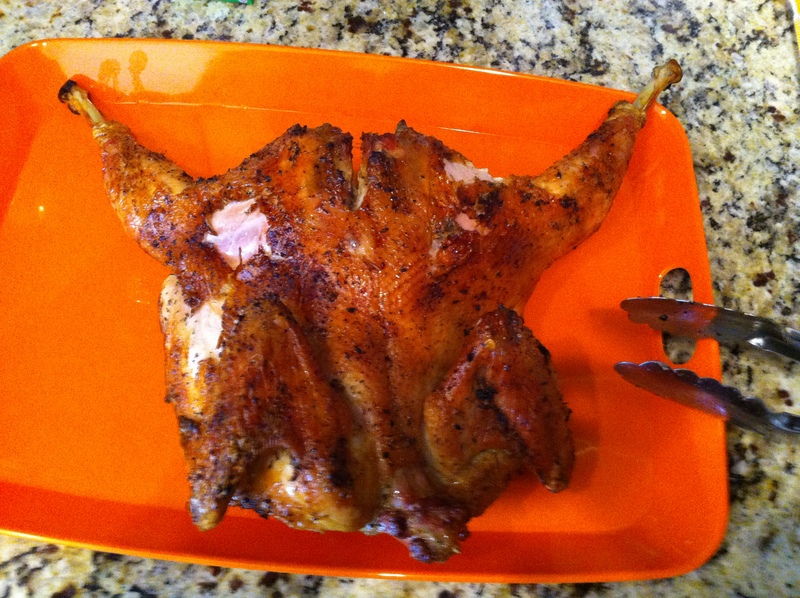 This little bird was well coated and cooked up beautifully!! 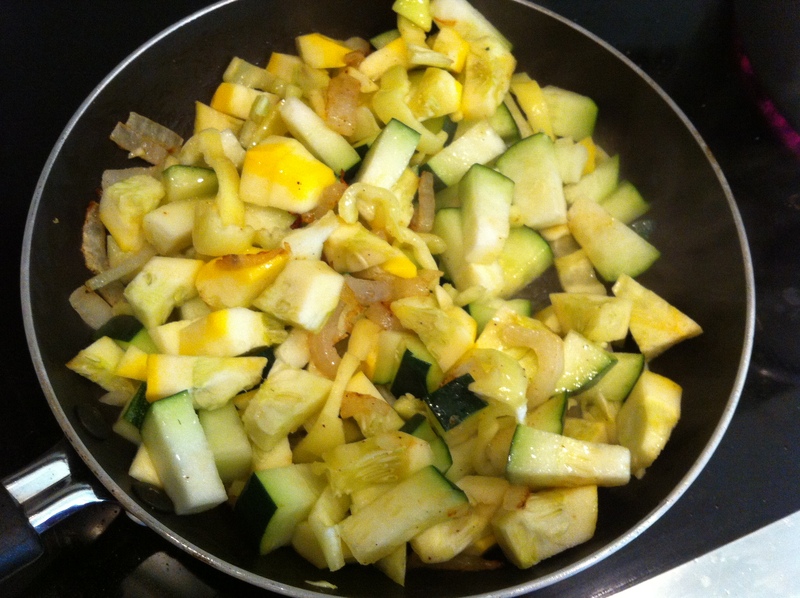 Then I chopped up onion, crookneck squash, young yellow bell peppers, and zucchini…all from my garden…sauteed them in olive oil (well..no, I didn’t squish the olives hahaha)…cooking the onions first, sprinkled with cajun spices until well caramelized, then added the two squash. 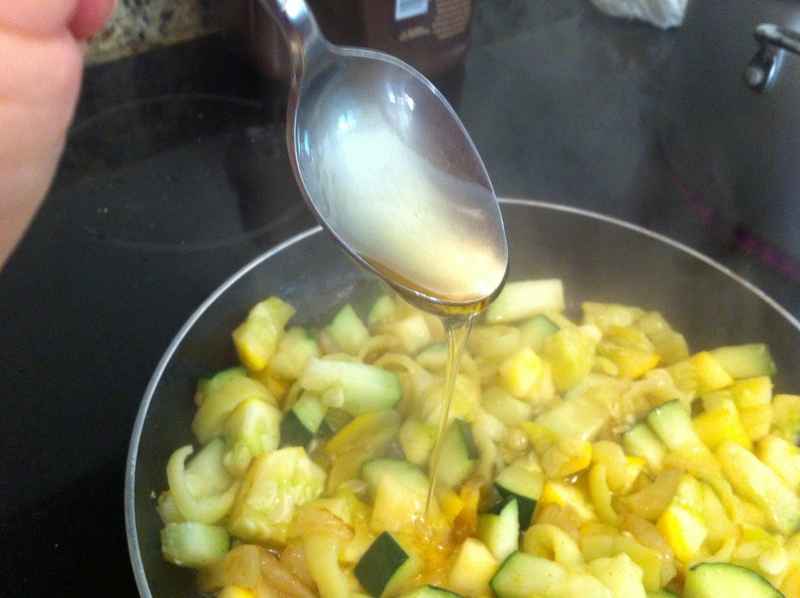 The end of the honey drizzle….who wants to lick the spoon?? I thought that I had possibly cooked the veggies too much…I didn’t want mushy, but I wanted them to be cooked through. 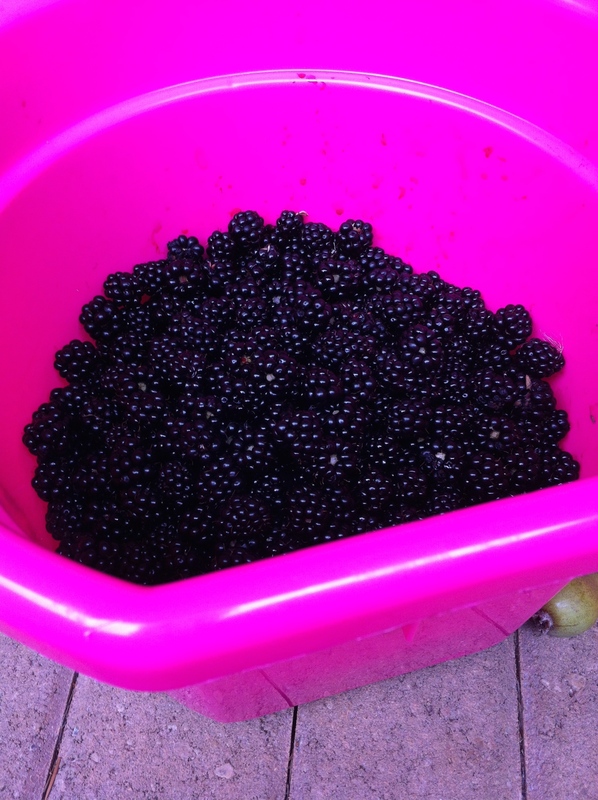 Much to my delight, they still had a nice crunch from their skin due to the just, picked, garden freshness. Next time for color, I may add some spinach at the end of the veggie saute. I think that would be good!! 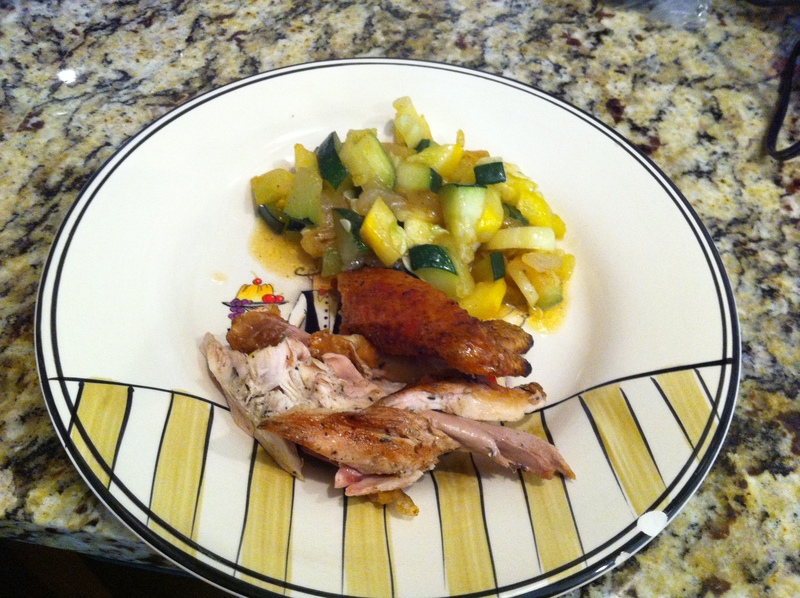 My completely home grown dinner…delicious!! 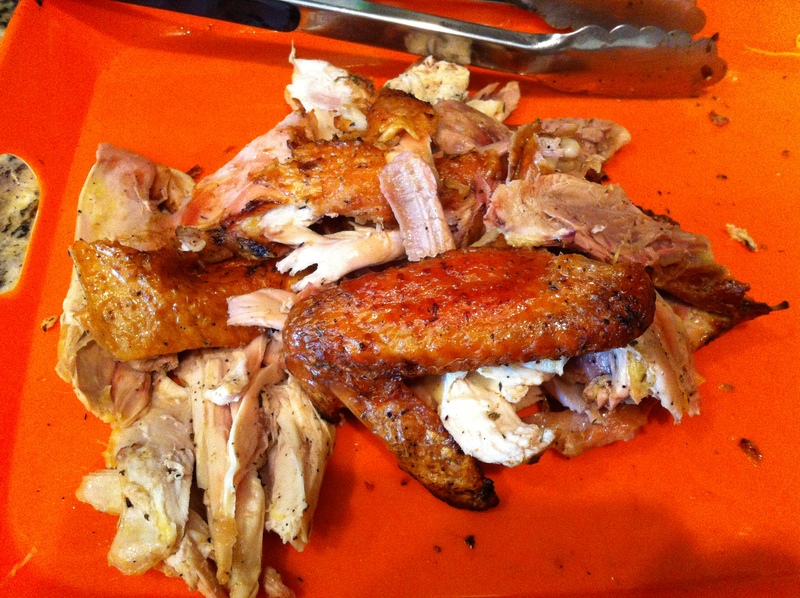 The little rooster was really, really flavorful…and a bit tough. He was a very fit bird, with very little fat. 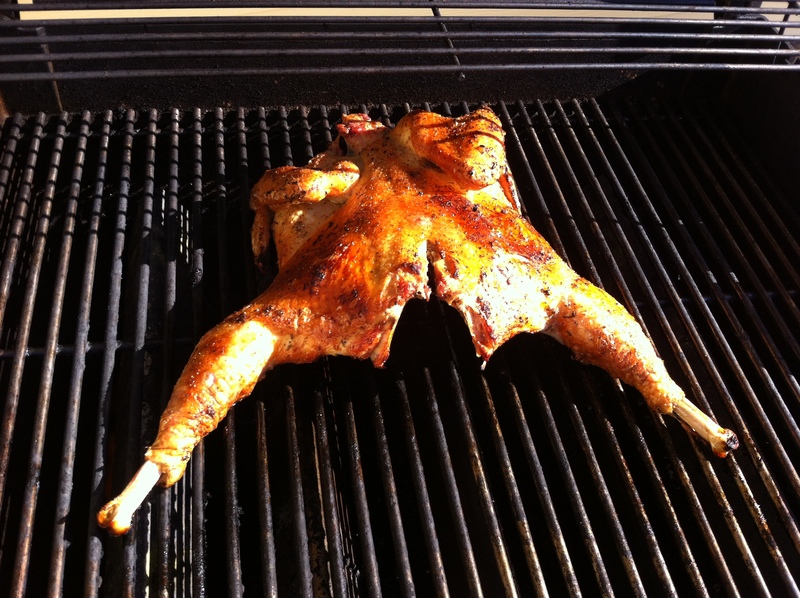 Butterflying the bird and roasting it on the grill breast side up (thank you FoodNetwork – The Kitchen) allowed the spices and the small bit of fat from the skin to permeate the meat making it very moist. The veggies were outstanding, and the sweet honey added to the brightness of the cajun spices really complimented each other. The flavor that stood out to me the most, however, was how absolutely fresh everything tasted…really, it was amazing. 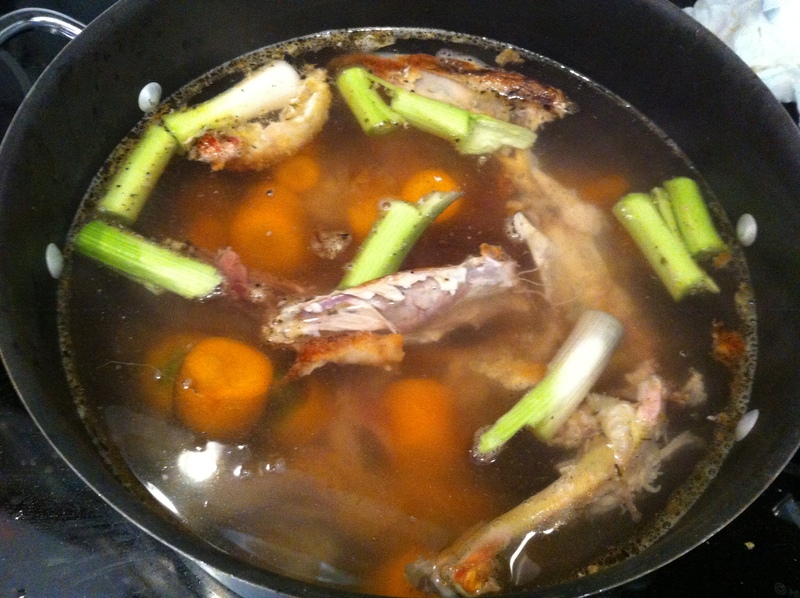 THEN….not wanting to waste one bit of this amazing little rooster, I added water (we’re on a well so again…straight from the farm), carrots and onion (from the garden) and made a wonderful stock. 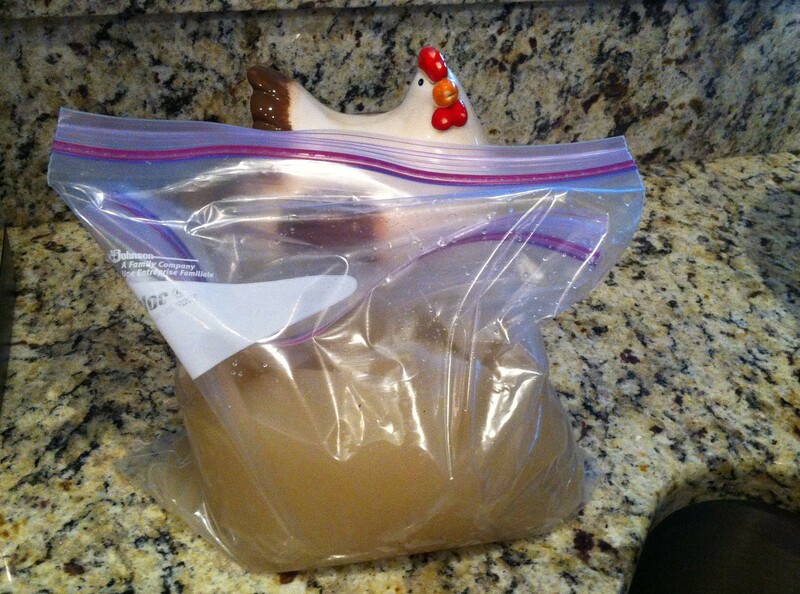 Stock after sitting in fridge overnight. There was so little fat that rose to the surface, that this is all I could skim off…. 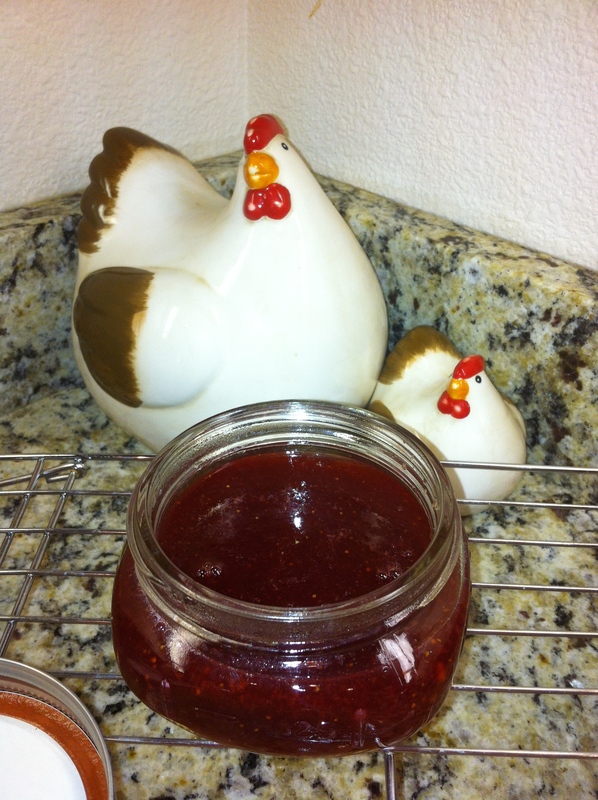 I’m proud of my little rooster…he was one healthy bird!! He provided my family dinner last night, and will provide us broth for a great soup once the weather turns cooler. 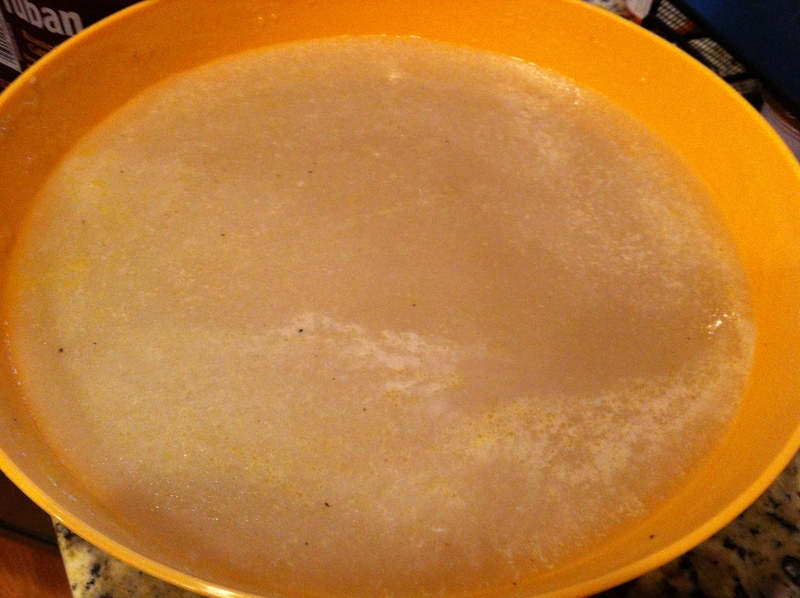 Cooled, skimmed, and ready for the freezer…to enjoy as soup in the cool of a fall evening! Who would have ever thought that this city kid from the San Francisco Bay Area, who ate in restaurants more than she cooked, could move to the country and raise the meat and veggies entirely on the farm for dinner last night?? I’m so excited to explore what is next for the farm…I keep talking to Tony about a couple of cows…he keeps talking about a couple of pigs….bee keeping for honey is totally on the list…stay tuned, there’s more to come!!!!! Thanks for sharing my dinner last night!! Have a wonderful, wonderful Sunday!! The cool of this morning has broken my heart. No more rooms at the Inn!! ….Benedict and the hens were out to free range for the day, as the patriarch of the flock danced and strutted to remind the ladies of his presence…chicken feed was scattered about to supplement their free ranging…the dogs were fed…and so on, and so on. Finally, it was time to sit with a cup of coffee before starting out for the rest of the morning chores. 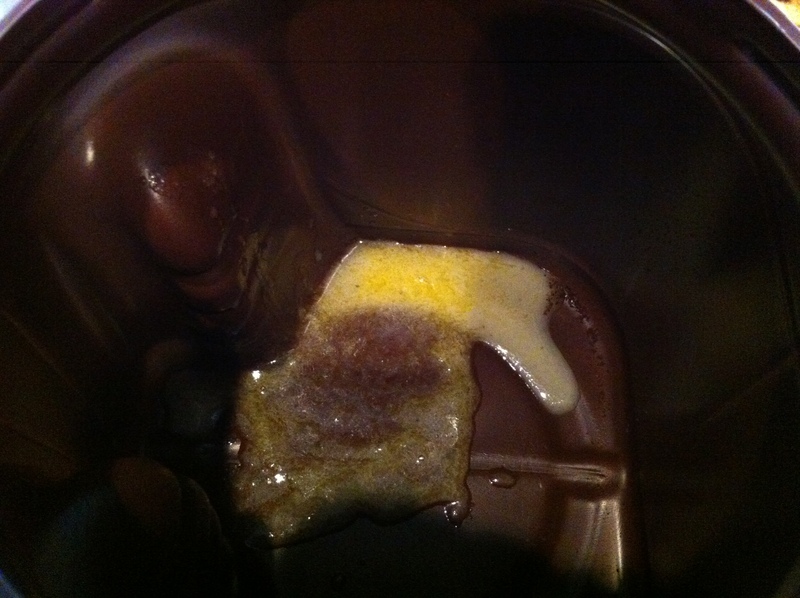 As I was pouring my cup, WHAM!!! A loud, familiar, yet more striking, noise came from the windows facing northwest. The man who really tames this forest, looked out and confirmed a bird had flown into the solid illusion of open space. 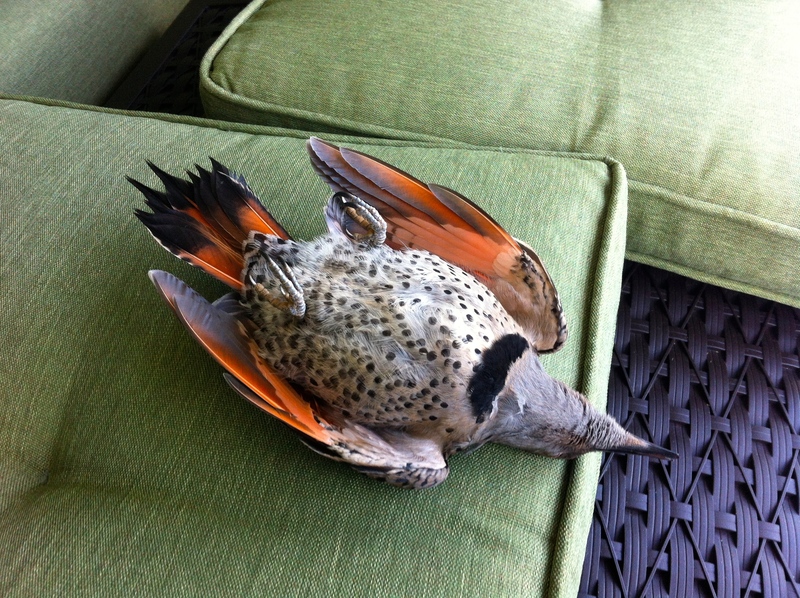 It was laying on a cushion from our patio swing. Any bird that flies into the window is an urgent concern to me. 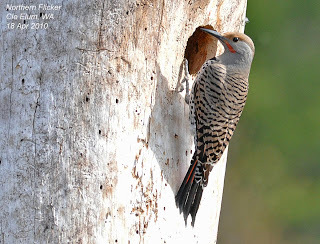 Given time, and the safety of a secluded environment, most get over the confusion of what is probably a massive headache, and are able to be released back to their avian lives. 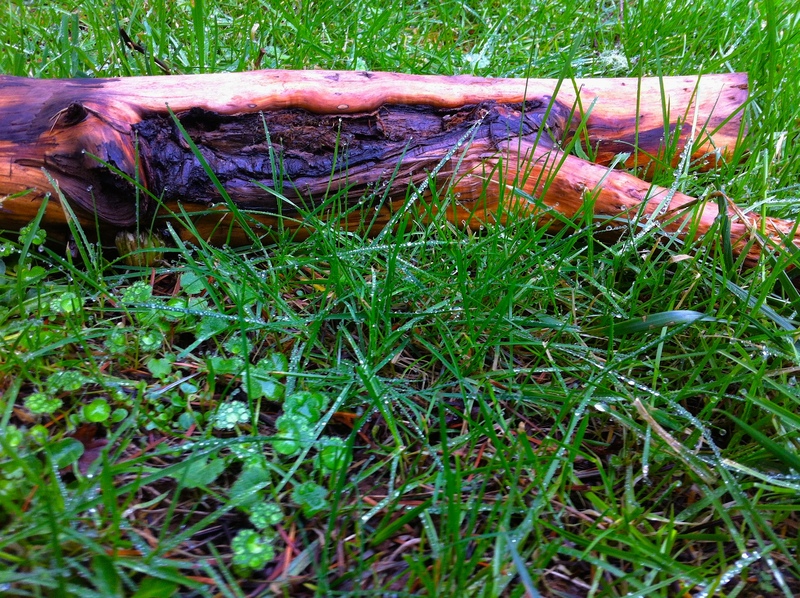 Unfortunately, this beauty was laying on its back, feet curled….lifeless. As suspected, it was a big bird. 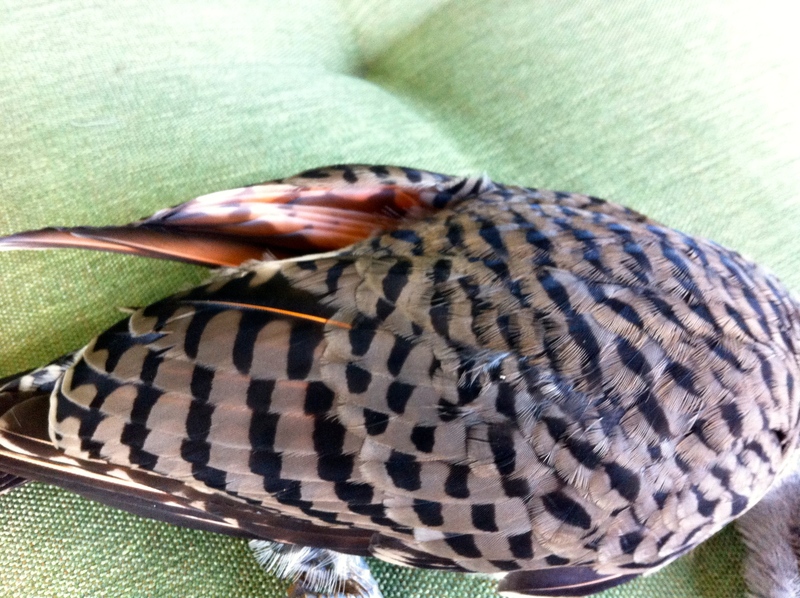 Normally the beauties hitting the windows are more like finch size…this one was dramatically larger…and so beautiful!! God is quite an AMAZING artist!!! She was called a Flicker. She was an ant eating woodpecker. She was a welcomed friend that I would frequently see, and hear on our trees. I marveled at her beauty from afar, and am totally amazed at her stunning beauty at close examination. 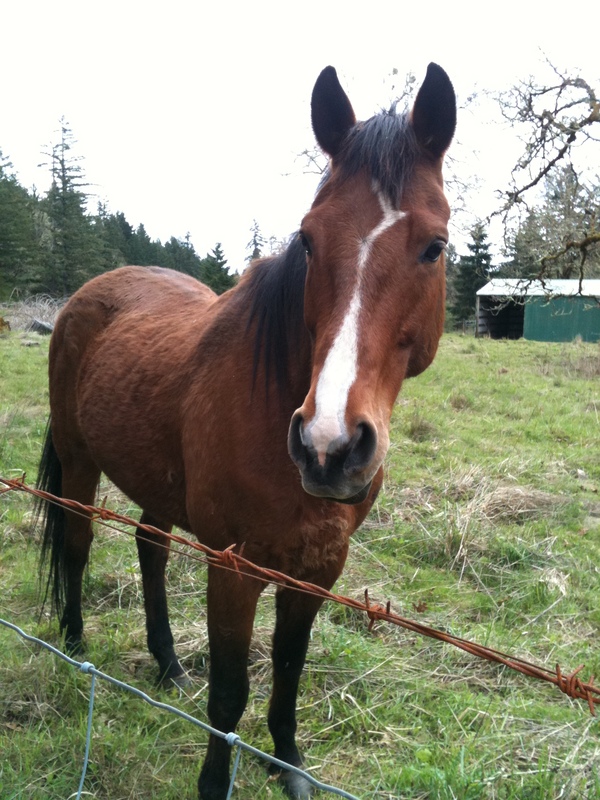 I will miss seeing my friend in the mornings, and the early evenings. I will miss the familiar knocking that causes me to look up and seek a glimpse of her. I hope she doesn’t have young ones in a nest somewhere waiting on her return, it is later in the season so hopefully her young have left the nest. Photo by Dennis Paulsen, posted on Slater Museum of Natural History website. Thank you for sharing my morning! ****UPDATE***** I realize I left you all with the sadness of the morning…let me add a little encouragement with some light-heartedness…how about the newness of life beginning with this cute little critter…. A Pig and a Chicken are walking down the road. Here’s something else that I find very humorous…. …Benedict!! 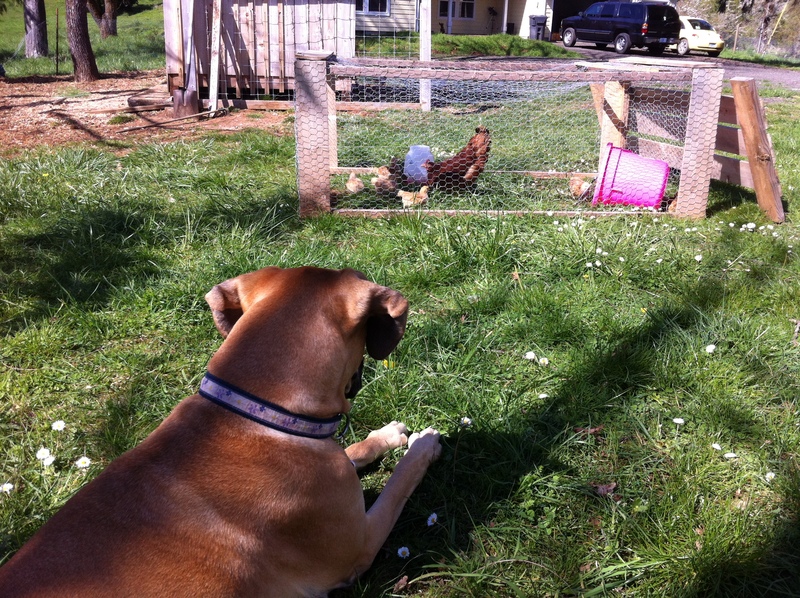 Our gentleman rooster kicking back and spending time with mama hen, Chardonnay. 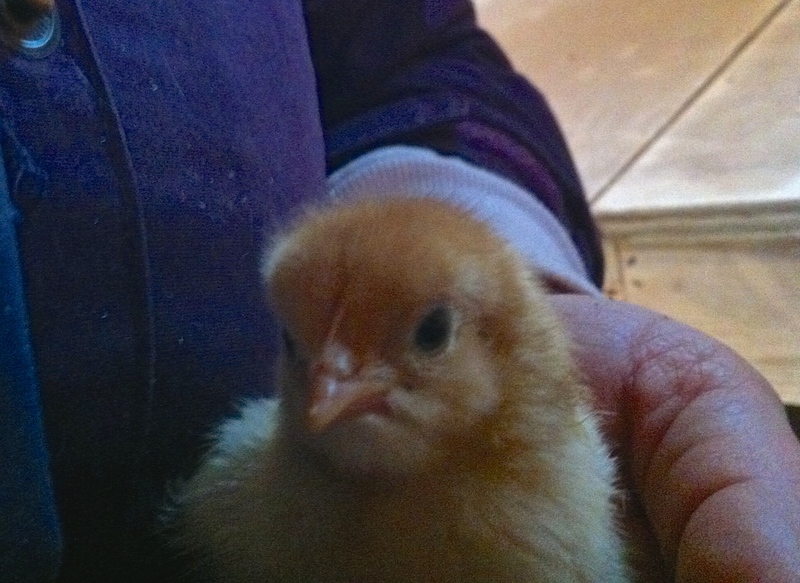 She’s been broody lately, but non-committal. She’ll sit for a couple of days, then I find that she has switched nests. I’m fine with that as I really don’t want more chicks right now. I think Benedict misses her!! 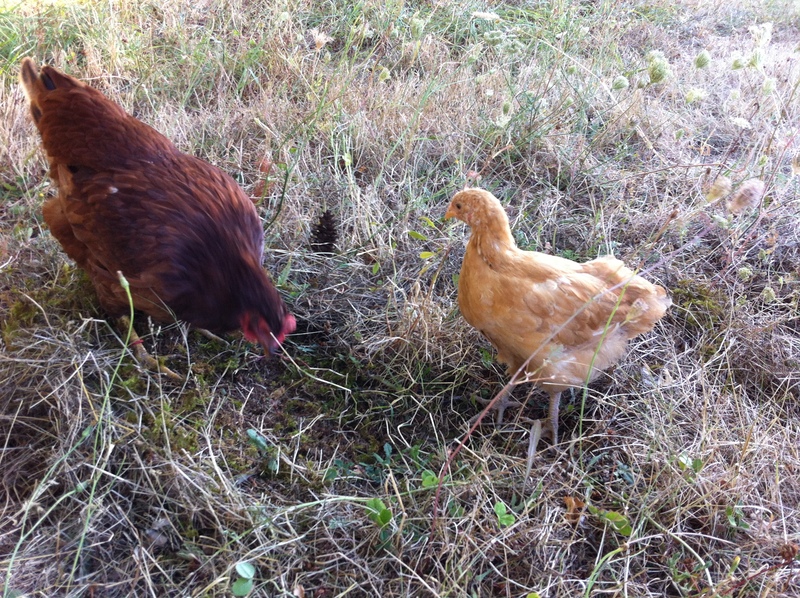 With mama hen broody, I don’t think she is laying right now which is totally fine. 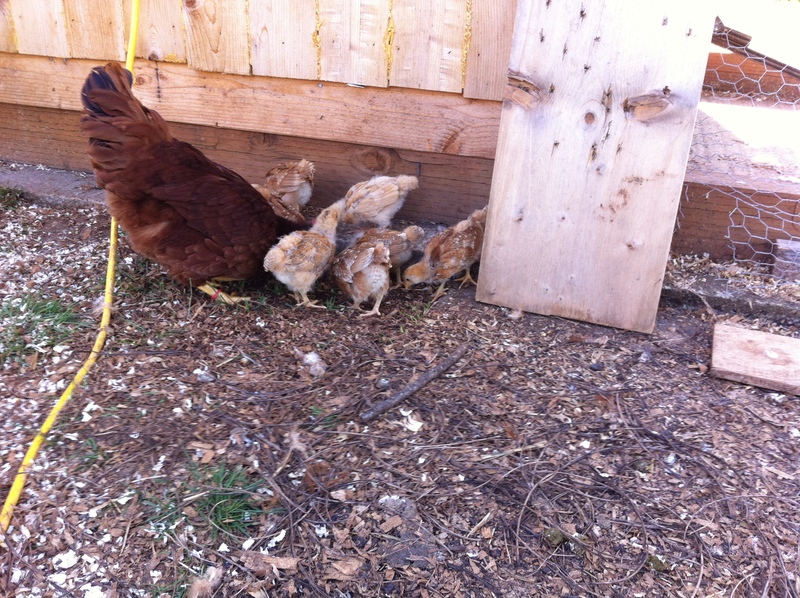 Out of nine laying hens, eight are very active. 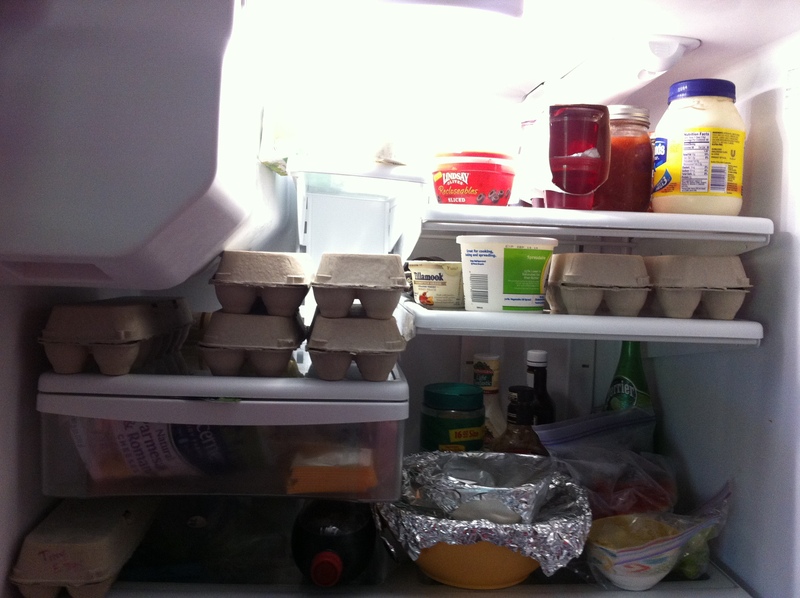 I have more eggs than I know what to do with. Here’s a peek into my fridge…. 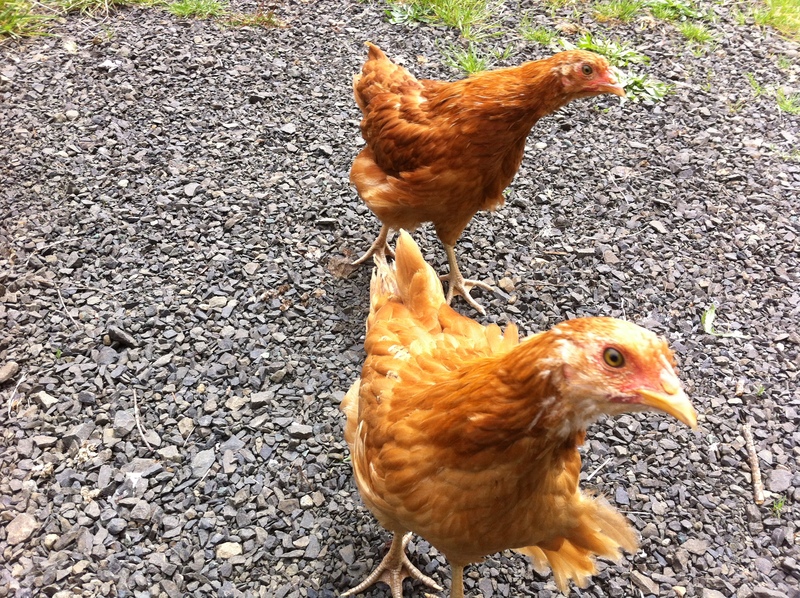 ….with four more hens coming of age (remember the Littles), I’m going to have to open an egg stand at end of the driveway! I’ve read of those farms that will have an “on you honor” system wherein they have a cooler with their eggs, and people just stop and pay for what they take. I may try something like that. 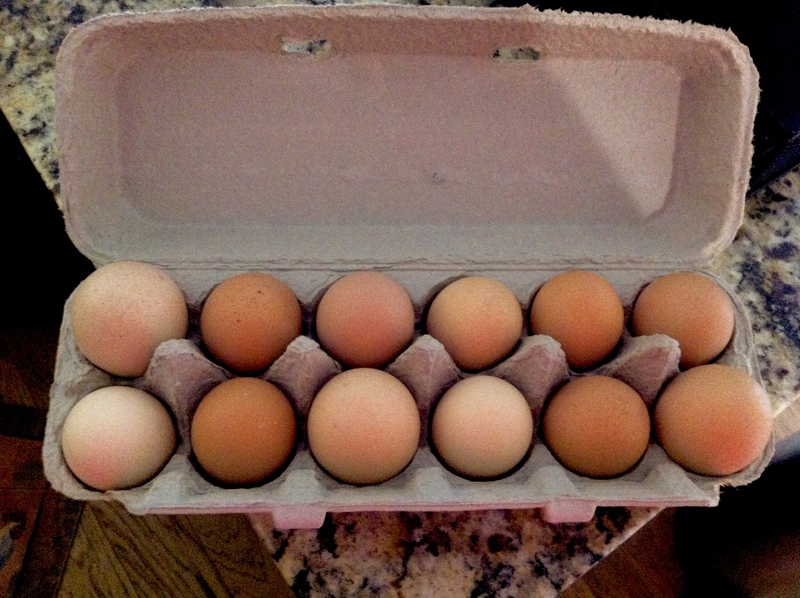 I figure, if someone needs to steal a dozen eggs, then they must be really hungry and they can have them for free!! Speaking of the Littles (aka the Muppets)…..
…they’re not so little anymore! Can you see the three young roo’s in this bunch? Their plumage is really becoming apparent, yet, at this point, I haven’t heard that tell-tale croaky call that shouts they have come of age. Benedict does do a good bit of chasing them around, so the day of reckoning is close at hand. Other than that, the flock is basking in the joy of summer. They lay in the sunshine and spread their wings wide, then shuffle, shuffle, shuffle in the dirt allowing themselves a good old fashioned dust bath. In the heat of the afternoon, they find a well developed shade tree, or hang out wherever shade is cast. The flock freely moves about, picking the seeds off the mature grasses, and wait for me to come out with discarded fruit, or leftover corn that may be hanging onto a half way eaten cob. They stay up way past their bedtime, since the sun set after 9:00 pm, and wake up demanding to be let out of the house at 5:15 am every morning. They thoroughly enjoy their remodeled house, and complain loudly when something disrupts their solace. Life is good! 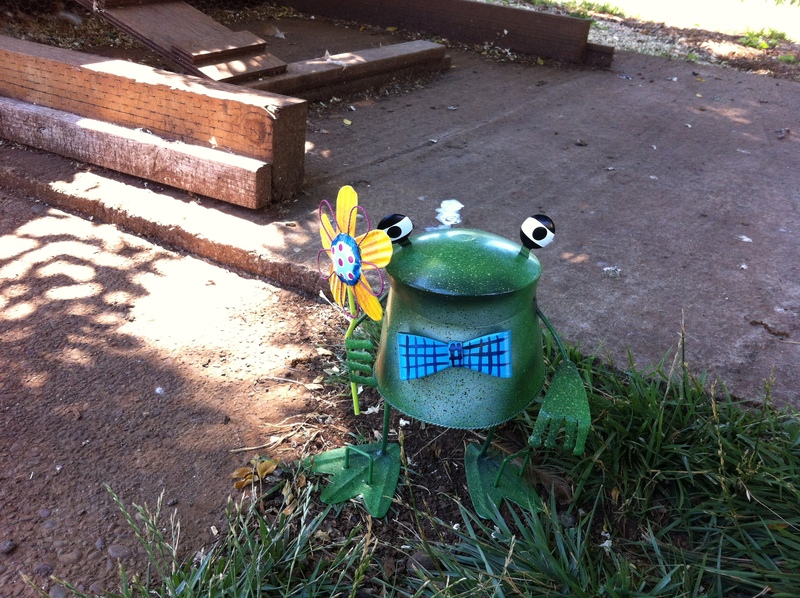 Oh, by the way, they have a new friend who greets them as they enter their house…the first of what will become a collection to garnish the outside perimeter of their home…. Thanks for taking a walk with me today. Have a great, and wonderful Sunday!! “HEY…WHAT WAS THAT CROAKY SOUND COMING FROM THE LITTLES?” Seriously, just right now…..oh boy!! My hens have been talking to me, very clearly. I can hear them, and their requests have not fallen on deaf ears. Okay, before you call a crisis worker, let me explain…. …chickens have a way of looking at you, an impassioned blinking of their eyes, and a subtle, sweet, higher pitched cooing of sorts that lets you know they have something to say. If you listen, really listen with your eyes, ears, and your heart you can start to understand what they are saying. 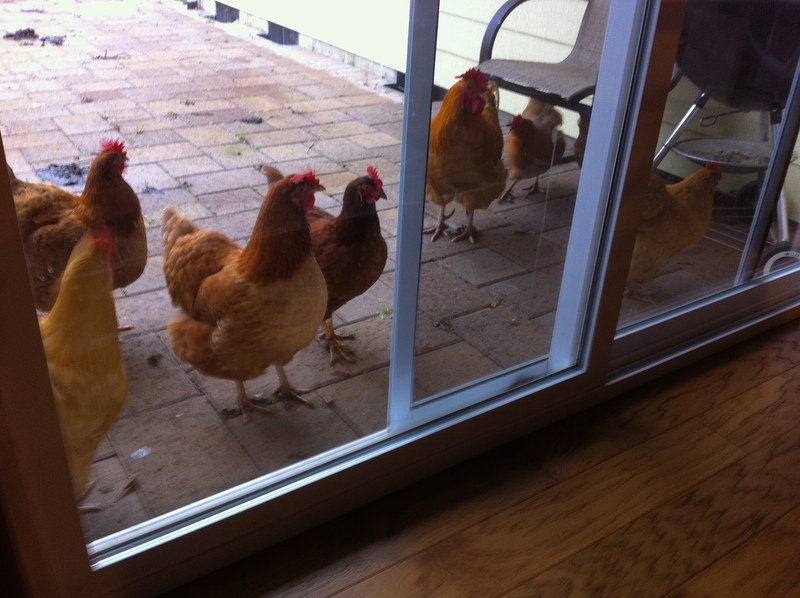 My chickens were telling me that their home was no longer inviting. 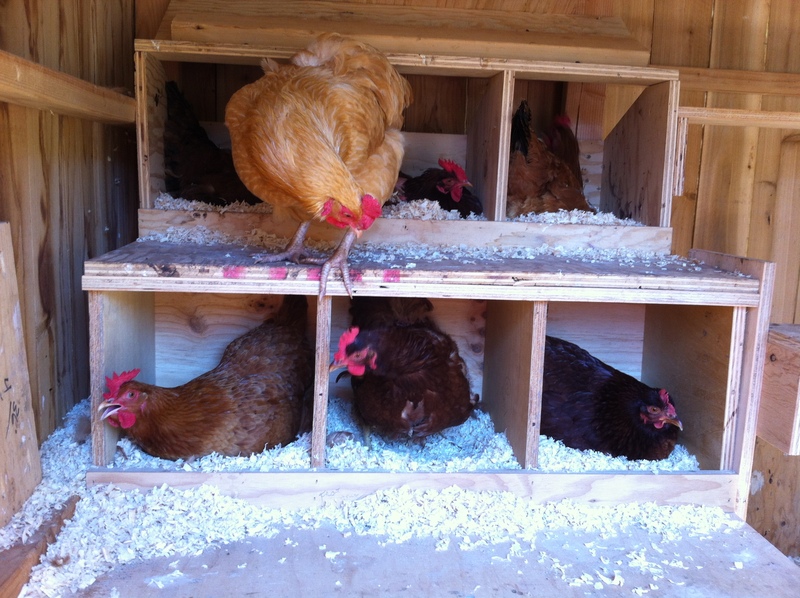 Given the addition of the, now-laying four Middles, to the, already six laying Originals,…and four near-future-laying-hens better known as the Littles, three nesting boxes were no longer adequate. The ladies were complaining. First of all…can you imagine having to wait your turn while needing to lay an egg? I don’t think it’s too comfortable…and neither did they. We had A LOT of complaining going on and rightly so! I drew up the plans, and the remodeling began! 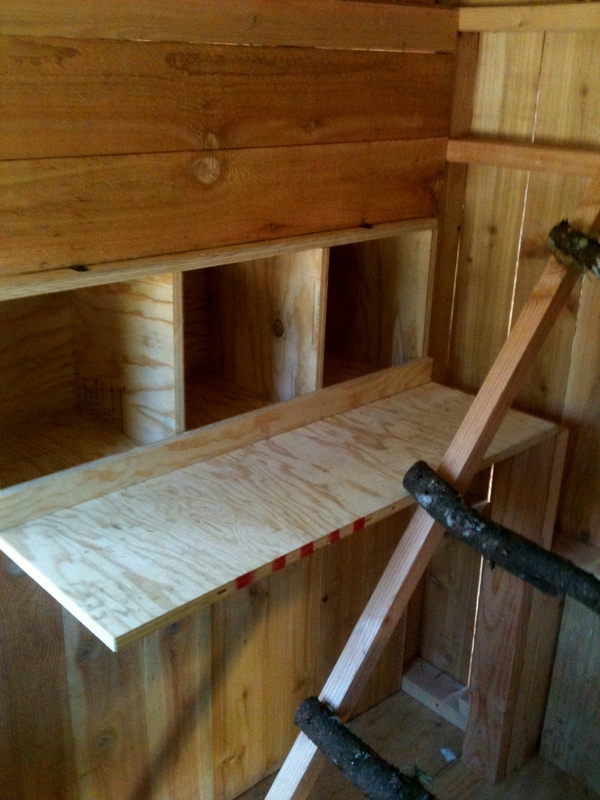 My idea was to create a tiered nesting box area on the left side, back wall. The bottom level would jut out creating a ladder of sorts for easier access. The top level boxes would sit flush against the wall. 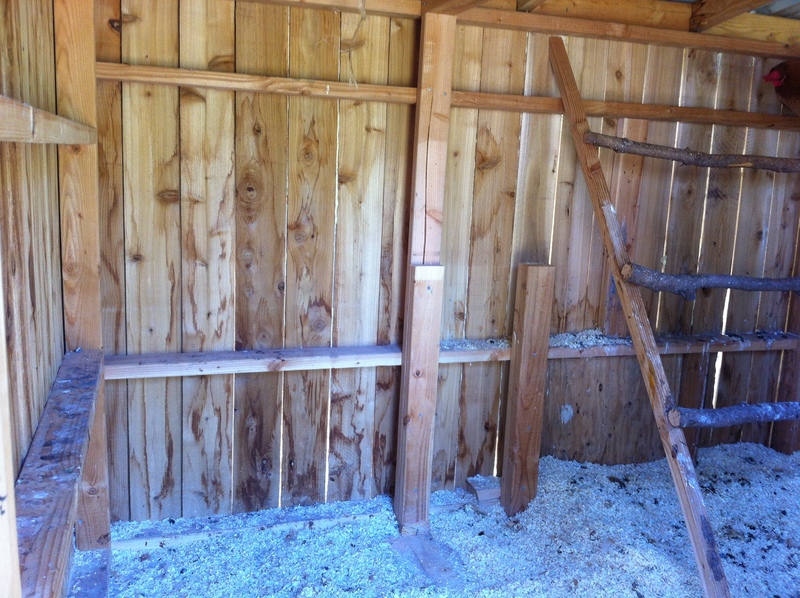 My hope in this also was to create a poop protected area underneath the nesting box area for those who might want to snuggle into clean(er) shavings to take a dust bath or just take a nap. I have found that not everyone wants to roost at night, some prefer to nestle in. 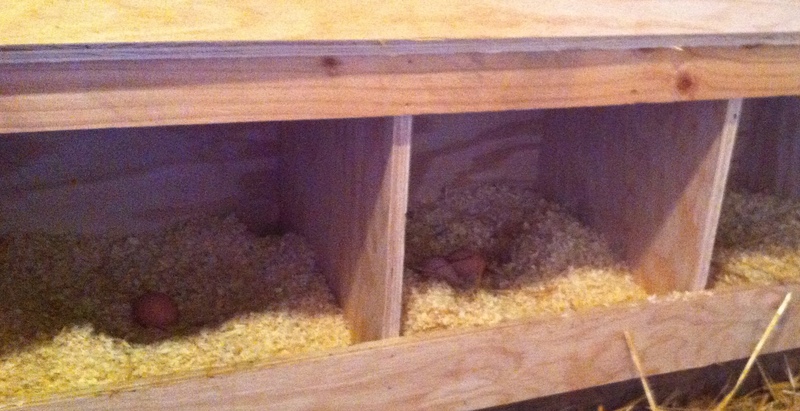 So, Tony and I…Tony…built three more nesting boxes, and in they went! Stamp of approval…that’s Mama hen, Chardonnay, nestling in. 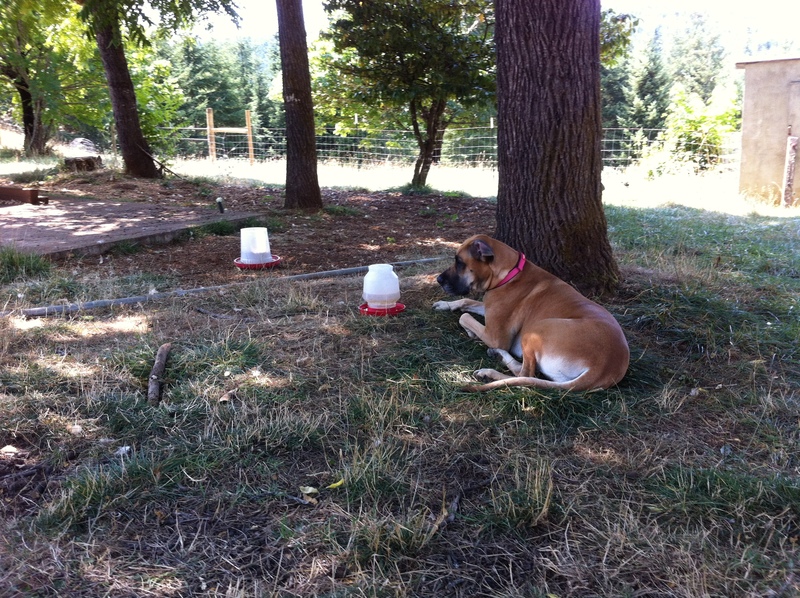 We had a constant companion helping with the process…. 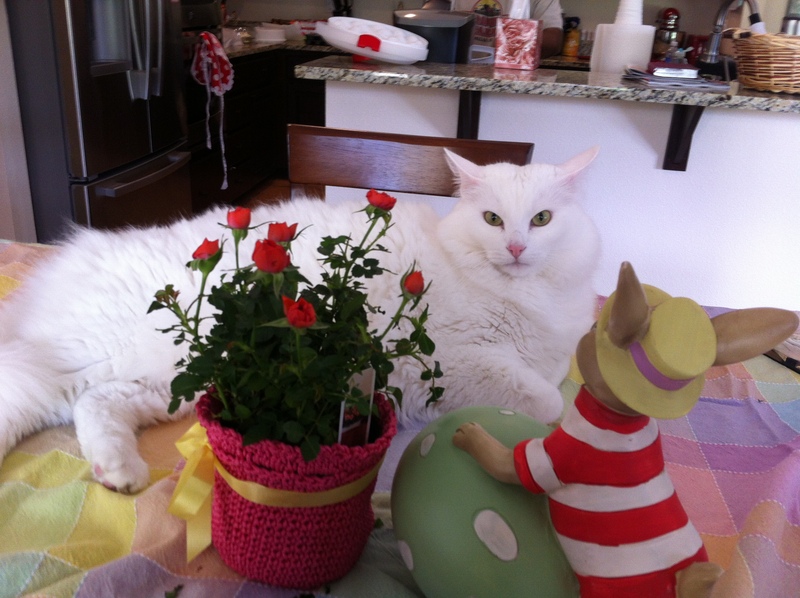 ….she supervised the entire project. Even though she didn’t like the sound of the drill, and complained her way through it…she wouldn’t leave..hahahaha! 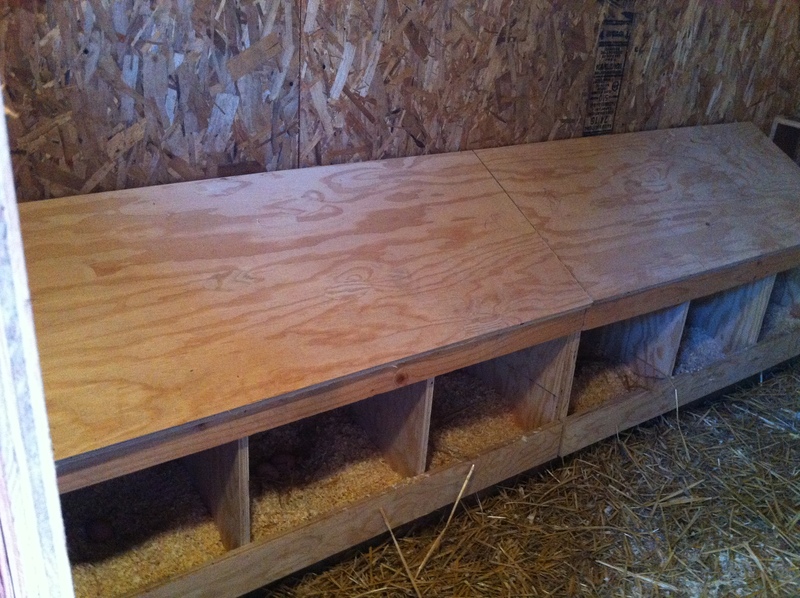 After the nesting box area was finished, we started on the rousts. We decided to change out the Douglas Fir limbs to wooden planks. I believe they are happier not having to balance all night, and are resting better. I don’t hear the early morning (like 3:00 in the morning) carrying on anymore…now it starts about 5:30. I think we are all happier!! 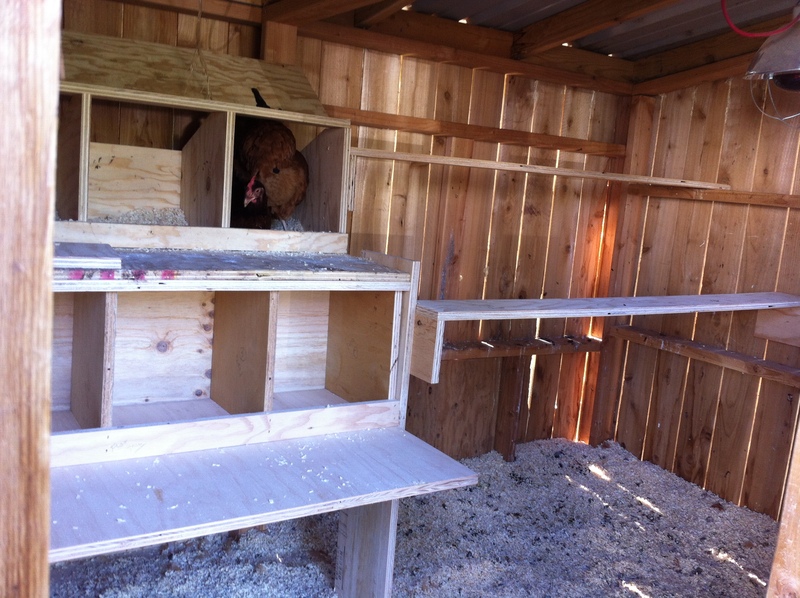 New nesting boxes + new roosting boards = happy campers. The first night after the remodel. 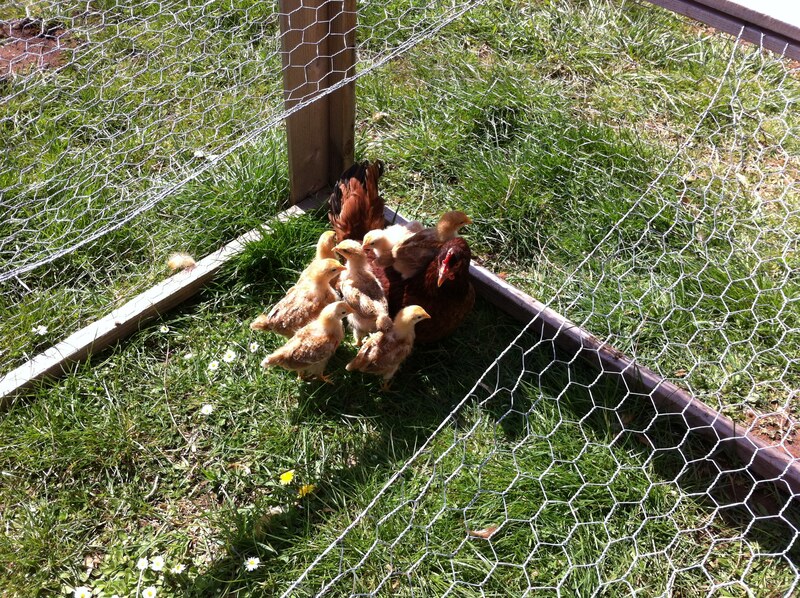 …yes, those are the Littles, now totally integrated within the flock. They are finding their place in the pecking order, and are starting to roost on the boards with the older birds. Harmony in the merge?? Not quite yet achieved…but they are working it out! 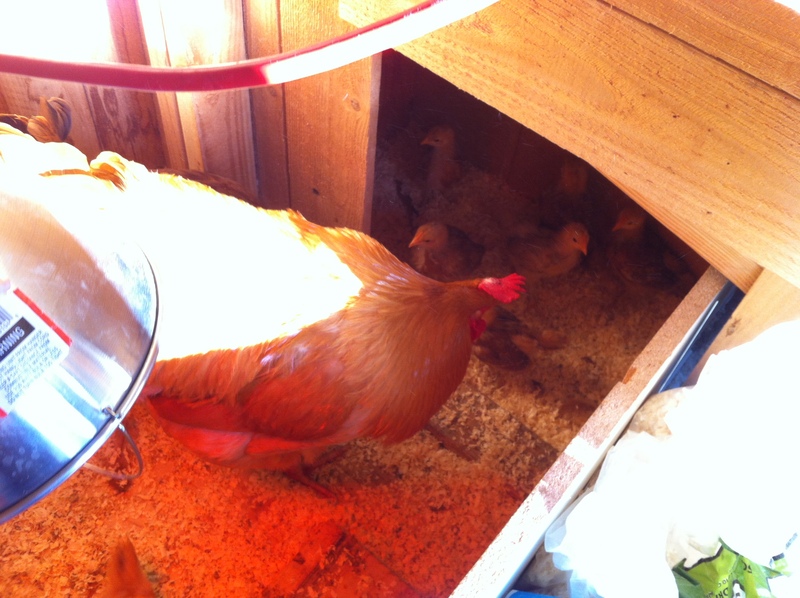 As for the success of the additional nesting boxes…A LOT less loud complaining from the hens…and MAMA CHARDONNAY IS BACK ON THE NEST!!!!! In that vain……our family would like to say…HAPPY FATHER’S DAY! !…to any dads who may be visiting the farm today!! We hope you have an awesome day, week, month, and year!! Take care all!! It was like any other morning. The air was cool and filled with the melodic symphony of the many different song birds that make their home in the forest. The resident bullfrogs croaked their low drone-like percussion, and the neighboring peacock rang out like the clash of a cymbal, carefully placed within the orchestra. 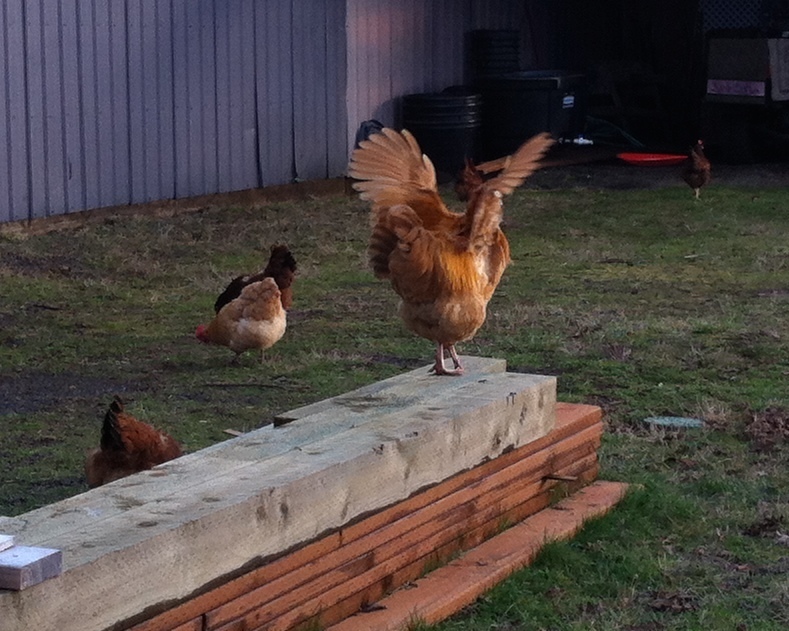 Benedict, our resident rooster, added the occasional trumpet-like excitement as the song continued. There is just no better performance to be heard than this early morning ensemble. The flock was happy that morning, the air was cool, but the sun was shining. 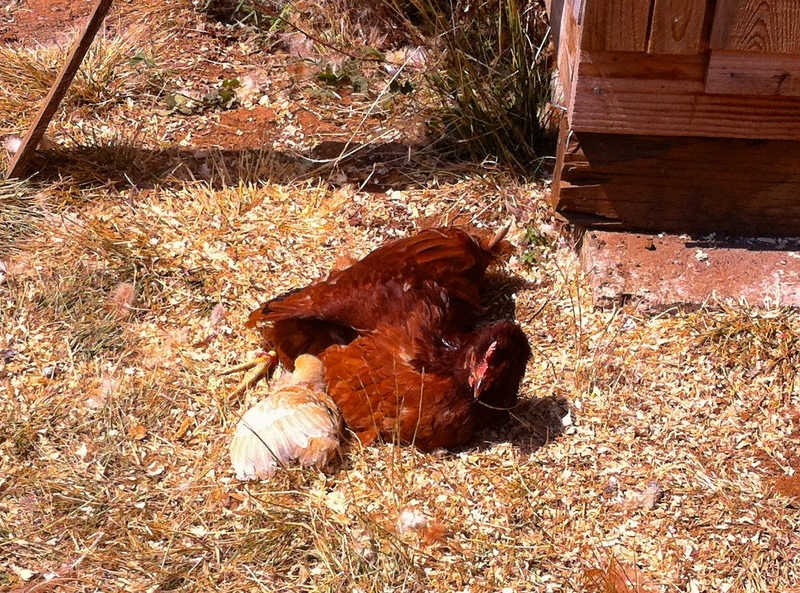 The hope for the day was warmth to bask in…add a comfortable dust bath, and their day would be awesome! I opened the door, and the flock filed out in line. After cleaning up around around the nesting boxes, and taking a quick look, I left my feathered friends to do their early morning dance as the symphony played on. The flock during a calmer day. About 20 minutes later, the melody changed. Rather than the calm, continuous song, the tension had risen. 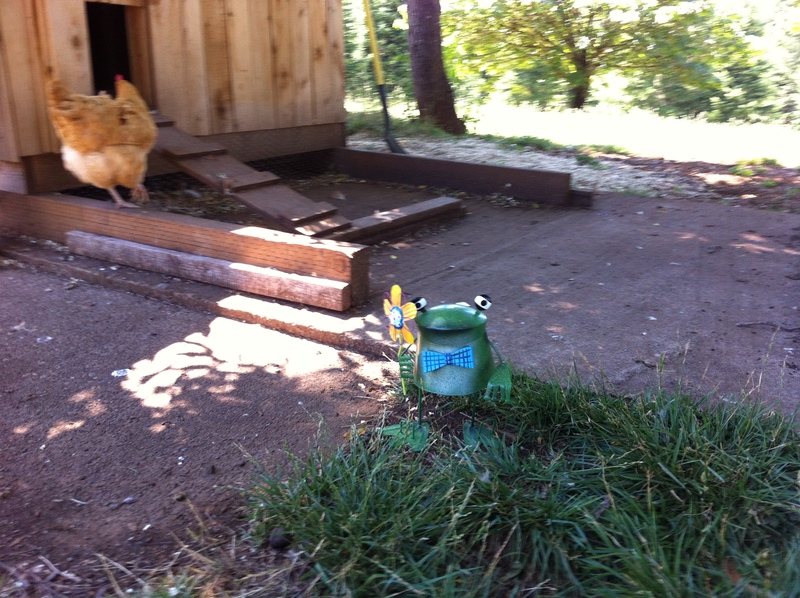 Benedict’s trumpet had become urgent, and the hens were now chiming in loudly. The dogs, who were inside the house, ran to the windows barking excitedly. Opening the door, the sound was deafening. I ran out to see what was going on. so they were still safe in the house. The flock had dodged another bullet! Chardonnay (Mama Hen), Kermit, Miss Piggy, Statler, and Waldorf!! Free Ranging and feeling great!! So, as they’ve entered their awkward stage…. 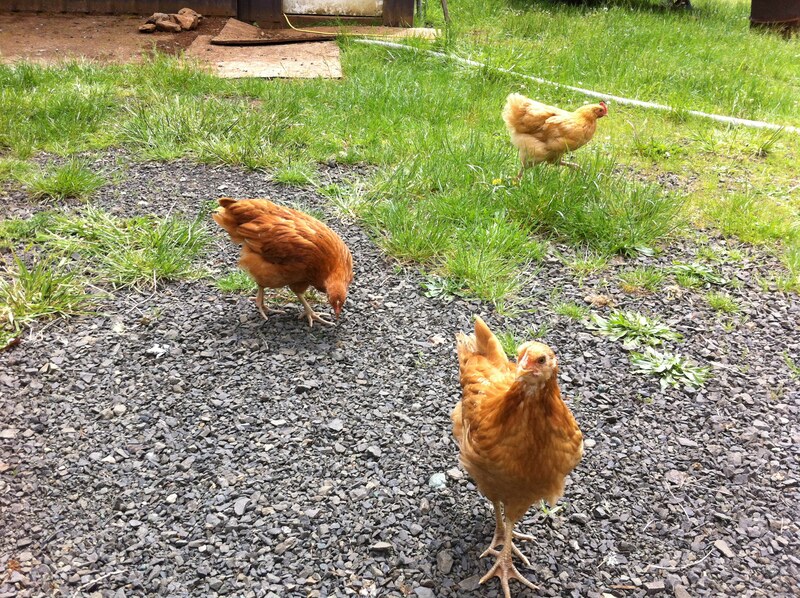 …..they have also found freedom to traverse around the farm as they see fit. 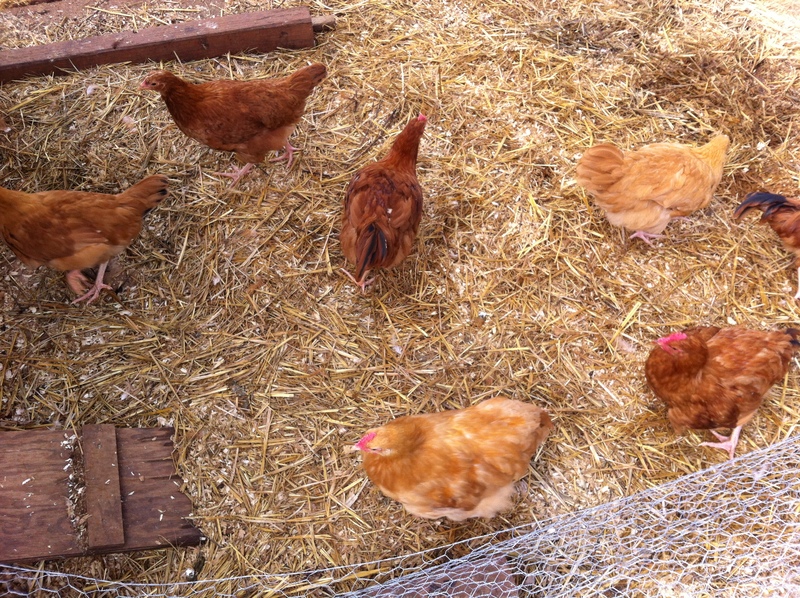 The Littles are very integrated within the older flock and move around and within freely, although, they are the Littles…the newbies on the block…if an older hen wants to stand where they are, or eat what they have found, they do get “run out of dodge” for that moment. The word “hen” doesn’t really reflect the true nature of a female chicken’s attitude sometimes…they can be pretty…uhhmmm…what’s that “B” word??? Yeah…that one! 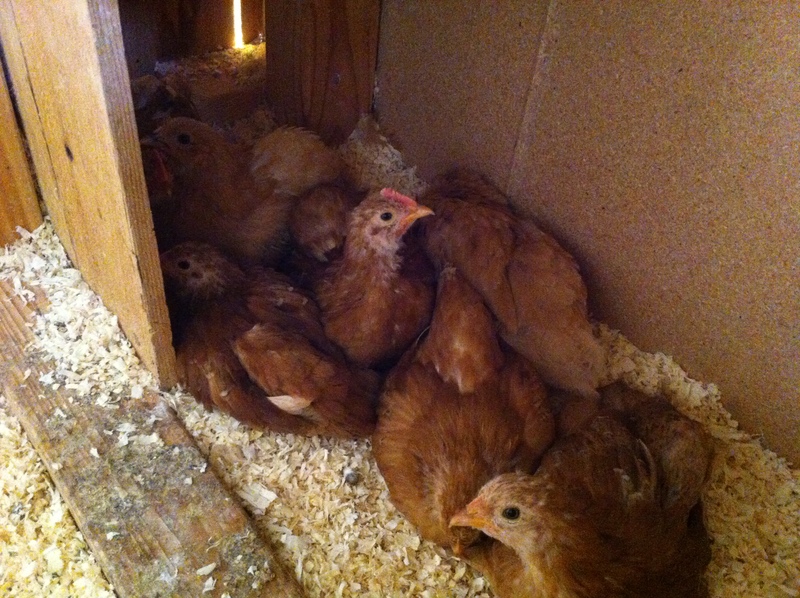 This Little flock within the flock are a pretty close knit group….. They love to huddle together. Now that’s a nice pile of Littles!! 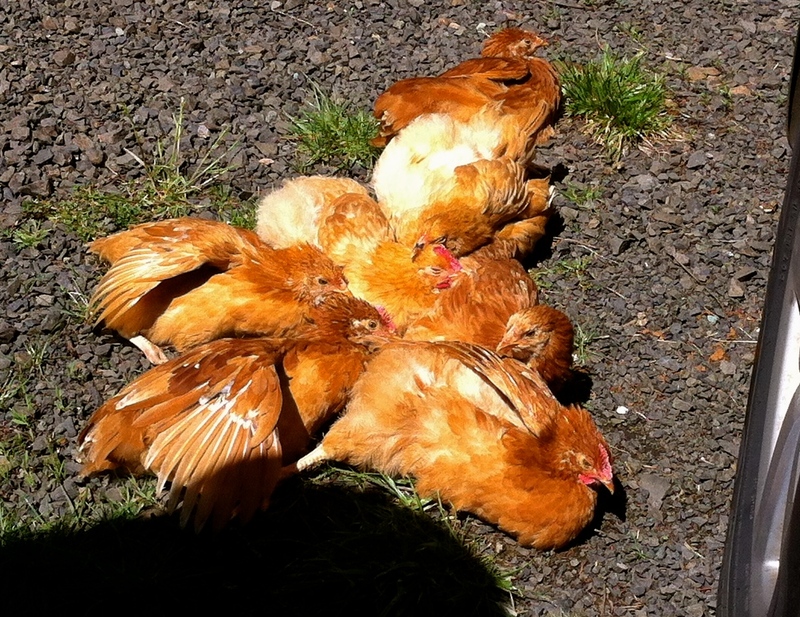 ….and they love piling up next to each other to soak in the warmth of the sun. The older groups do this also…but usually in groups of 3 maybe 4 max. 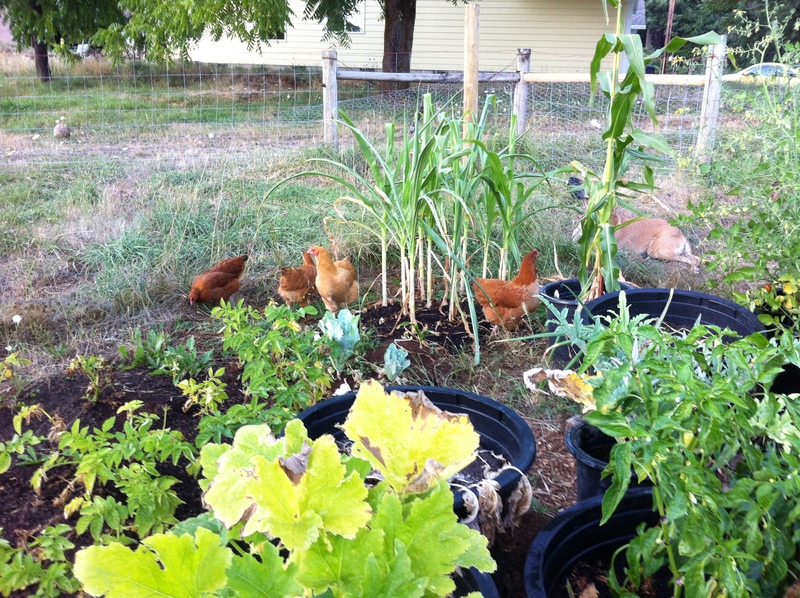 The good news with this bunch…I have yet to completely identify a rooster (No, I’m not looking under their feathers!!) I have one that I suspect, possibly another, but none are standing out like in the other broods we’ve raised. 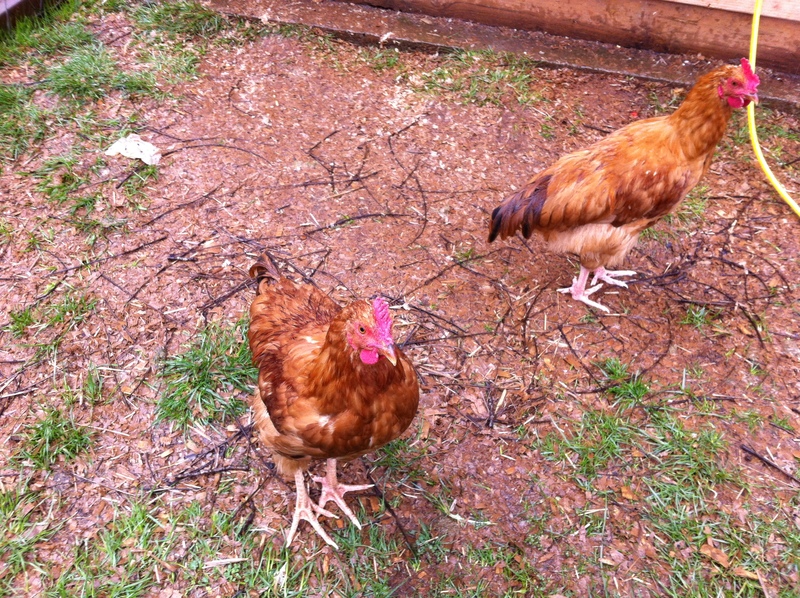 A couple of the Littles have a bit of a larger comb, but I have had that with hens as well as roos. 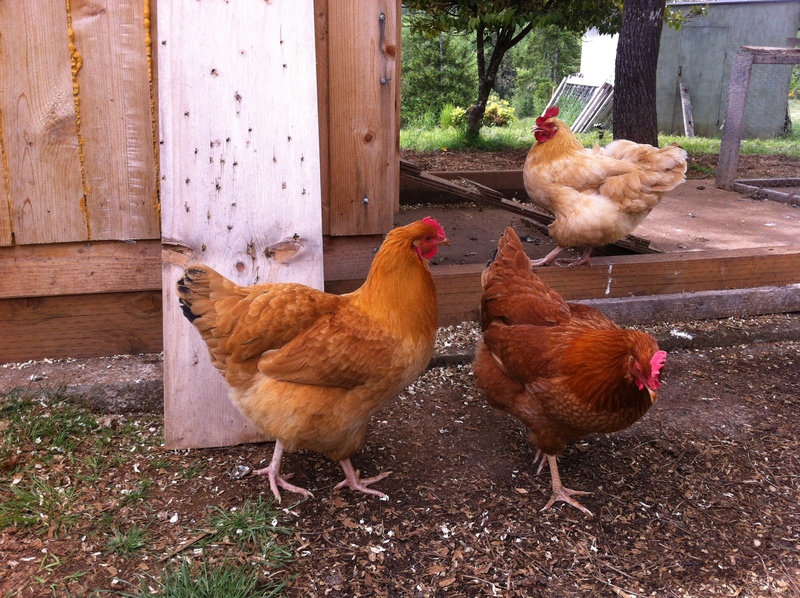 There is not the usual amount dominance posturing going on…a little, but young hens do that too. 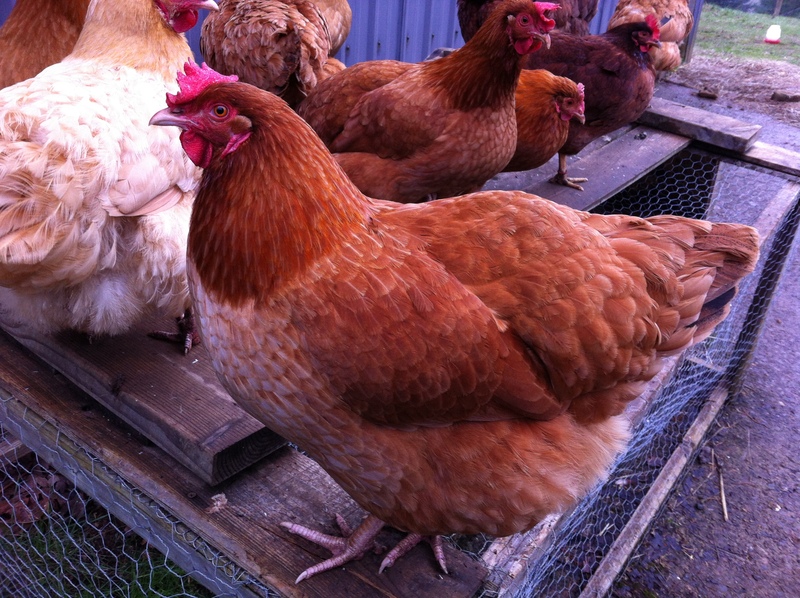 I’m just not seeing the difference in tail feathers…they’re mostly appearing like hens. Wouldn’t that be AWESOME!!! Hoping you will have a wonderful day today! Thanks for taking this hike through the forest! Great News! 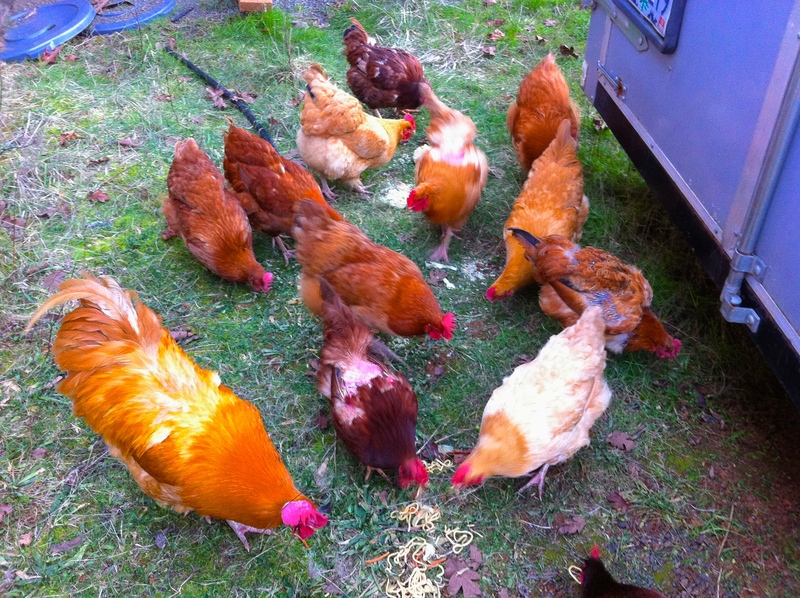 !…the “Middles” (formerly known as the “Littles”) have had a merging of the minds with the adult flock (the Untouchables) … they are now one cohesive flock with our gentleman Buff Orpington rooster, Benedict, leading the way!!! The Captain of this ship….the mighty Benedict! Two of the young adult roosters of the Middles. They were really handsome boys! 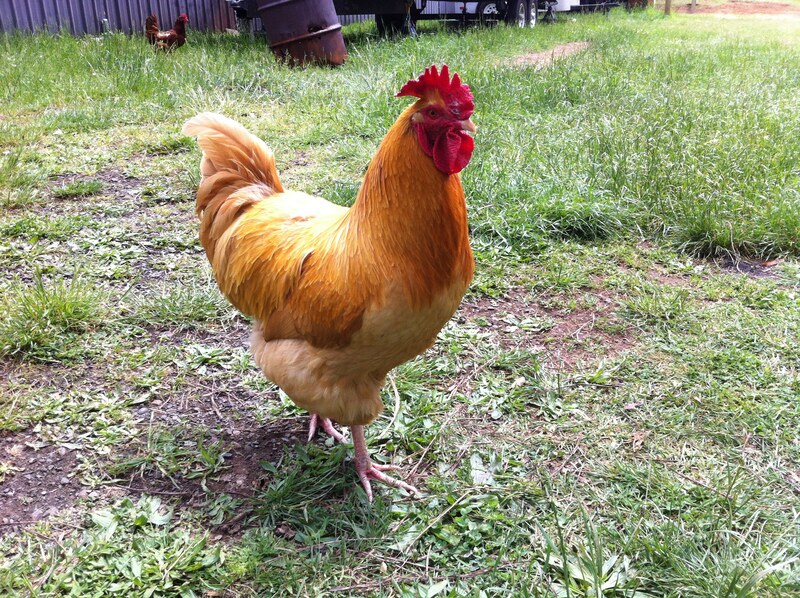 Buff Orpington / Rhode Island Red cross … a really handsome roo. …it became necessary to calm the flock. During the past few weeks, hens were on constant alert and flight from the rogue, young roo’s, and Benedict was extremely busy defending his fleeing hens from the pursuing marauders. 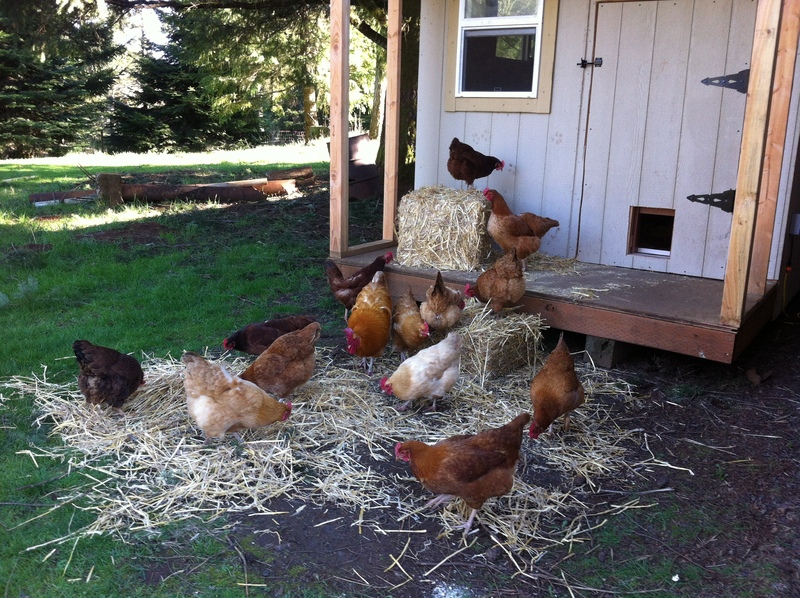 Egg production fell off drastically…not one of our feathered friends were happy. I had grown a little too attached to the “Middles” …. 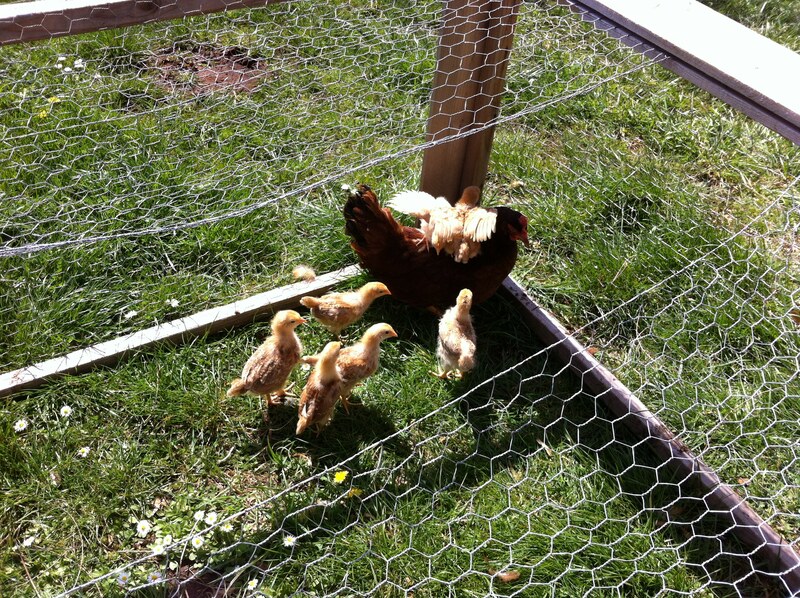 they were our first chicks to hatch on the farm … neither Tony nor I relished the idea of culling the four young roo’s. 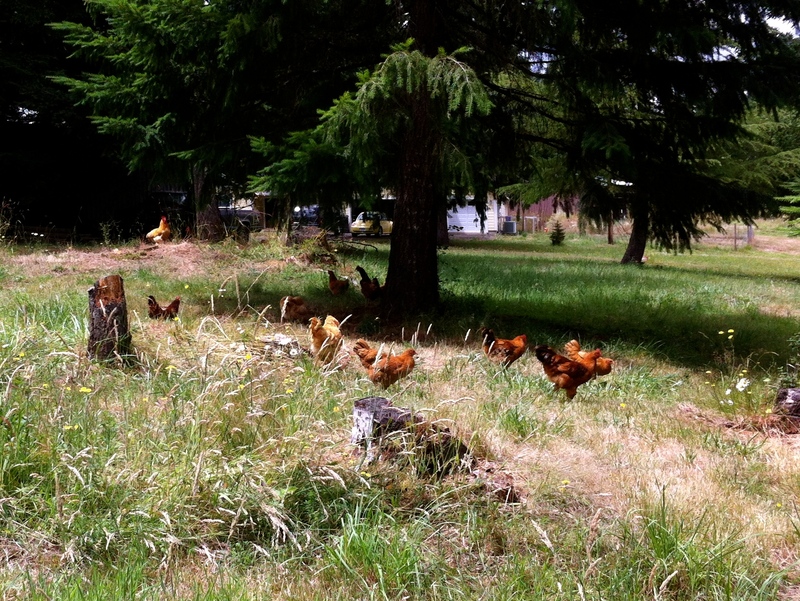 Our neighbors, on the other hand, were happy to fill their freezer with some additional poultry…so off they went. Even my little, Austin (the spraddle legged chick at hatching) couldn’t stay … I actually kept him for a little while longer than the others … but he was just not having a happy life with Benedict at the helm. Benedict is, and will continue to be, our flock’s leader. 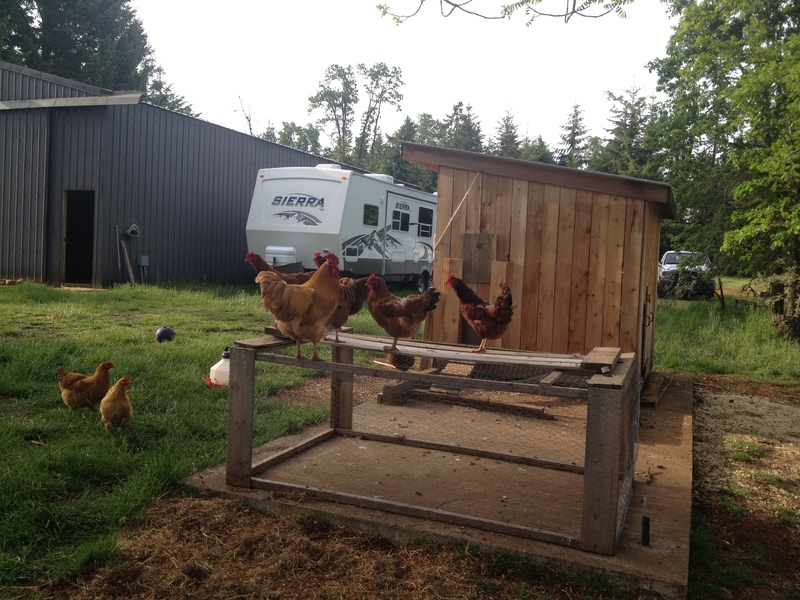 The four younger roosters had a good life, a great life really, free ranging as soon as their age and weather allowed … fruits, vegetables, and once even leftover salmon … then they provided for a large family … I feel good about that! 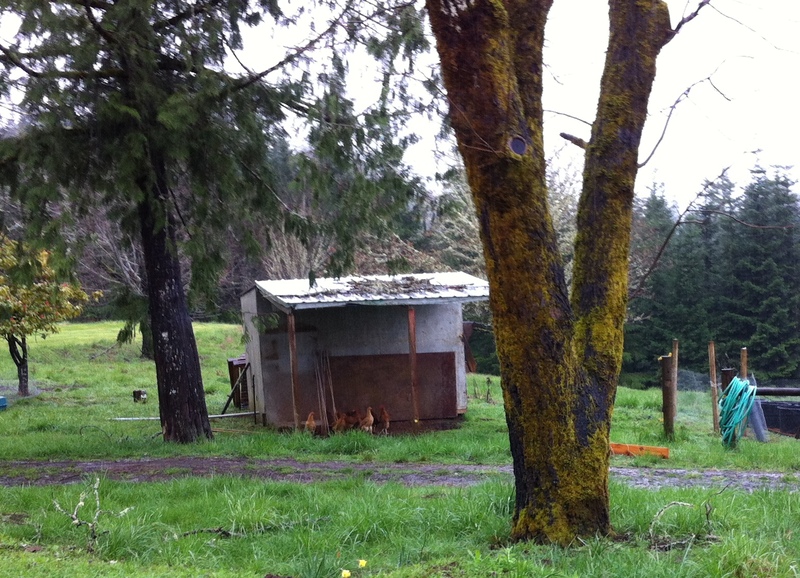 The flock chllin’ during an afternoon rain…EVERYTHING becomes a chicken roost. 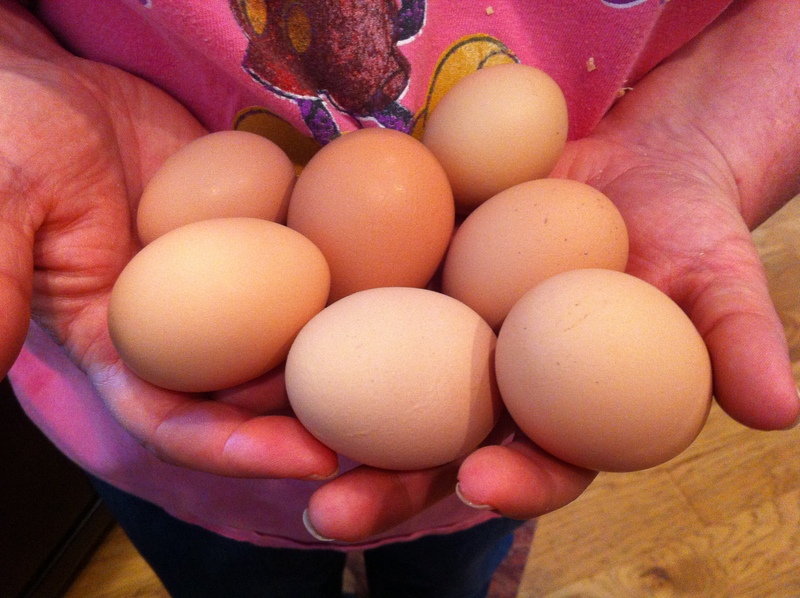 Egg production has risen once again … and the middle hens are now laying!! 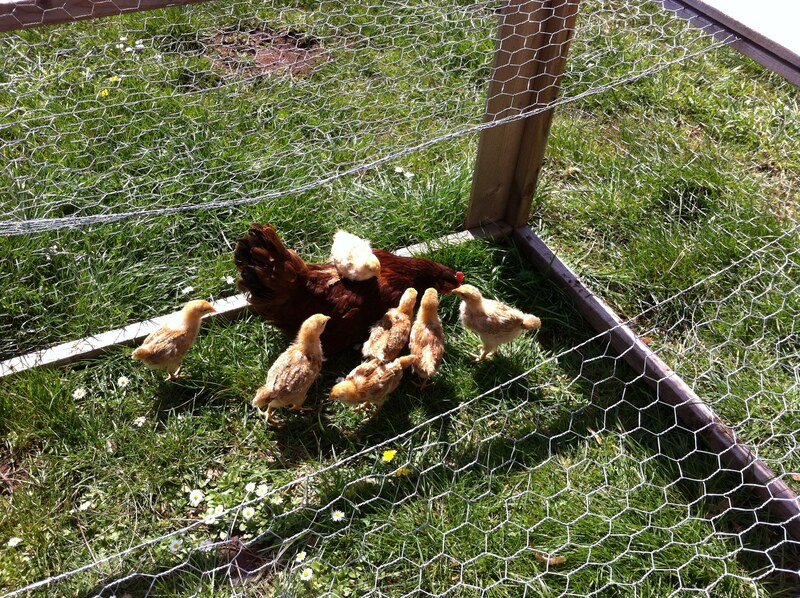 They are cohesive with Benedict and the other hens…their minds have merged into one flock!! And the “Middles” are now doing this……. A combo catch from the Untouchables, and the Middles! 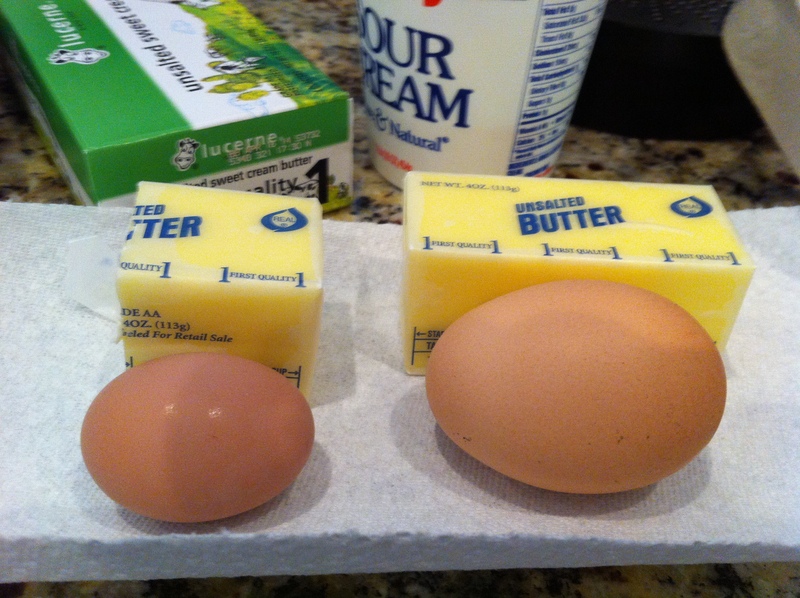 Who laid the egg on the right??? 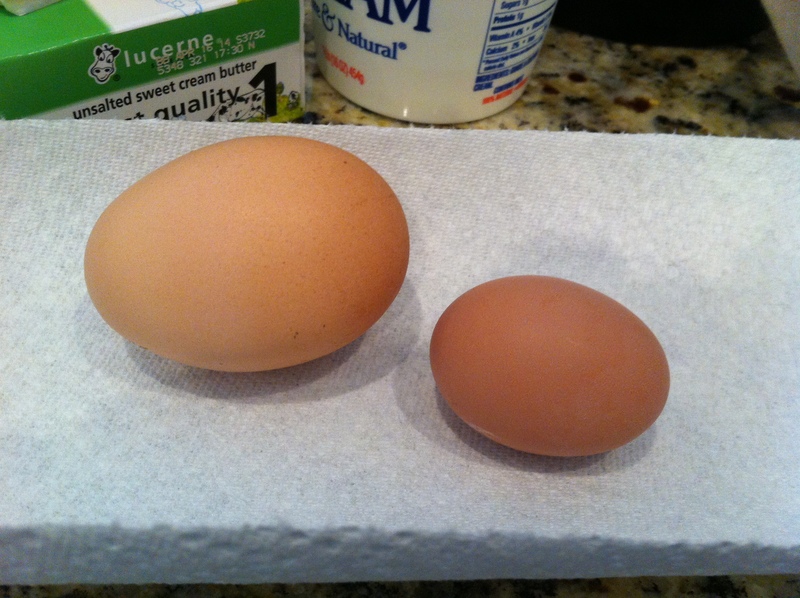 Newbie eggs are a bit smaller than the more…. sophisticated egg layers! 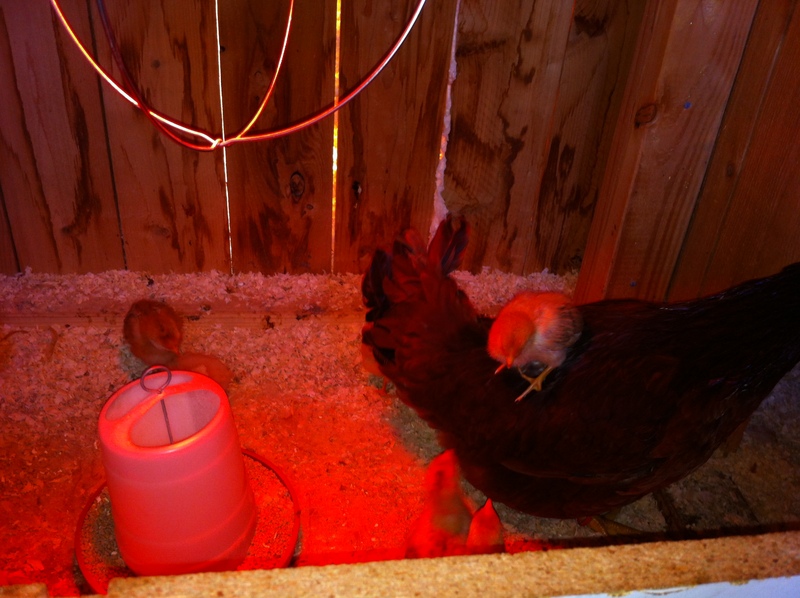 With all the winged gallinas feeling more relaxed, and the “Middles” now producing… we are now getting 6 to 8 eggs everyday….anybody want a dozen??? Hoping you all have a moment in the sun! Thank you for hiking through the forest with me today! 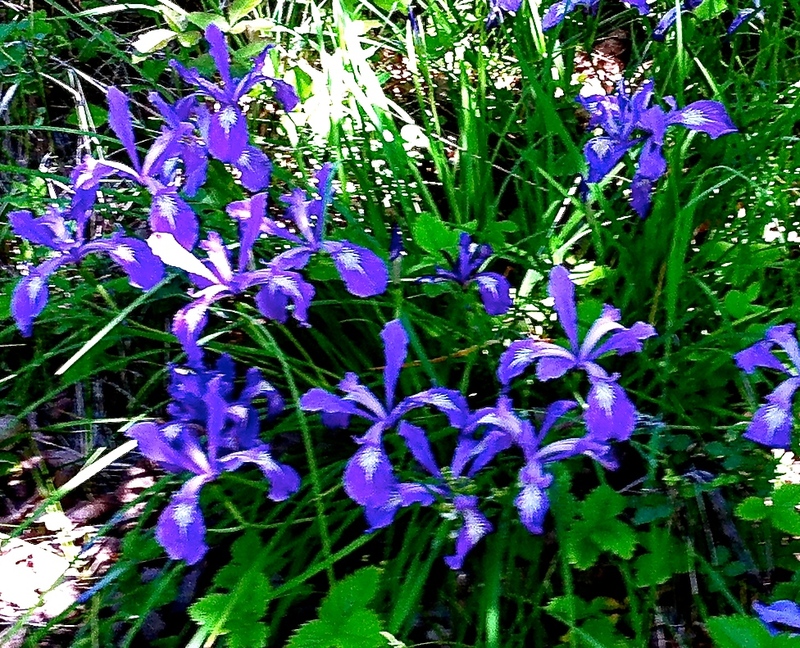 These wild Lilies are growing everywhere in the shady/partial sunny places right now. My thoughts have been so distracted as of late. Really!! Can’t the world just step aside and stop threatening to take time from us? Time from the needs of our farm, from being physically present to care for our family, from being able to take the time to grow and prepare our own food, from the ability to write a simple blog post. I’m sure most of us feel this way … this past week has been especially hard for me due to changes at work which will directly affect my position, and my availability for those things I just mentioned. My husband has felt it all along, but he is driven to be a great provider. He, with God’s great blessings, have made this whole farming thing possible…I do not say, “Thank you,” to Tony enough…not nearly enough. So life on this farm will be changing, soon. I’m going to have to figure out how to flip-flop some things, how to get ahead of the game on others, and how to get everything done in a timely fashion so that we are not eating dinner at 10:00 p.m. rather than 9:00 …. 7:00 p.m. which was my goal, definitely seems a bit out of the running, but we’ll see. Right now, through summer, the impact will seem less as the sun is up until about 9:00 p.m…it will be the dark, earlier evening hour seasons that will become much more difficult. Maybe this is the incentive I need to kick up my understanding and knowledge of an income producing small farm, and work towards that goal. I think that is a goal worth striving towards! In the meantime, I must remember that change does not inherently equal a worsening of conditions…it may even result in a more enjoyable life experience (in this case, at work.) And, since I believe that Jesus Christ is the author of my story…the Pilot of whom I seek to follow…the Protector of my home and family…and the Great Counselor from whom I gain wisdom and guidance…my family, myself, and our farm are in great hands!!! Nothing shall befall me that He doesn’t already know, and that He can’t handle!! 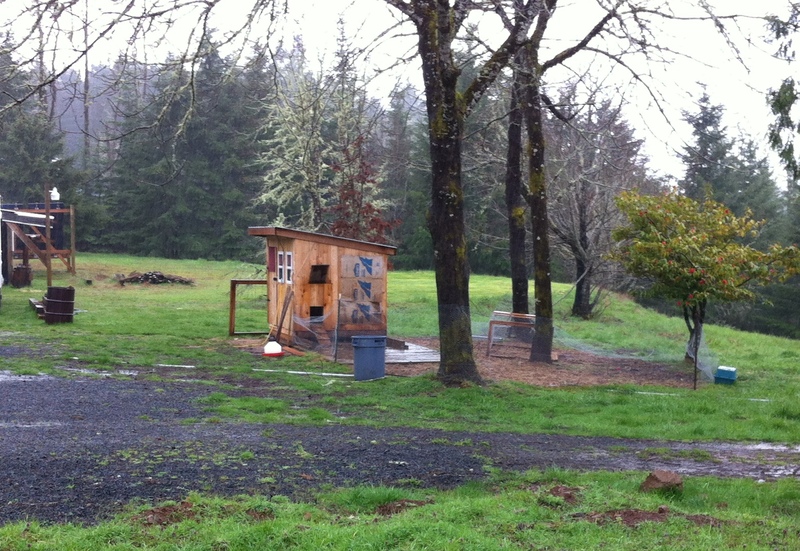 Please enjoy this rainy, spring day of Oregon….. Hoping you all have a wonderful day! 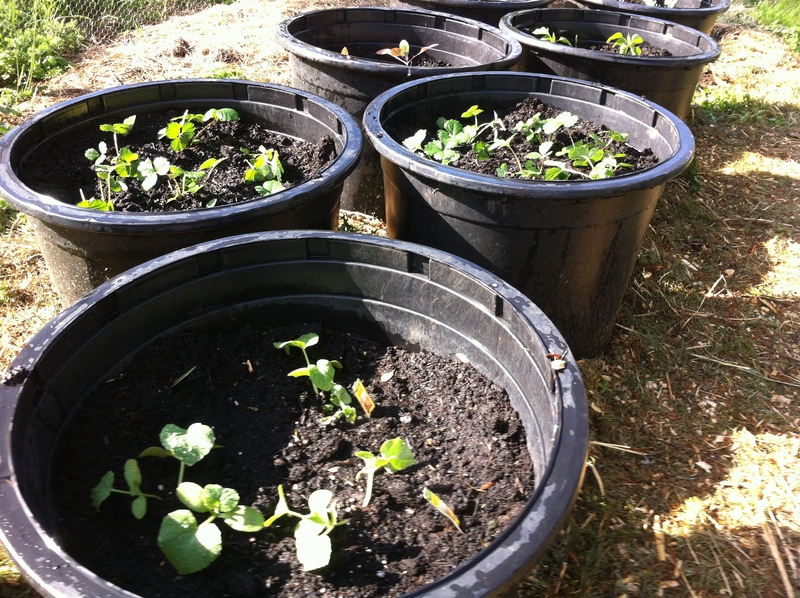 A farmers delight, a heavenly sight, a mix of sun and rain, a blessing for the growing grain….and weeds, and trees, and tomatoes, and…….. IT’S GROWING SEASON!! Enter the keep-working-till-the-sun-goes-down-eat-dinner-around-9:00 p.m. busy season. 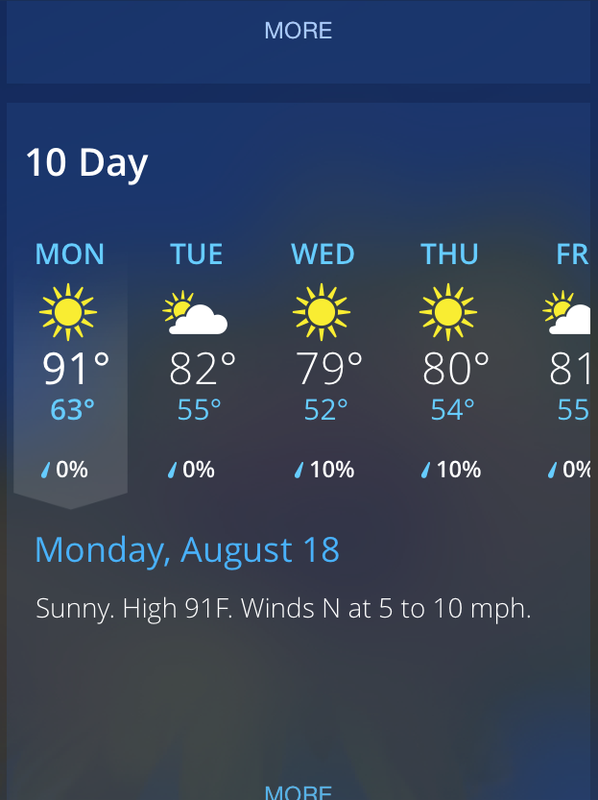 Well actually, in about a month it will be 9:00….right now it’s more like 8:15 🙂 I need to get my routine down a little better this year, and head inside in the late afternoon to prep dinner during the higher heat hours of the day. Otherwise, I find myself trying to throw something together around 8 p.m. or later. My goal is to have dinner ready to eat by 7:30 p.m. this summer…that would be a good change. The early evening hours hold chores. There are dogs to feed, the tidying-up of the chicken house (poop control, new water, food, and shavings in the nesting boxes, sleeping areas (for those who don’t seem to like to roost), and brooder area (if we have chicks…which we always seem to have chicks – thanks Chardonnay…oh and of course Benedict!!) Also, a nice, general tossing of new shavings really freshens up the place. 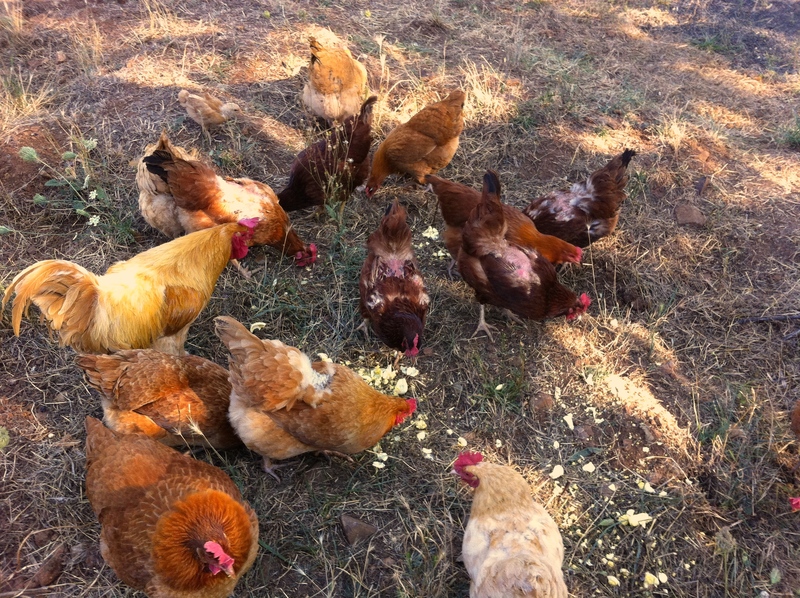 Benedict and some of his ladies…a little molting going on. 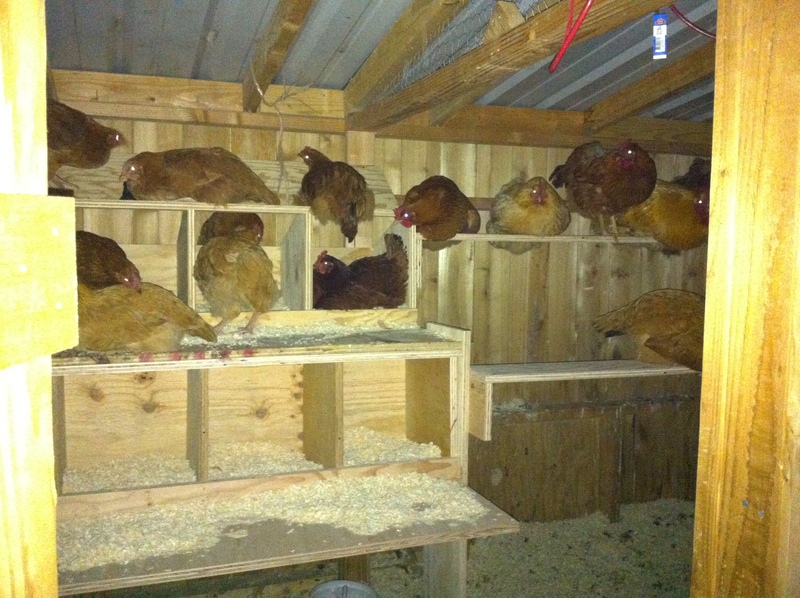 I prefer a “clean” chicken house (is there really such a thing) when the Roommies show up for their night’s stay. When the sun rises, it’s out to the let the Roommies roam for the day; a quick look, and removal of any poops in or near the nesting boxes, and a freshening of the brooders water (always seems to need freshening.) With the extra effort, we have very few eggs with any soiling on them. 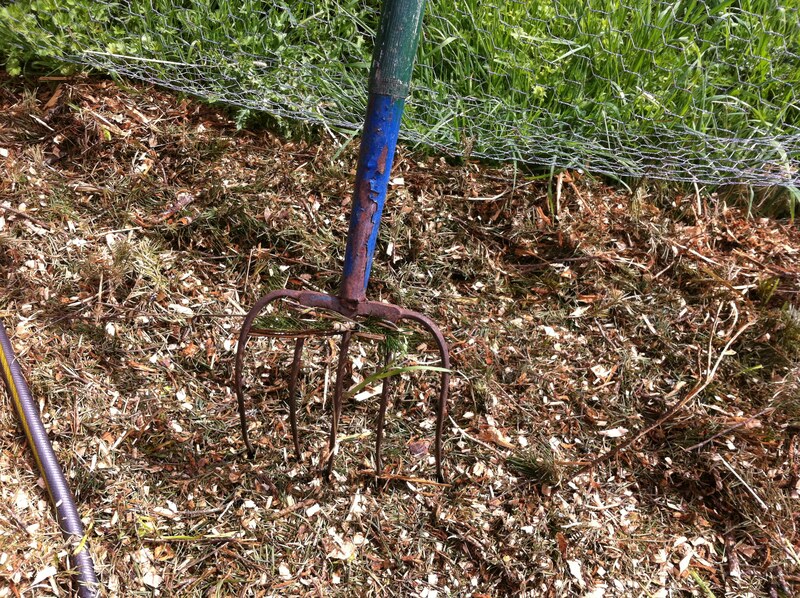 The Douglas Fir mulch lining the garden. That empty container is waiting for watermelon. Grape tomatoes, Roma tomatoes, etc. I’m getting quite used to using one of these. 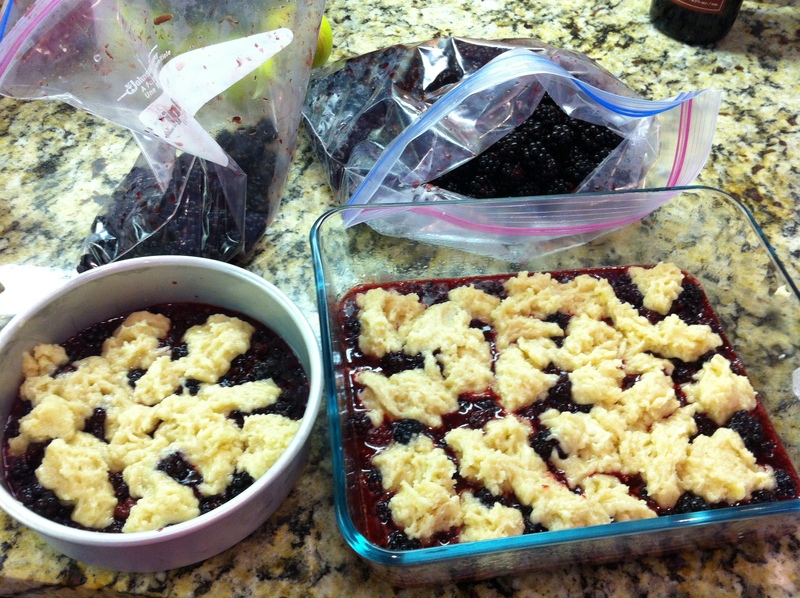 Well…it’s not fancy, but the veggies and fruit will be awesome nonetheless. I still have a few more things to plant, but it’s finally coming together! I really dislike it when “life” gets in the way. 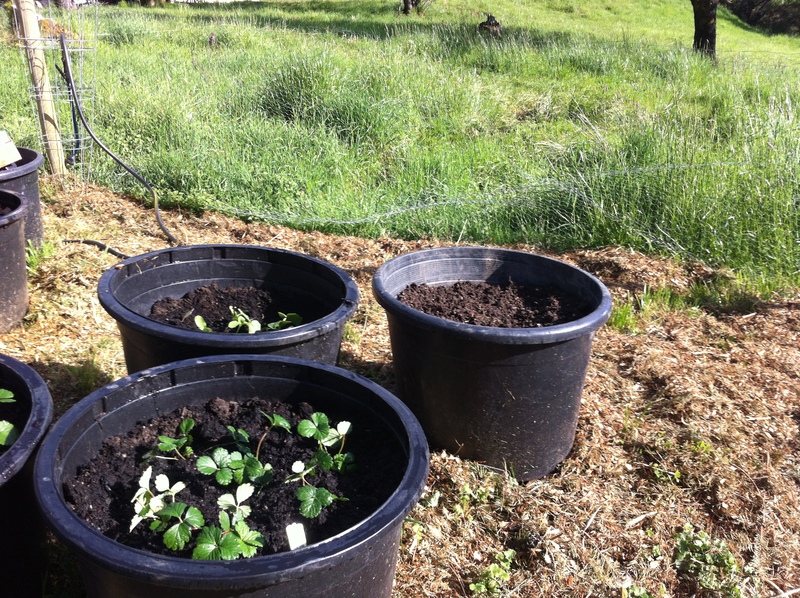 There is a lot to update on the farm…I will let the pictures do the talking. Riesling and her man Benedict! 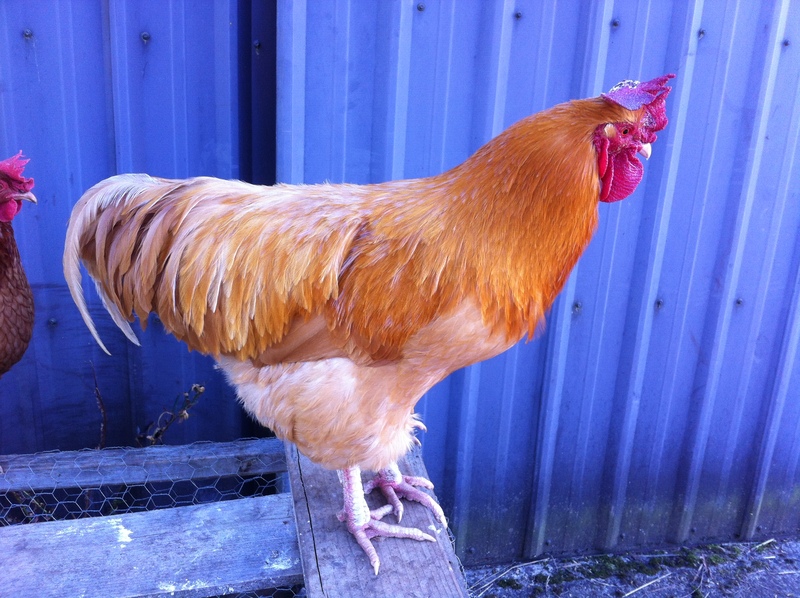 Jag….one of our Buff Orphington / Rhode Island Red mixed roosters…very handsome! Benedict checking out his progeny! 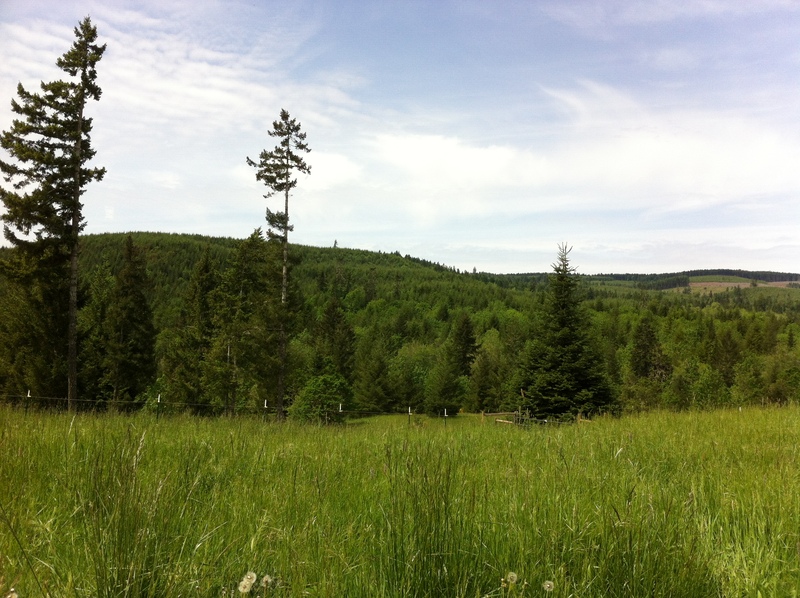 As the sun came out, so did those who inhabit this hilly forest….. The Muppets, testing their feet on the green grass. Hey Ma!!! It’s still a little cold out here!!! Penni watching over the youngest flock. The Muppets following mama with no boarders!! 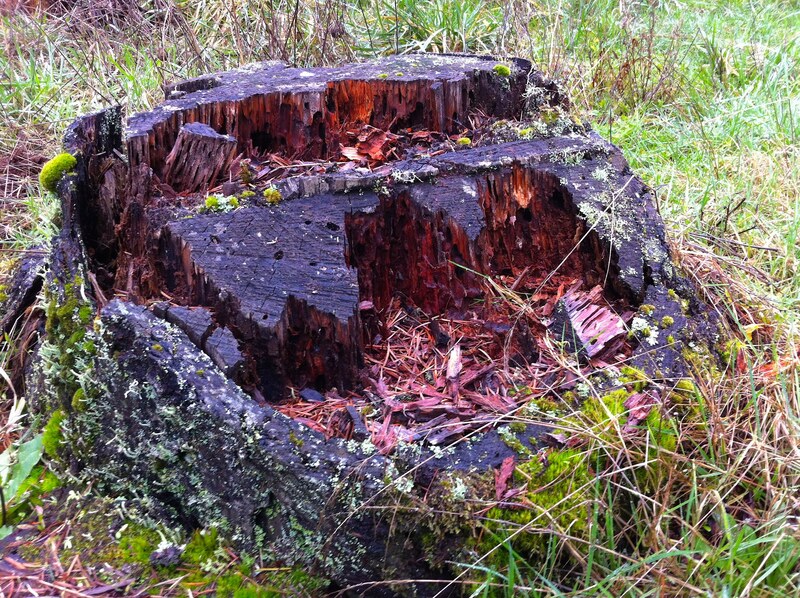 …and the trees decided it was time to make their long awaited appearance…. 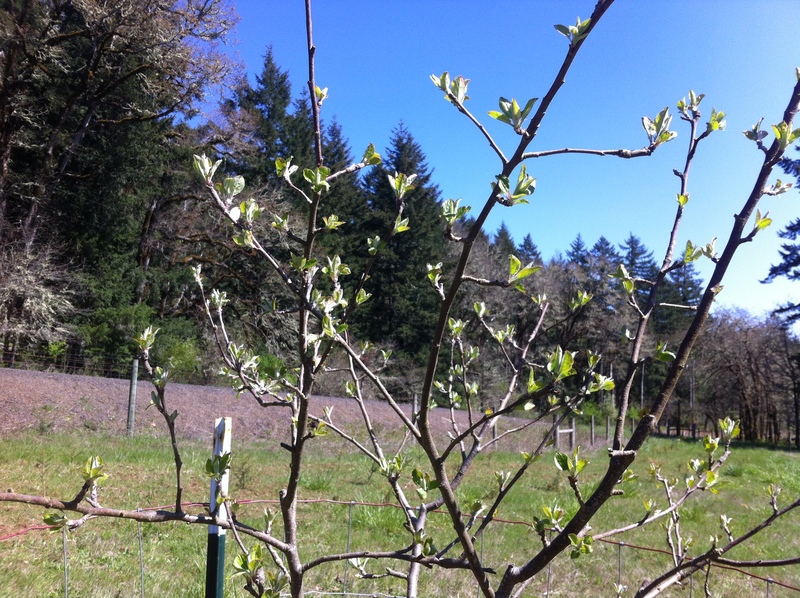 …but the Chestnut trees are still in that “groggy” state right before they wake up! 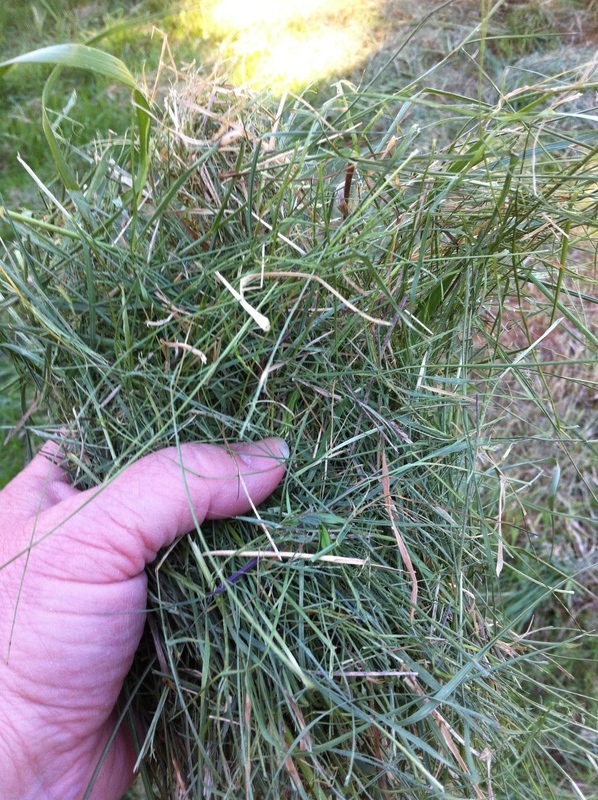 The first pasture’s grass needing to be mowed down is completed (only 8 more hilly acres to go…uuggh..but also 🙂 ….. 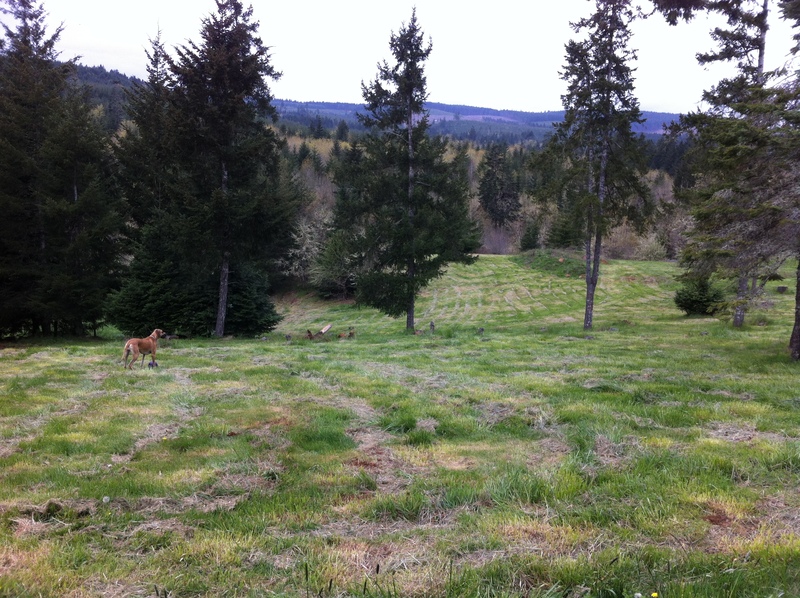 The back hillside is mowed….to be repeated at least 4 more times this season…. ….producing this lovely, lovely product…. Karli catching some rays in the warmth of a beautiful spring day. Hank, the cat, kicking back on Easter. 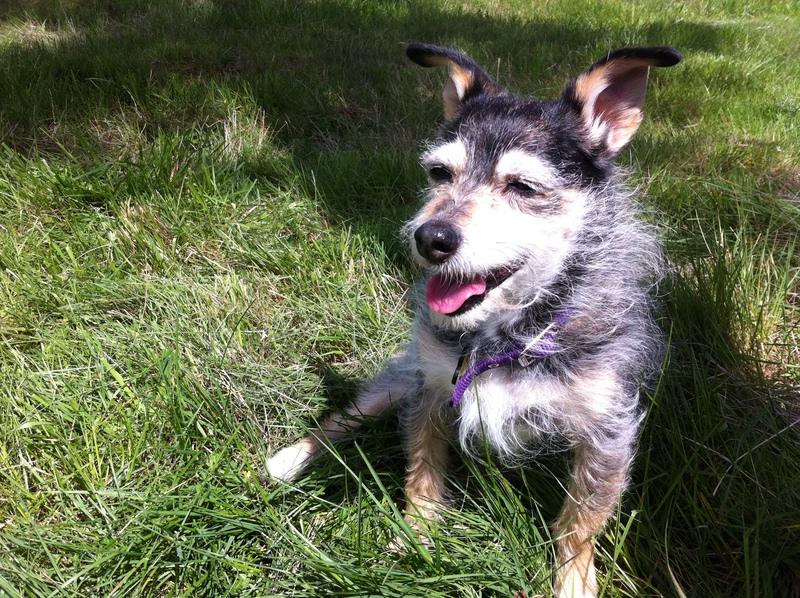 …but the epitome of being worn out due to excessive spring-like-I-can’t-believe-the-sun-is-out behavior goes to….Penni!!! I hope you all had a wonderful and blessed Easter!! 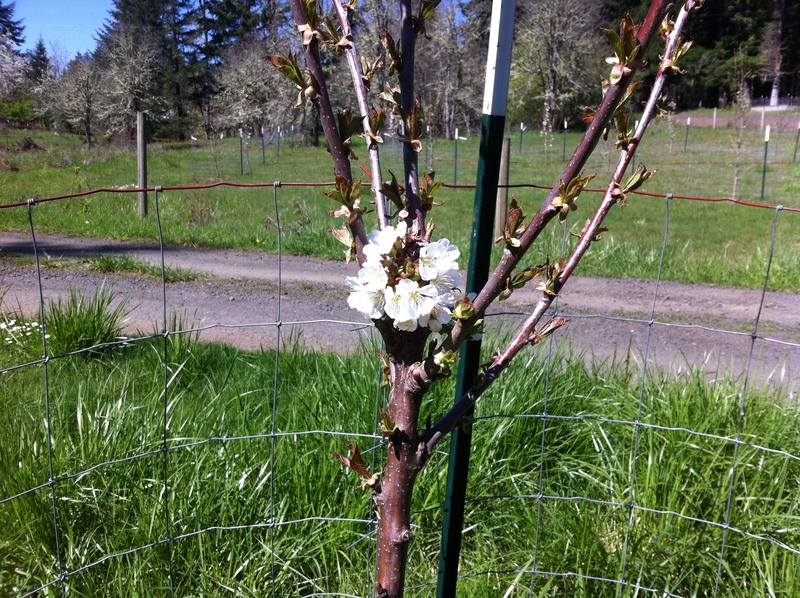 Enjoy the burgeoning springtime!!! When did this last string of rain start? I don’t remember…I think it has been the long side of a week. There are a few breaks here and there, but for the most part, big, fat, juicy drops have been falling constantly from the sky. Everything is soaked! Trying to keep dry from the sideways rain doesn’t work to well when there’s only one wall. 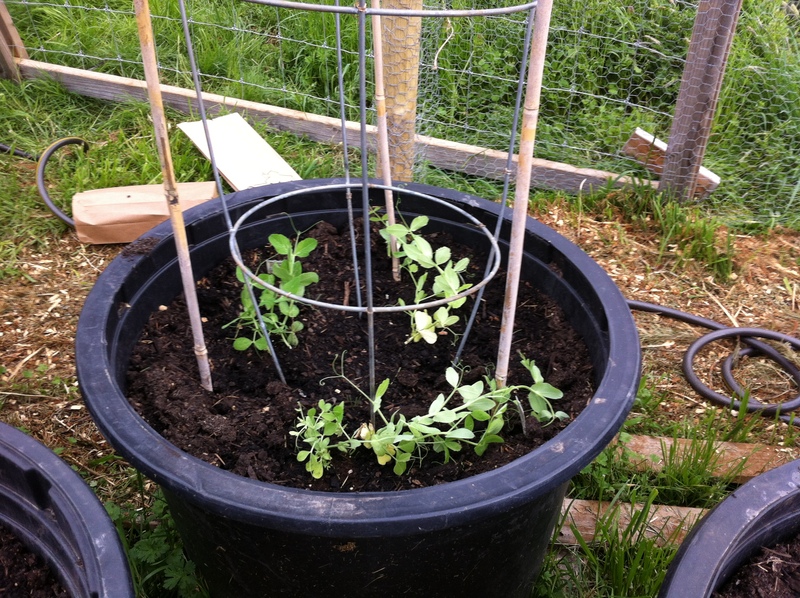 …and if rain is going sideways, it doesn’t keep them as dry as I would like. 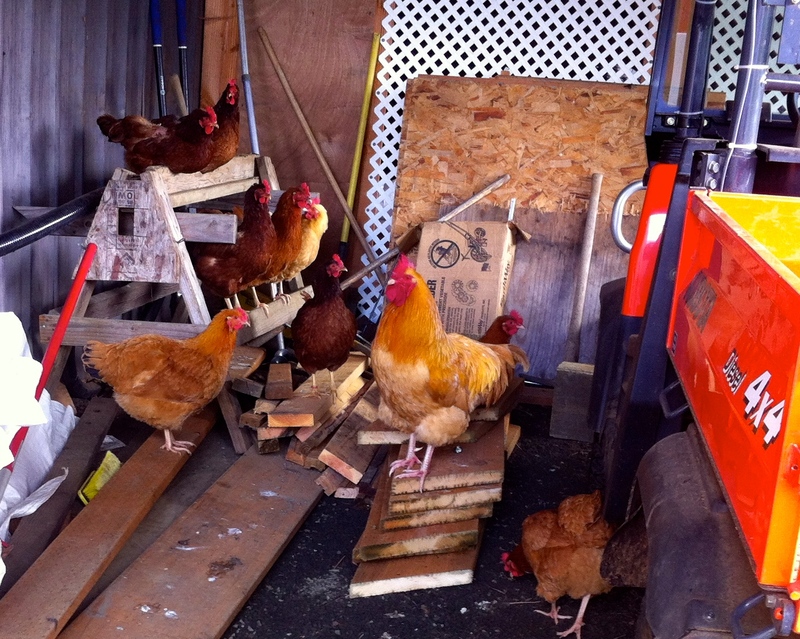 In a huge desire to freshen up the chicken yard, unfortunately, I dismantled their outdoor cabana a little too early. Wish I hadn’t taken down the cabana yet….well, at least the Lowes boxes are still one…hahaha! The Elders are much more refined in their rain behavior. 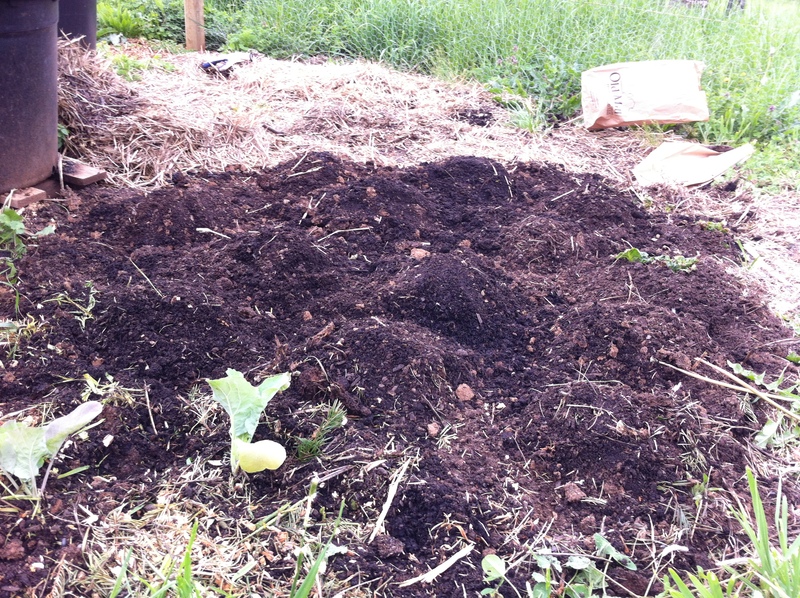 They find good cover, and stay pretty dry…..
They’re a bit wet from all the rain. 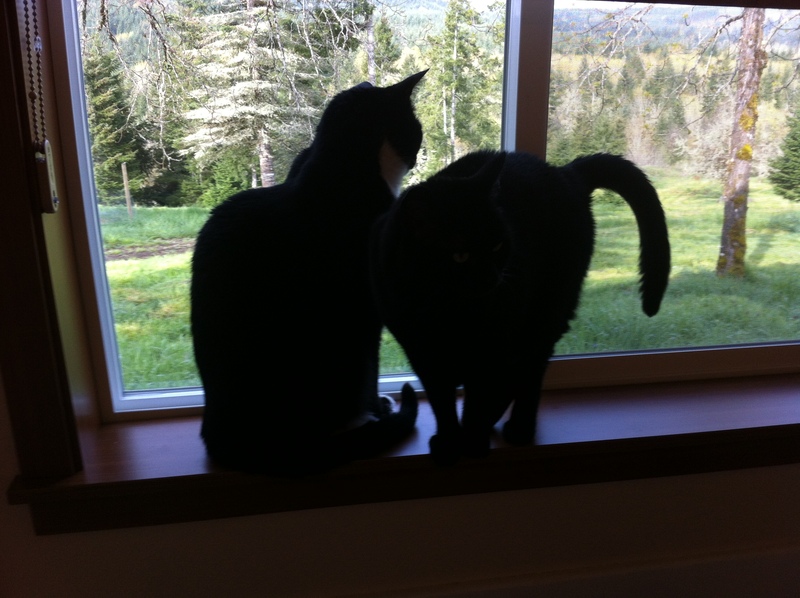 …so compare these two Littles, Pontiac (closest to front) & my man Austin, to Benedict and Claudio above…. 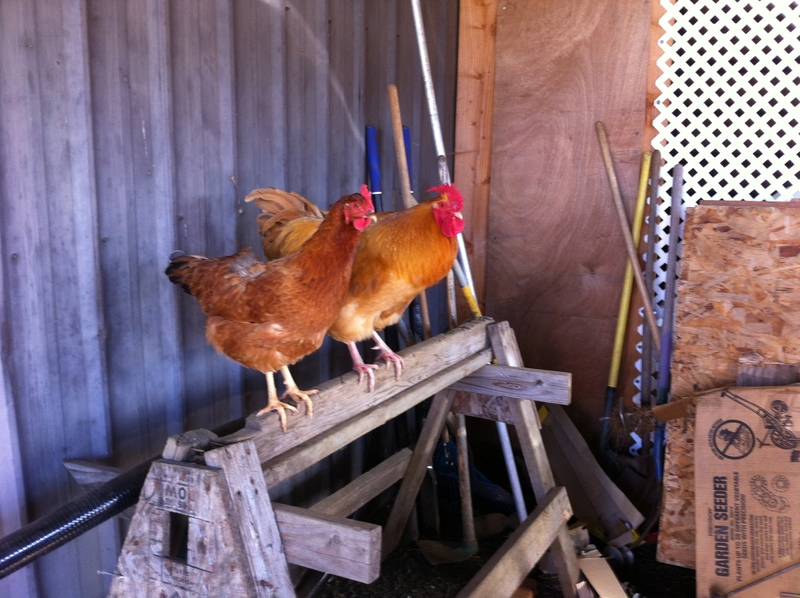 These two little roosters do not quite know how to manage all of this rain. 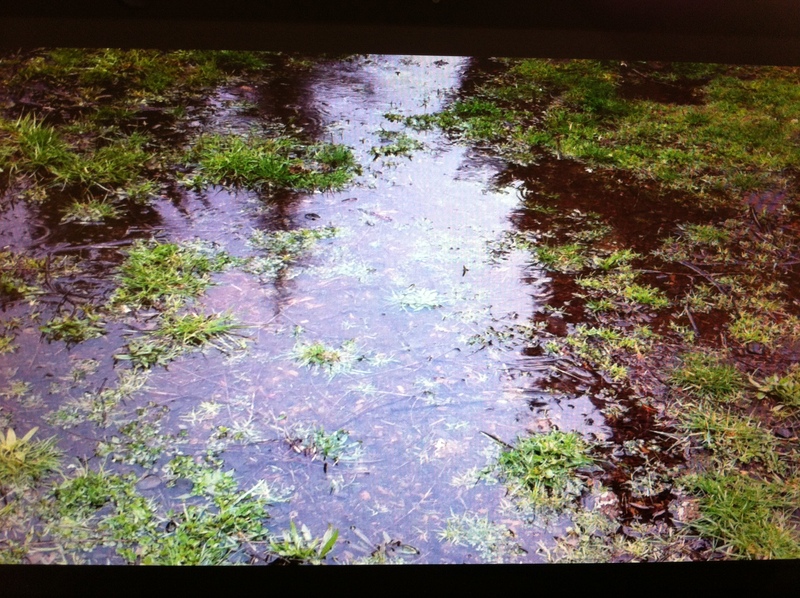 ….who do you think are more rain-challenged?? Everyone gets a good supply of cracked corn in the early evening to hopefully help them have a warmer night. Here’s a quick little video…it’s really quick….hope you like it. And the Muppets continue to grow. Want to follow this blog?? EBATES – Get paid to shop! From blank block to new home in Mandurah, Western Australia. ITS TIME FOR YOU TO BE HUNGRAY !!! 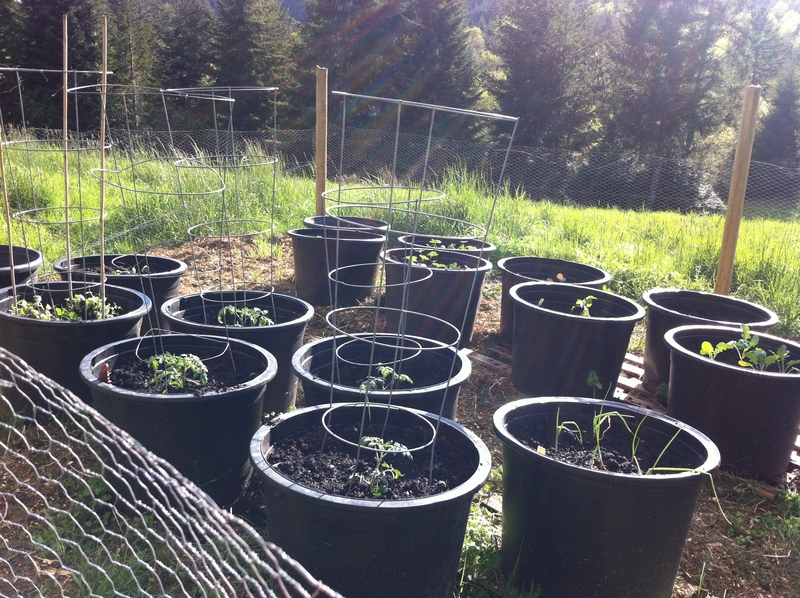 I'm a temporarily staying-at-home mom of two living in Oregon, learning all over again (after 15 years of city life) how to garden, harvest, and put up food. You might see posts about baking, parenting, crafting, organization - anything that strikes my fancy! Keeping the garden in the Garden State. Get your prep on...no matter what comes your way! 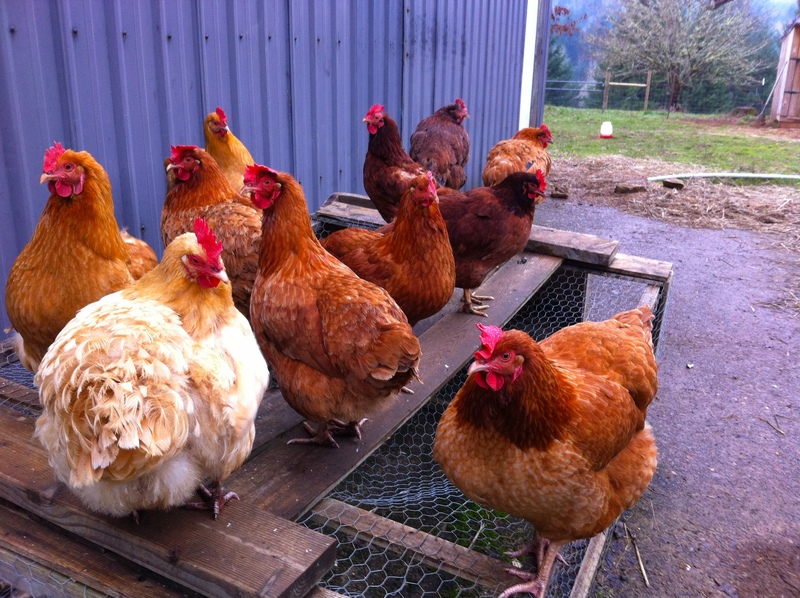 Happy hens lay healthy eggs!